For previous years' lists and commentaries, often incomplete, click: 2008; 2007; 2006; 2005; 2004; 2003; 2002; 2001. I seem to have lost the file for 2000. SCROLL DOWN for the 2009 CHECKLIST or use the menu below to jump to the COMMENTARY for each month. 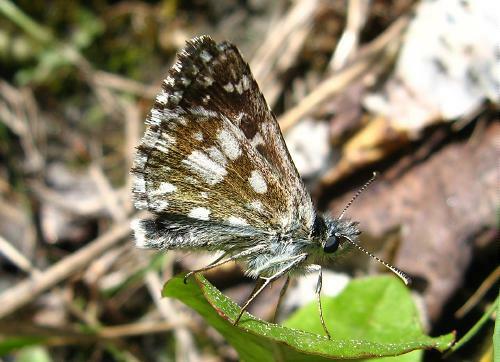 * There is now some doubt as to the identity of this insect, which might be a very small Pyrgus alveus (large grizzled skipper). 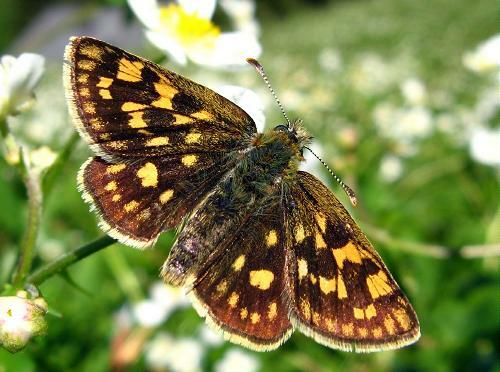 ** I shall change this numbering when/if I find undoubtable Oberthür's grizzled skippers later in the year!! 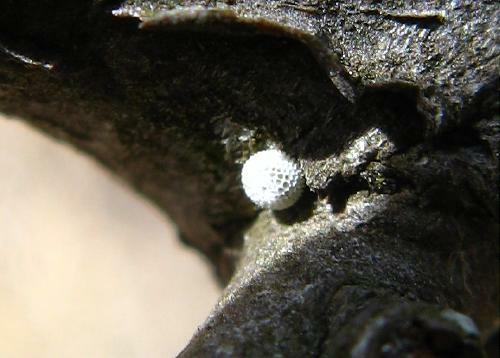 4th: It was bitterly cold but also brilliantly sunny by 9.00am this morning so I decided to go looking for brown hairstreak eggs in the valley. 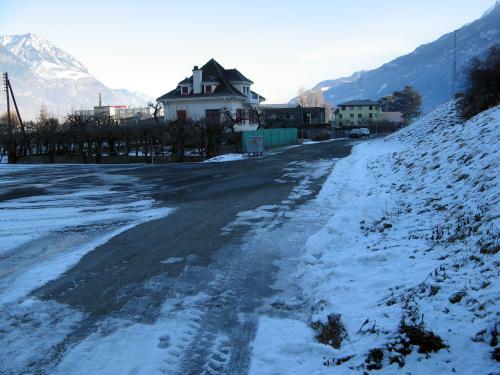 Here is Martigny when I arrived, shortly after 11.00am, still frozen! 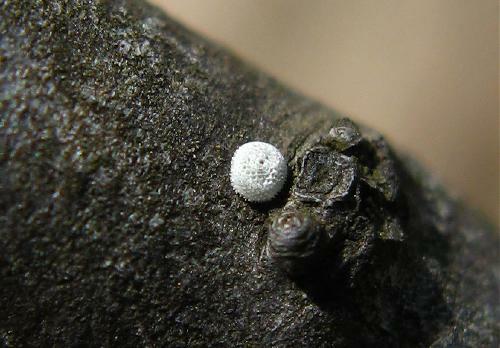 The trip proved fruitful though, with several eggs being found at one site before my hands got too cold and Asha and I just went for a walk. Here, here and here are three different eggs. 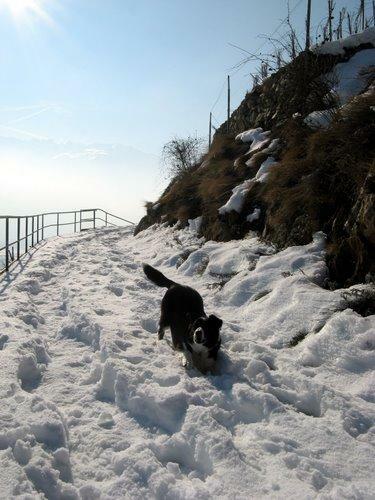 This is Asha heading home afterwards - despite constant sun, today never really warmed up. 17th: After a week of sun (no butterflies) it was sunny again today. 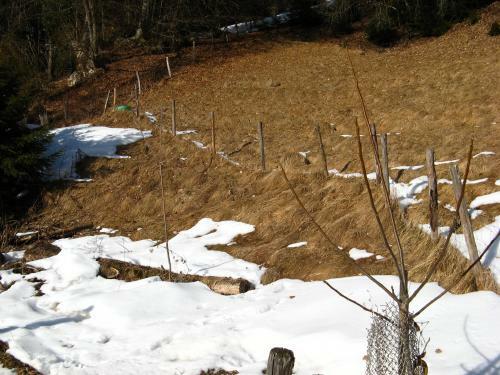 However, even down in the Rhône Valley it was still quite cold and there was no chance of anything being tempted out of hibernation. 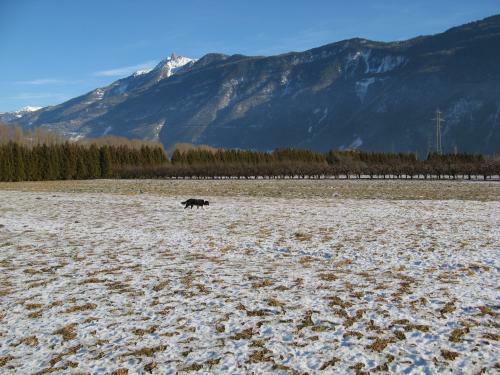 This is the valley floor, which appears not to have thawn out despite the fact it has not snowed since December. 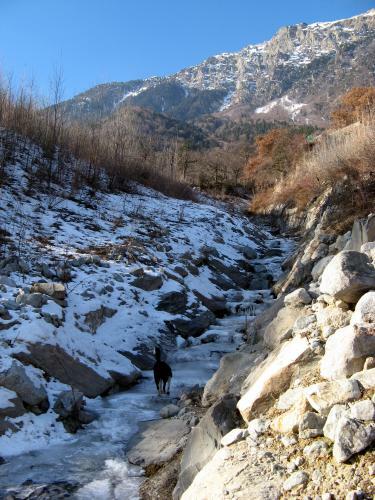 Here is Asha climbing a frozen river near what is in summer an iolas blue hotspot... 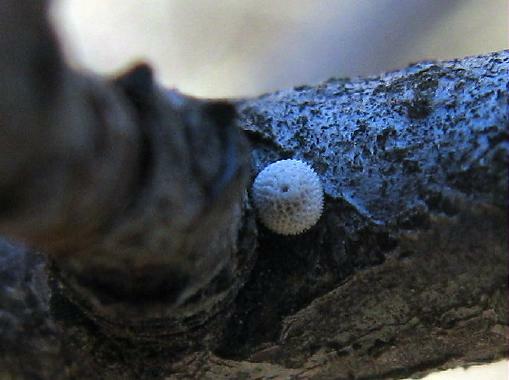 I found several brown hairstreak eggs in the same place as on 4th (new eggs). 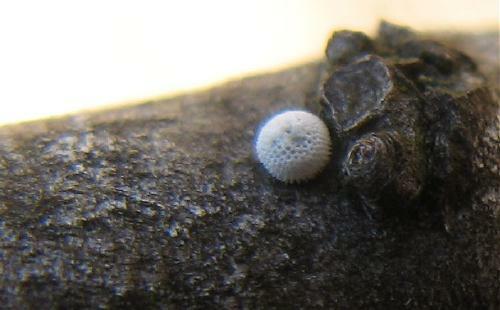 Here is another view of the same egg. 2nd: The Föhn is blowing today, rapidly melting ice and snow around Huémoz. 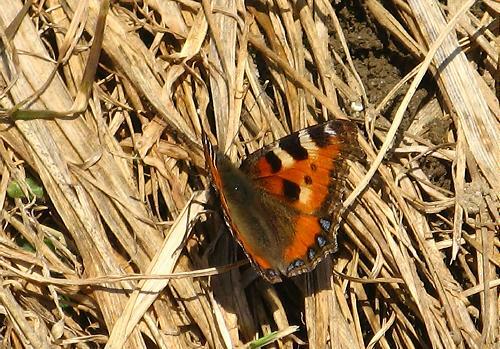 On my lunchtime walk I found a single small tortoiseshell that had been woken from its slumbers. 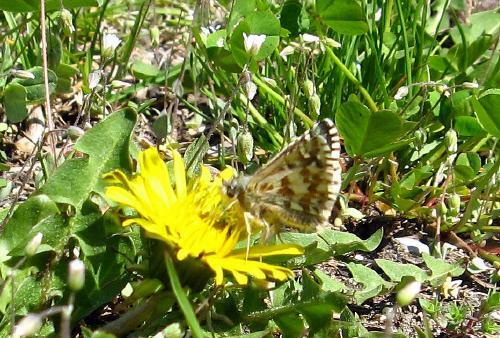 Here it is, in the same frame as some residual snow (the butterfly is on the bottom left of the picture...). This is the rather sheltered spot where it was flying. 3rd: A little cooler, but bright and sunny for the whole morning. 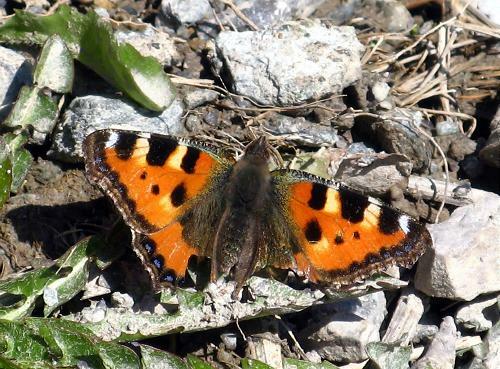 In late morning, three small tortoiseshells were flying at separate sites around Huémoz. 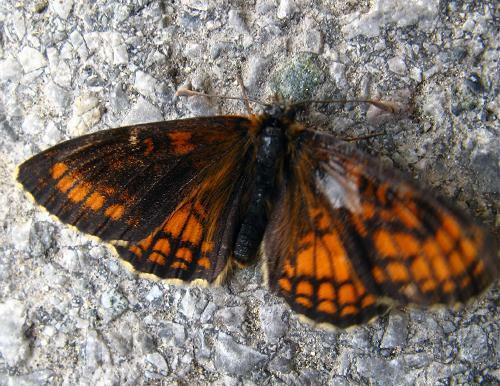 Here are the upperside and underside of one of them. 27th: After a cold and very snowy February it was mild today. 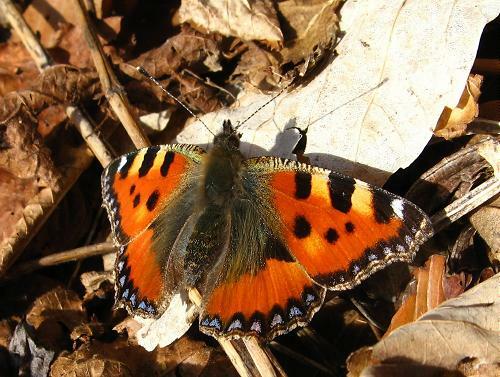 A single small tortoiseshell flew during my lunchtime dog walk. 28th: Very warm and balmy and although I worked all morning I found time to get down to the Rhône Valley for a couple of hours in the afternoon. 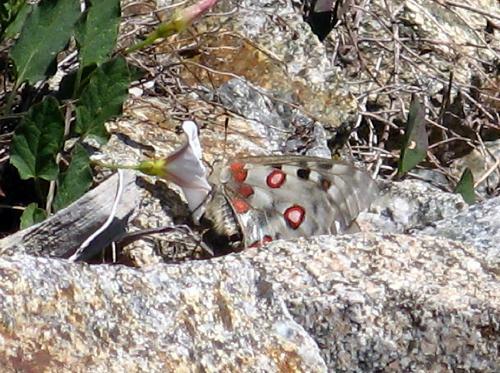 Plenty of insects were about, including honey bees and bumble bees, and lizards were zooming over the rocks. Crag martins were conspicuous in the skies. 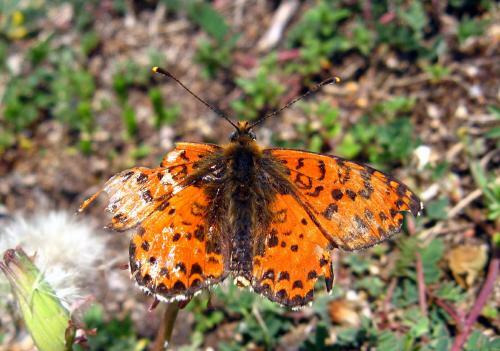 I saw 20-30 small tortoiseshells (here is one playing hide and seek with Asha) and this single Queen of Spain fritillary. 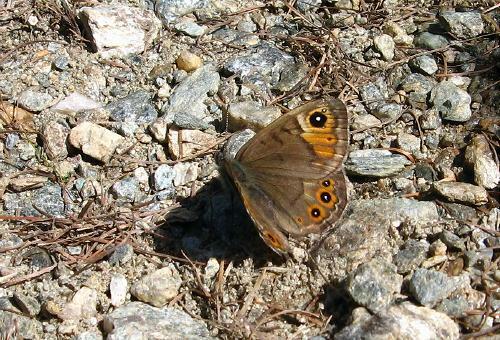 I was lucky to find and photograph it because there were many walkers and runners on the path. I suspect more were flying away from the beaten track. 1st: Mostly overcast but reasonably warm and occasionally hazily sunny. 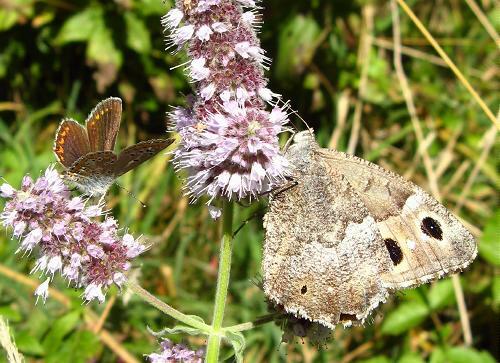 Two small tortoiseshells flying at different sites around Huémoz. 12th: After a lot more snow and some very cold weather it has been milder for a couple of days. Two small tortoiseshells seen on my short, lunchtime dog-walk. 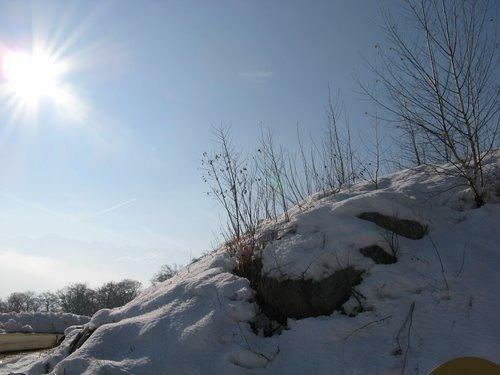 13th: A sunny day, though with a chilly wind in many places. 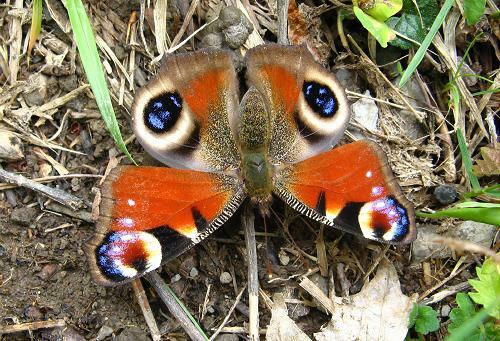 A single peacock on my lunchtime walk was my first of the year for this species. It flew right past me without stopping, so no photograph. 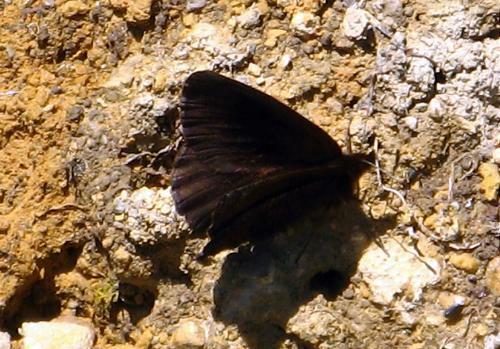 A single small tortoiseshell at a different part of Huémoz. 14th: Warm. I taught until 10.30, then went home (a single small tortoiseshell in Huémoz) and caught the train to the Valley, where I met Matt Rowlings. There, plenty more small tortoiseshells - at least 30 during the afternoon and probably more - and a single small white, my first of the year. 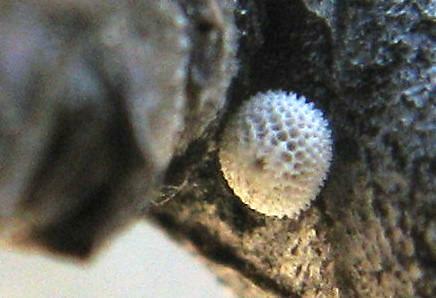 These brown hairstreak eggs (and here) were still dormant, waiting for the sloe bushes to come to life. 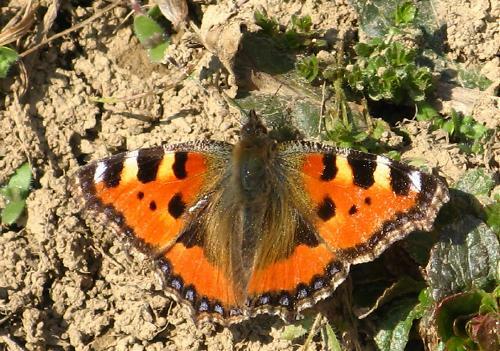 Towards the end of the afternoon we saw 4 large tortoiseshells, again my first of the season. Compared with recent years this spring is late, but I suspect it is actually a rather normal year! 15th: Cloudy morning but cleared up in the afternoon and was locally warm, despite a cold breeze. 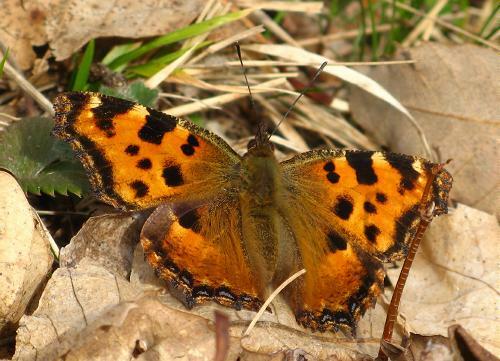 A single small tortoiseshell was flying near Huémoz and it was lovely to see my first brimstone of the year a little later, flying across the road ahead of me and into the sunlit woods, where I watched it for a while before it headed on. 16th: Very sunny but with a chilly wind making it feel cool. 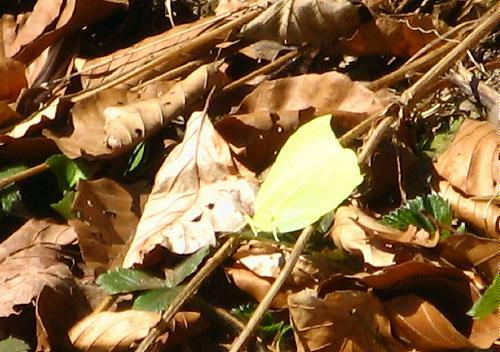 My lunchtime dog-walk around Huémoz/Les Combes produced 5 small tortoiseshells, all at different locations and almost certainly all different insects, a comma (my first of the year) and this male brimstone - I couldn't get close to it for a better photograph! 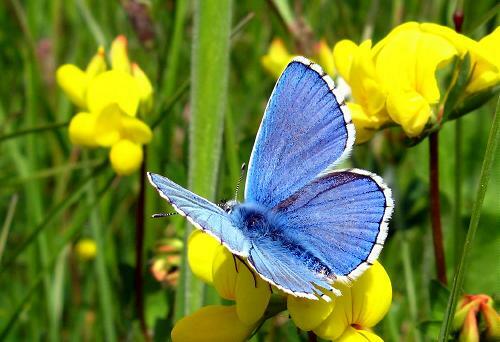 As yesterday, it was particularly lovely to see a yellow butterfly flying around the still largely colourless countryside. 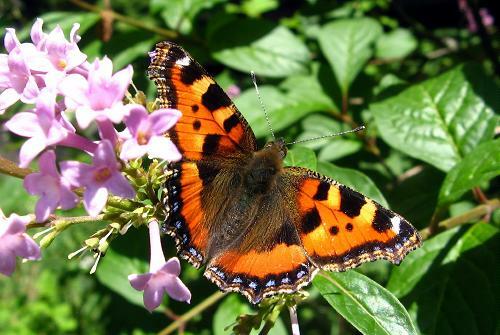 Back home, a small tortoiseshell became my first garden tick since moving into my new house in Huémoz last November! 17th: Took bus down to Ollon for lunchtime walk among the vineyards and pinewoods. 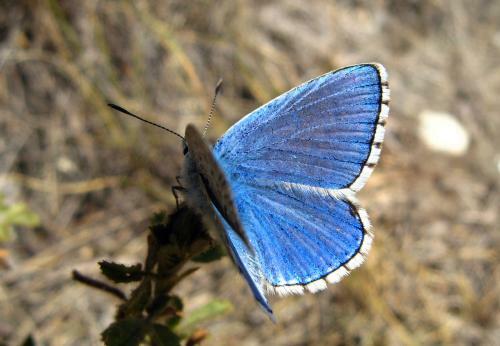 Surprisingly, though it was very hot, there were no more butterflies than are now flying around Huémoz. 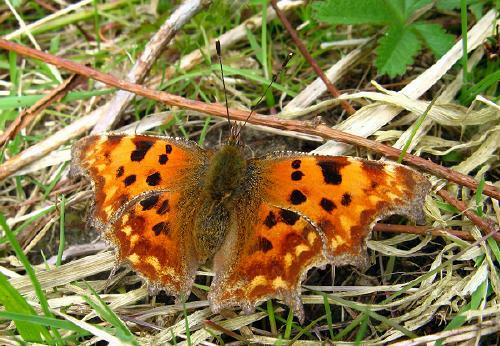 Small tortoiseshells were locally common and I saw a male and a female brimstone at two different places. Apart from that, there were a couple of peacocks basking on the sunny banks of this lane. 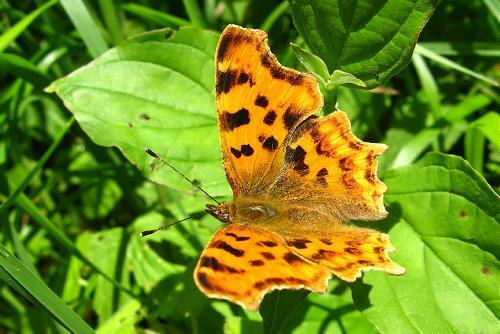 18th: Lunchtime walk around Huémoz: Small tortoiseshell frequent, as well as a single comma and a single male brimstone. 19th: Bright and sunny, but chilly. 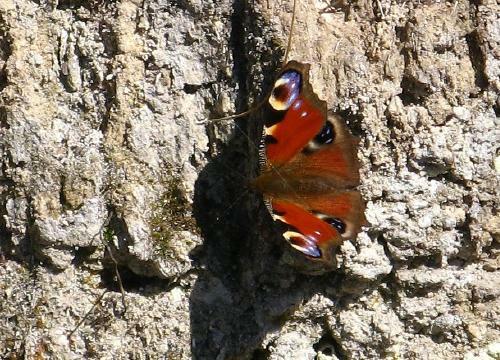 Only small tortoiseshells seen on my lunchtime walk. 20th: Hot sun, cold wind - actually very cold! 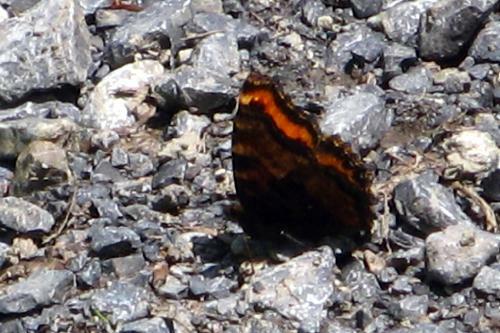 A single small tortoiseshell seen on (rather short) lunchtime walk. 21st: Bright again, but another bitterly cold wind. No butterflies seen on lunchtime walk. 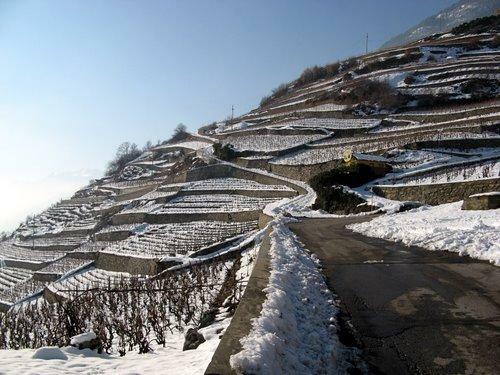 22nd: Sunny again, but even in the Rhône Valley there was a cold wind and little flew. 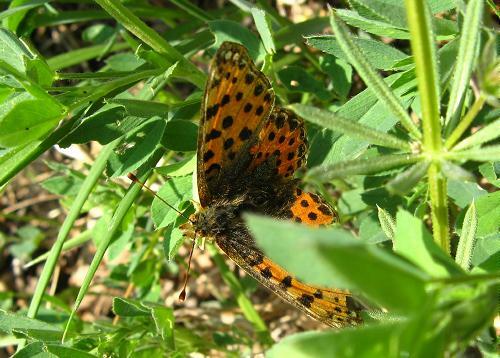 Small tortoiseshells were quite numerous and Queen of Spain fritillaries were very numerous (here is one on the foodplant, heartsease) but I found nothing else. 24th: Here is my garden on the morning of 24th. 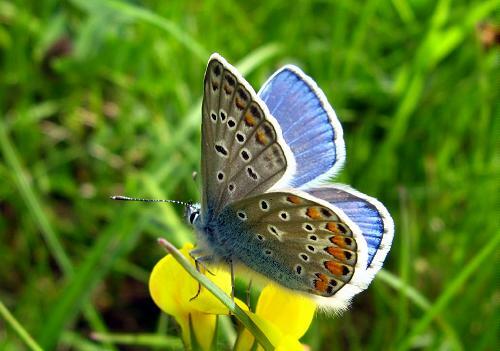 No possibility of butterflies flying today! 31st: After a cold week (and weekend) it was finally sunny today, though with a chill wind. 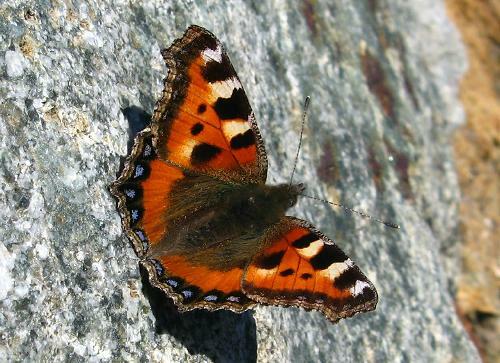 Despite the wind, a few small tortoiseshells were out and about in Huémoz and also a peacock, near my house. 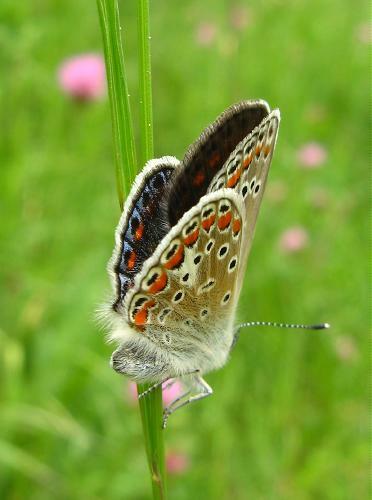 Later (about 4.30pm), I saw a single peacock in Ollon. 1st: A bright and breezy day in the Rhône Valley, despite gloomy forecasts (overcast and rainy, they said). Expecting it to cloud over any moment, I zoomed round my regular loop, not stopping for many photos, but the weather actually held out until at least 2.30 pm, when I started to head home (the breeze was getting chiller and the clouds thicker). 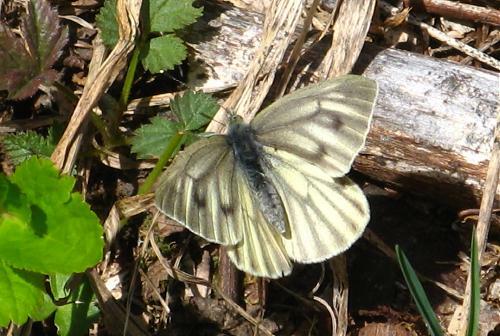 My first new species for the year was green-veined white, which was visibly present everywhere, but not yet really common. 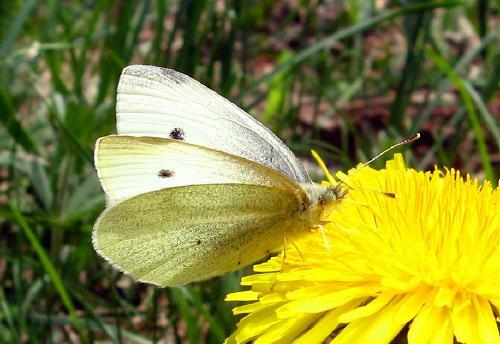 Small whites were frequent too. 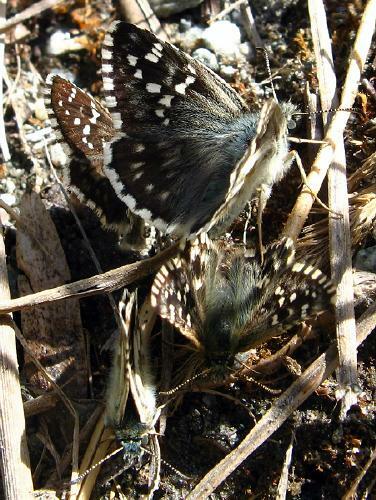 There were three or four grizzled skippers at one site, with males sparring for territory, spiralling into the air. 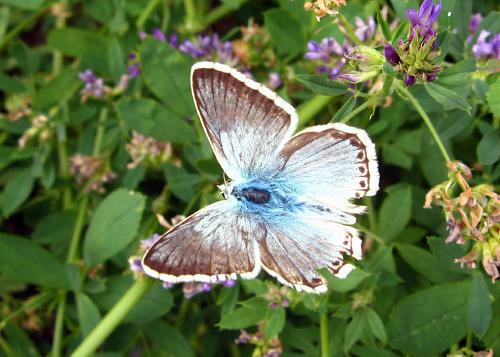 Here is another, though this one does look like a female. 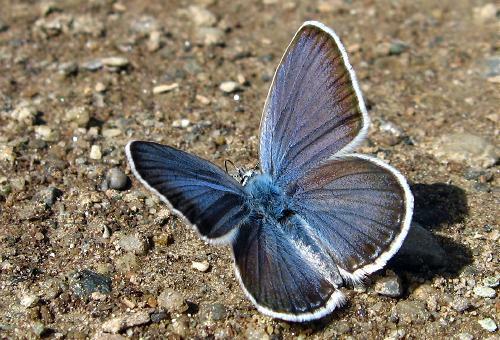 The biggest coup of the day, though, was a Camberwell beauty, which appeared apparently out of nowhere (my dog or I must have put it up), flapped vigorously at us for a few seconds, then settled momently (not long enough for a photo) and cruised away. We waited for it to return but it didn't. A great sight nonetheless, especially as I haven't seen one at that particular place before. 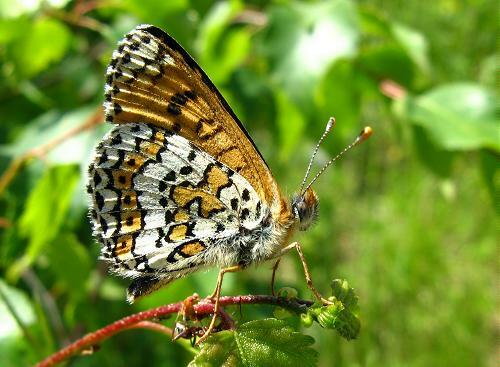 Small tortoiseshells and Queen of Spain fritillaries were common, the latter being easily the commonest butterfly on my walk, and I saw a single orange tip just before I came home. Sadly I didn't have time recently to concoct a fake picture, so there is no amusing 1st April joke. Sorry. 2nd: Flew back to UK and home to Suffolk, arriving in late afternoon sun. But no butterflies. 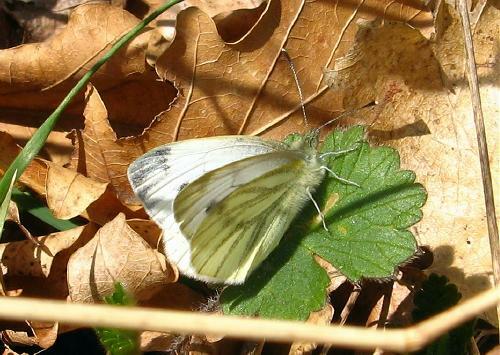 4th: Saw a single small white whilst on drive to Rendlesham forest. There, a couple of peacocks and a comma (here is the same comma). 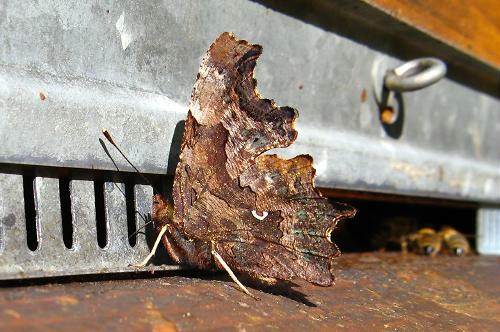 Back home, another comma in the garden and this peacock. 5th: In the morning, cycled to woods near Woodbridge, Suffolk. Peacocks were common there, sunning themselves, nectaring on sloe (predominantly) and sparring or flirting. 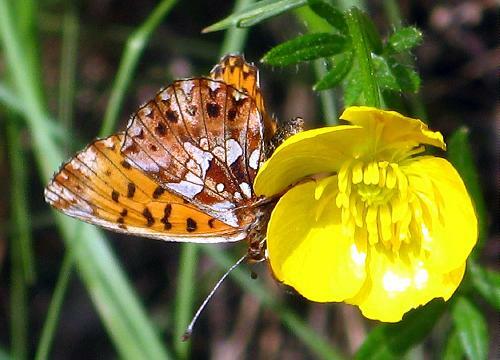 I also saw several commas, a single small tortoiseshell, green-veined whites and small whites and a single orange tip. 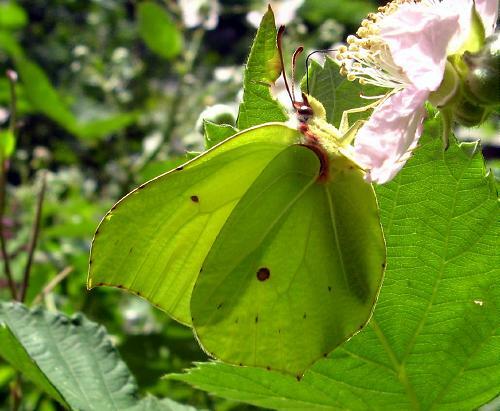 At least one male brimstone was cruising up and down the rides - I saw a brimstone every five minutes or so but have no idea how many there were. 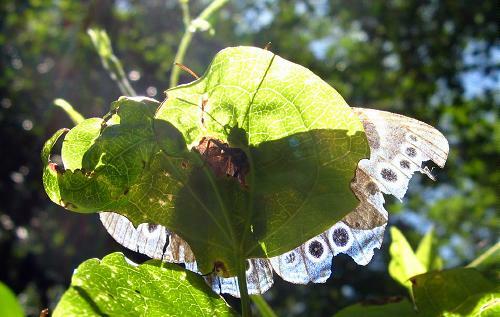 Back home, peacocks were the dominant butterfly in the garden, though my dad had seen a brimstone while I was out. In the afternoon we found plenty more peacocks along the coast, at Shingle Street - at least a dozen, in the lee of the sea wall, all very active but also spending plenty of time nectaring. 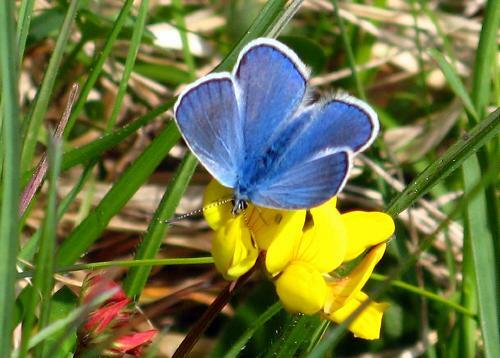 A really good early spring day's UK butterflying. 6th: Morning cloudy, but small white (possible large white too) and comma flying in the garden at lunchtime. In the afternoon, plenty of peacocks flying at Bawdsey, on the coast, frequently settling on the shingle. 7th: Mostly cloudy, with some sun. Single peacock in morning, at Bromeswell. 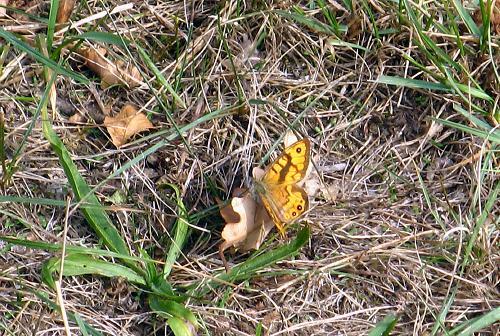 Small white, comma and peacock in garden later, and several peacocks near Rendlesham in afternoon. 8th: Still in bright and breezy Suffolk. Peacocks common in every habitat. 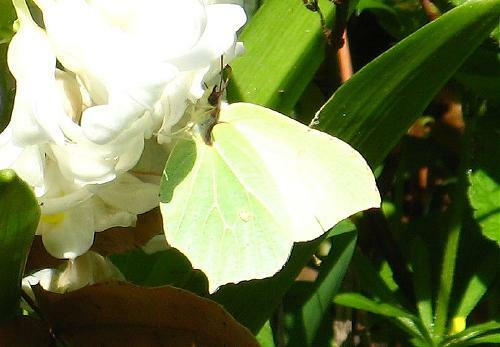 A couple of brimstones in my garden, including this female (here she is showing the female colours more clearly), and brimstones and commas at several sites. 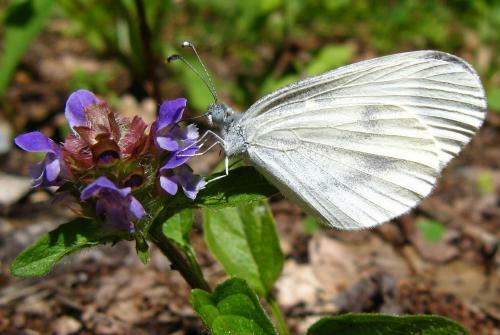 A female small white in the garden. 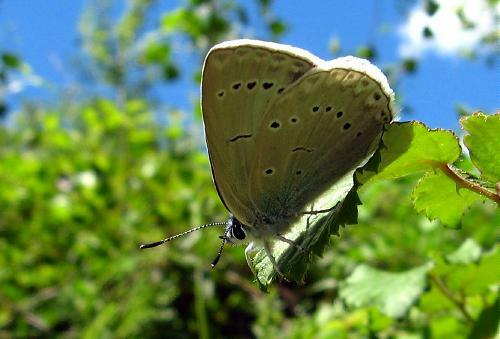 Still no hint of holly blue, small copper or speckled wood. 9th: Morning cloudy but afternoon walk at Rendlesham warm and sunny, amazingly! 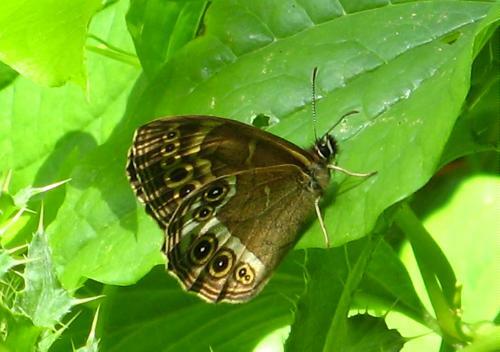 The only butterflies to be seen were peacocks. 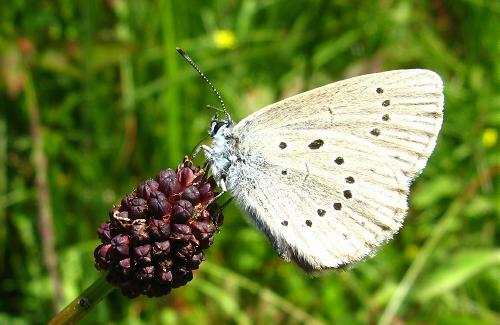 A single small white back home. 10th: Good Friday. Warm and sunny, though a little windy, all day. 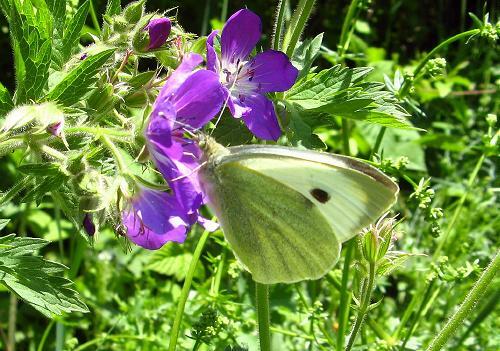 In the morning, bicycle trip to woods near Ufford produced lots of peacocks, as usual, plenty of commas too, and small and green-veined whites. To Minsmere in the afternoon, where commas and peacocks were flying. Plenty of bitterns heard booming and a couple seen briefly in flight over the reeds. Marsh harriers out in force - up to four visible at once. A lovely day. 12th: Back in Switzerland. Today, Easter Sunday, was warm but hazy. 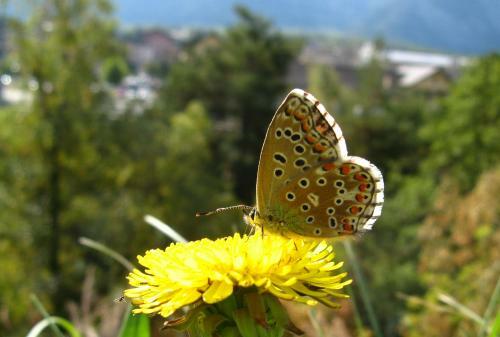 At the altitude of Huémoz very little was flying. 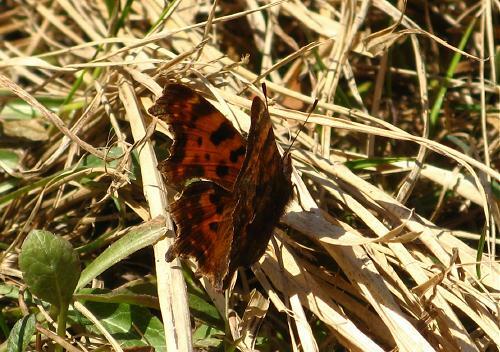 My afternoon walk produced just two small tortoiseshells, a comma, a small white and my first wood white of the year. 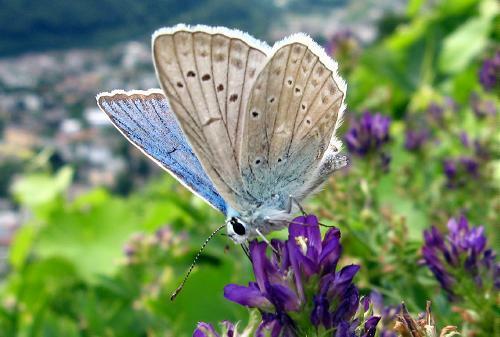 13th: A lovely walk in the Rhône Valley, during which I saw 25 species of butterfly. 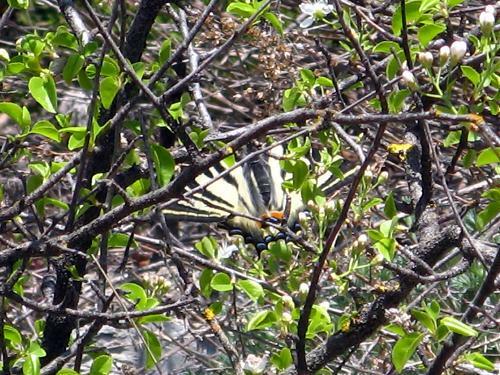 Almost immediately after getting off the train I saw my first scarce swallowtail of the year, quickly followed by plenty more. They were all flitting around Prunus bushes and resting only for very short periods of time, hence this awful record shot! 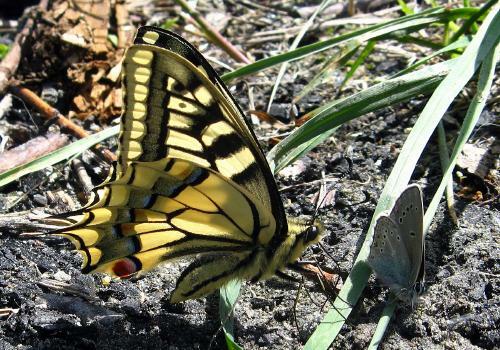 Later on I saw two swallowtails, at a different location. 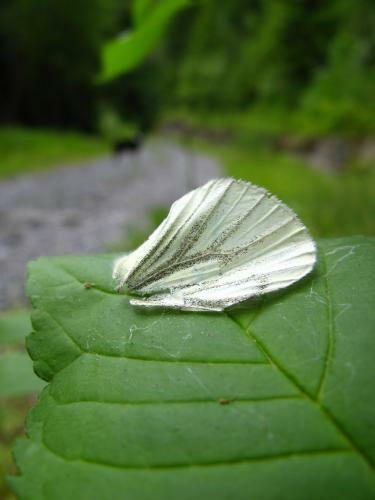 Bath whites were quite numerous, all heading busily east along the path in the morning and apparently never stopping. 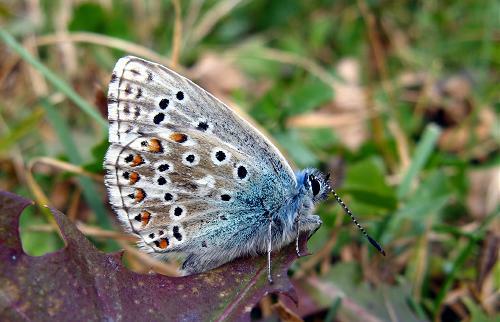 This one was photographed in the afternoon, as I returned, when they were more obliging. 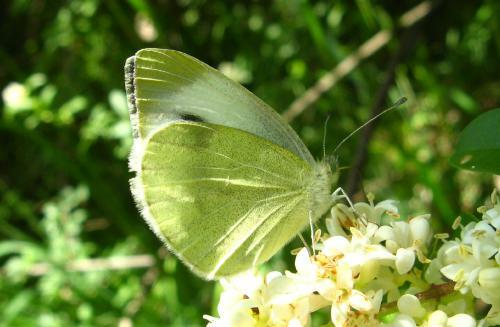 A few large whites were around, but small and green-veined were far commoner, with wood white now ubiquitous. 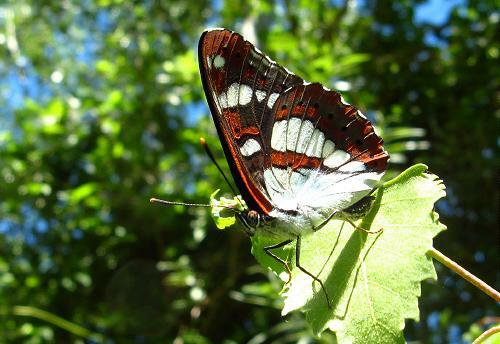 Orange tips were common, males outnumbering females by some considerable amount. 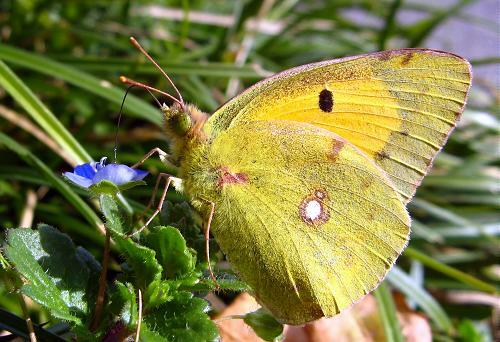 Berger's pale clouded yellows were common (the female photographed has a damaged wing, but she seemed to be having a good time), but I only saw one clouded yellow - a male. 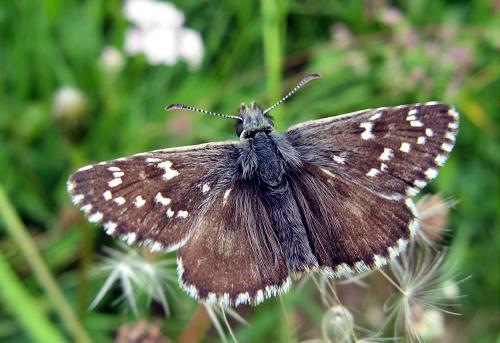 The first dingy skippers (here's another shot of the same individual) were on the wing, as well as mallow skippers, and at one site there were two or three (perhaps more) rosy grizzled skippers flying with grizzled skippers. 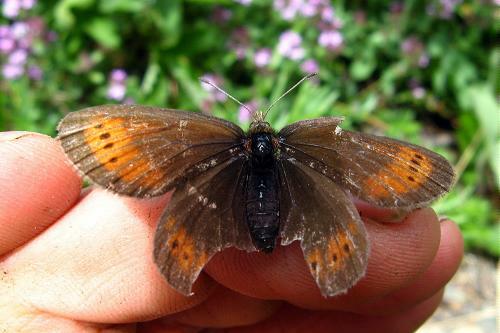 Here is a rather bad photo of a rosy grizzled underside. 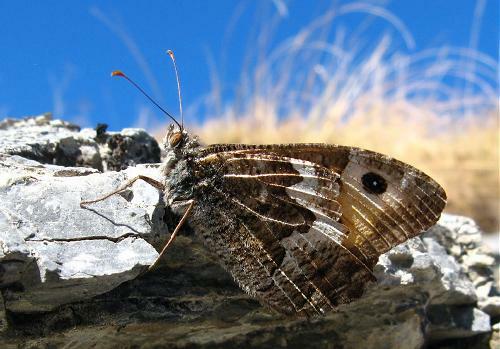 Grizzled skippers were quite common throughout the walk. 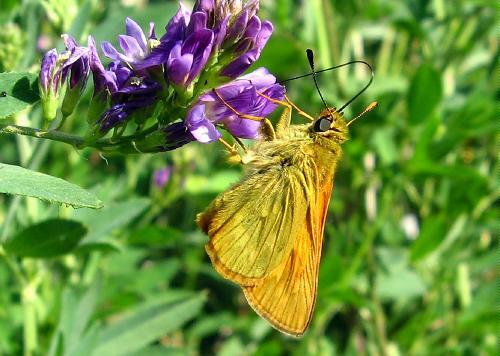 A possible safflower skipper was seen too poorly, and in flight, to count. 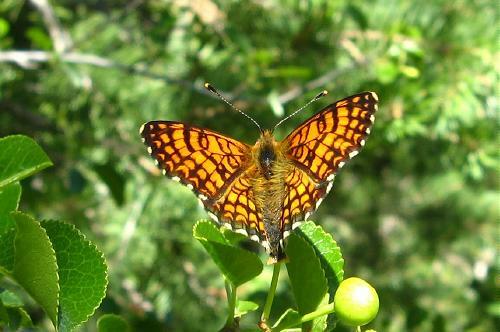 Violet fritillaries were locally very common and queen of Spain fritillaries also quite prominent. 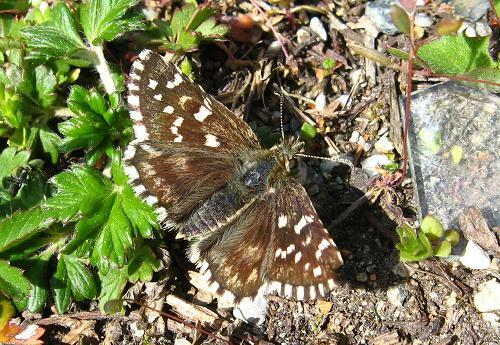 In shady parts there were plenty of speckled woods and the first few small heaths - 5 or six, probably - were flying at one site. 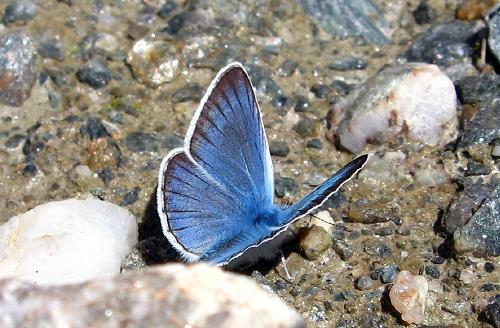 I was pleased to find at least 4 baton blues, and here (here's a movie of a baton blue taking minerals - the breeze was only gentle but this is a tiny butterfly! 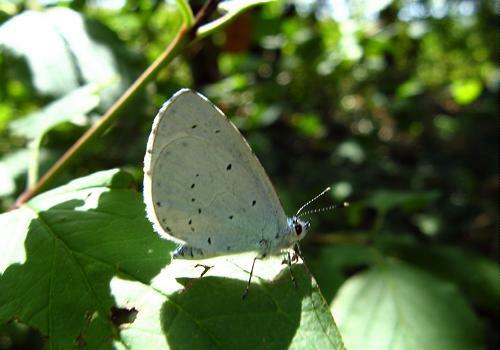 )and to get my first holly blues of the year. 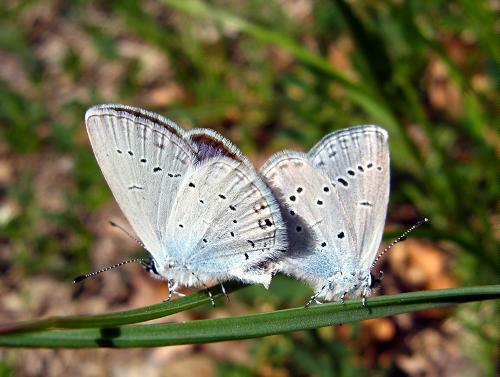 Apart from one possible Everes blue, in flight, these two species were the only blues flying. 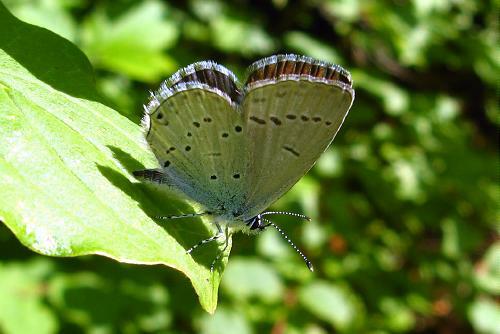 I checked as many as I could, and I don't think there were any green-underside blues among the hollies. 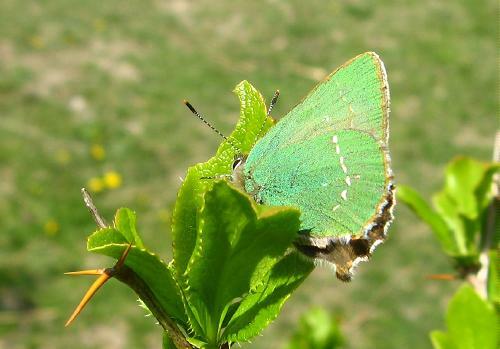 At about 3.00pm I saw my first and only green hairstreak of the day - a very eager chap, probably a male looking for a suitable place to set up a territory. Peacocks were frequent throughout the walk and small tortoiseshells present, but not numerous. 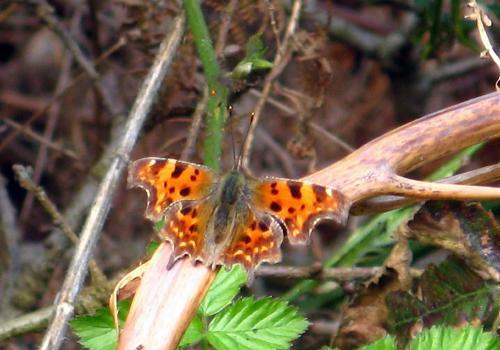 I saw two or three commas - difficult to tell how many because they were being rather territorial. 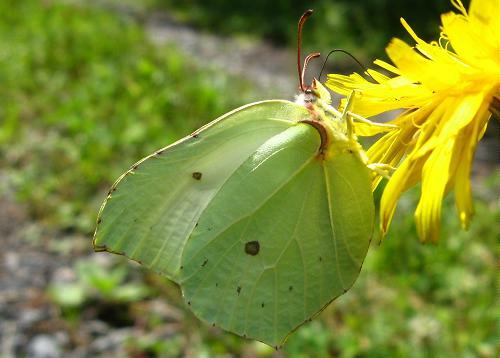 Finally, near Aigle, I saw my 25th species of the day - a male brimstone, flying along the roadside. 14th: Last day of the Easter holidays, so I spent it in the Rhône Valley again, at different sites from yesterday. Good weather much of the day, but with a lot of cloud in the middle, stopping things flying. 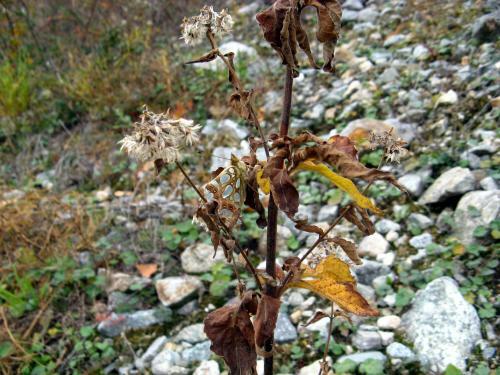 Despite this, I found 6 new species for the year and plenty else besides (a total of 26 species). 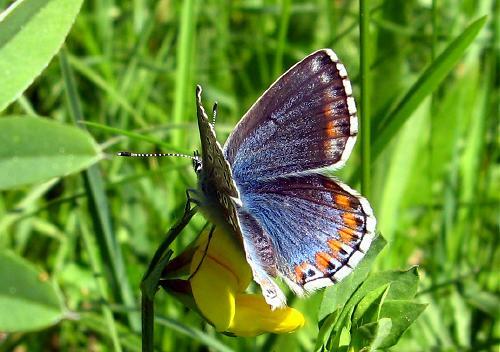 The biggest surprise was this chequered blue, just a day later than last year and only two days later than 2007, when there wasn't a winter. Here is an underside. It was the only one I saw, but when I went past the usual early site it was overcast, nothing was flying and I didn't even check. 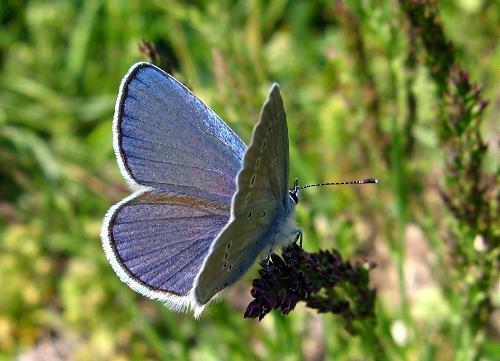 I had hoped for an early short-tailed blue but Everes is apparently still not really up and running yet. 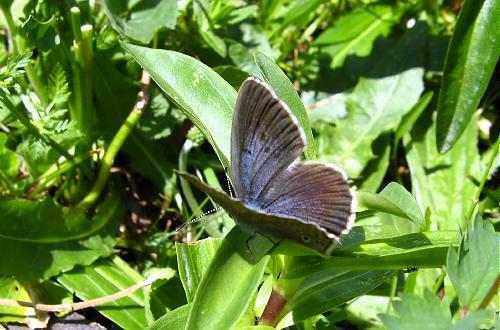 This single Provençal short-tailed blue was the only individual of the genus I found. 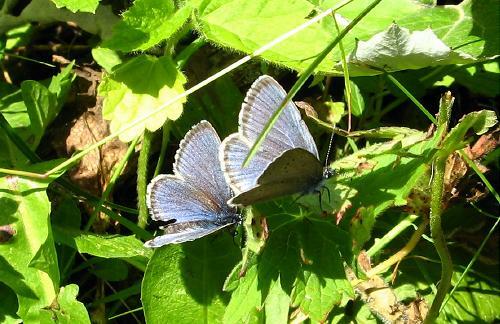 In contrast, green-underside blues were quite frequent - I think I saw about 10, though some could have been repeats. 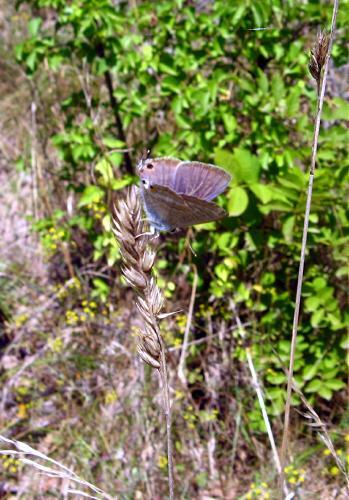 A very few little blues were on the wing. Here is another shot of the same individual. 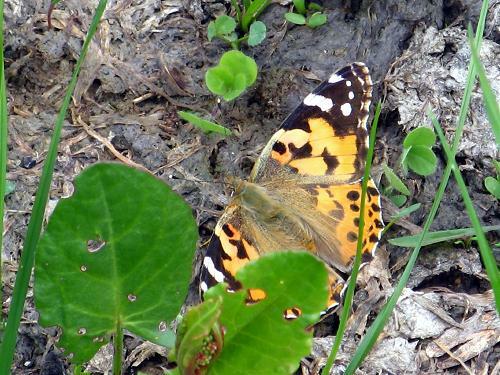 I saw two painted ladies at different sites, neither looking at all fresh. They didn't stop for the camera but I did catch this quick snap of one as proof of seeing them. 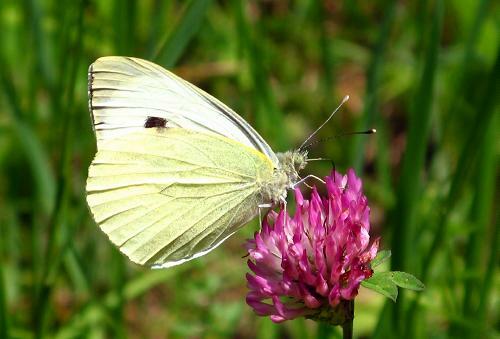 Southern small whites were locally frequent, but not obliging the camera either! 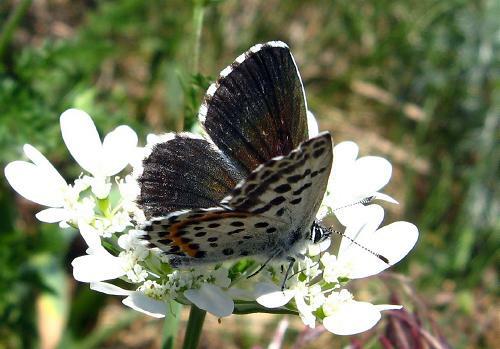 Other than these, there was a single swallowtail, a single scarce swallowtail, a single large white and plenty of small whites and green-veined whites. 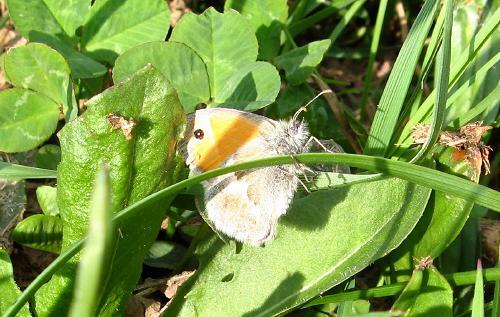 Wood whites and orange tips were common. 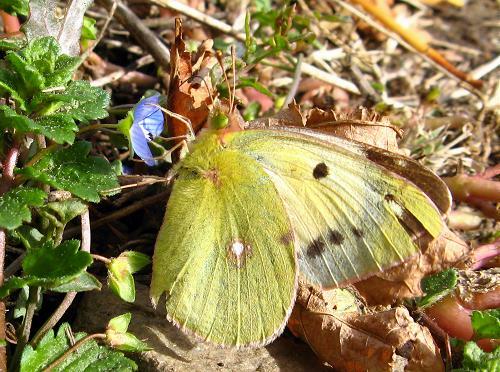 Berger's pale clouded yellow was common, while again I saw just a single clouded yellow. 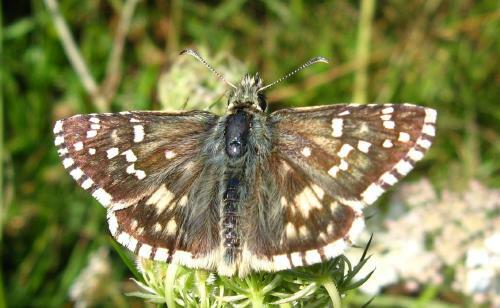 Grizzled skippers easy to find but not really numerous, dingy skippers very well established and a few mallow skippers. 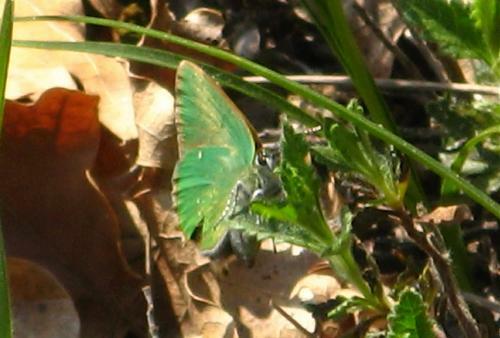 This green hairstreak was annoyingly mobile and this is the best shot I had at it! 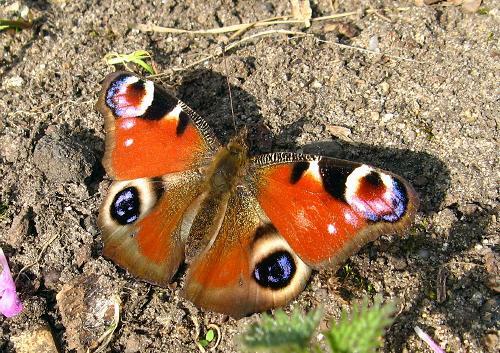 I saw a single peacock but quite a few small tortoiseshells - well down on their numbers earlier in the year. 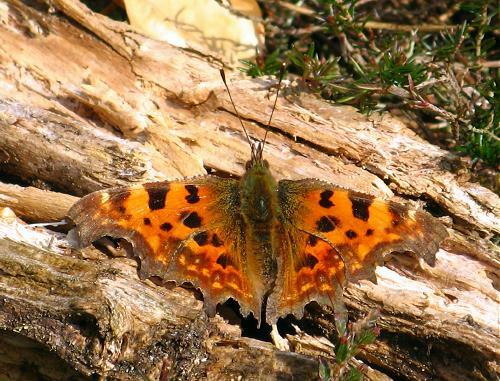 Also a single large tortoiseshell and two commas. 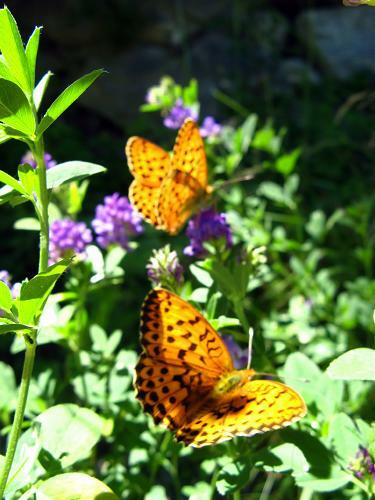 For the fritillaries, Queens of Spain and violet fritillaries were both common. 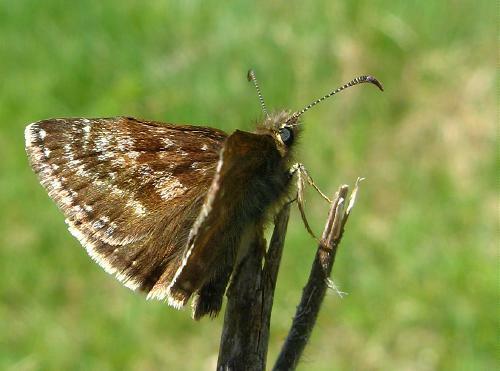 Finally, when I got back to Huémoz in the late afternoon I found this small heath skulking in the local meadows, as well as several small tortoiseshells. 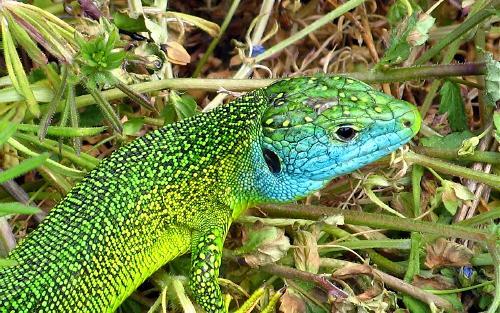 Oh - and I mustn't forget this green lizard that, most unusually, I managed to spot before he spotted me!! 18th: Overcast and sometimes wet weather for last few days but some butterflies flying today: small tortoiseshell, wood white and small whites around Huémoz. 19th: Mostly cloudy and cold. 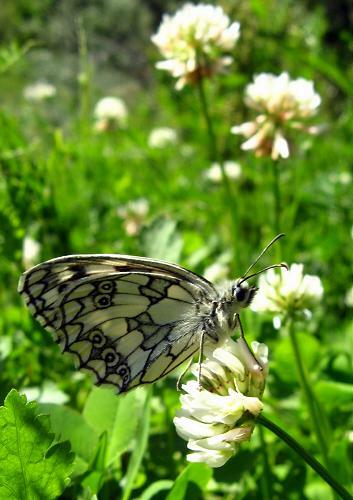 There was some sun in the middle of the day, when small whites and wood whites were flying around Huémoz. The weather inspired me to cycle out to my old butterfly meadows nearr Gryon but by the time I got there it had turned cold again. 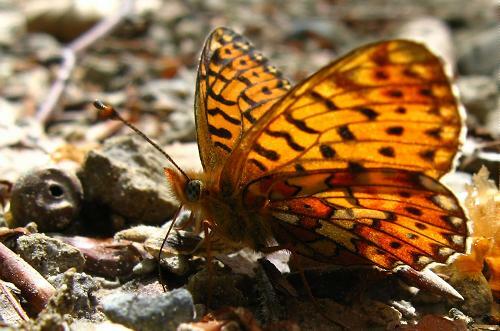 The only butterfly I saw was this fresh, male violet fritillary. 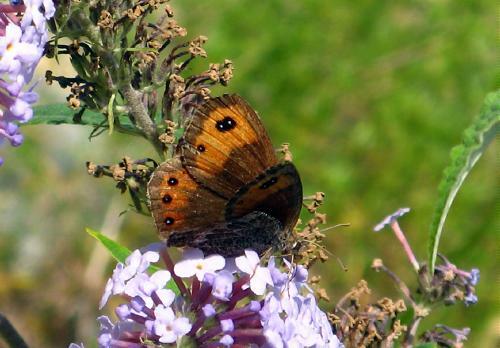 20th: Morning walk (c.9.00am) - small tortoiseshell and green-veined white. 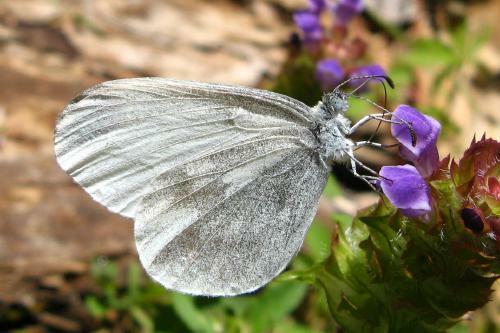 Later in day, wood white and small white. 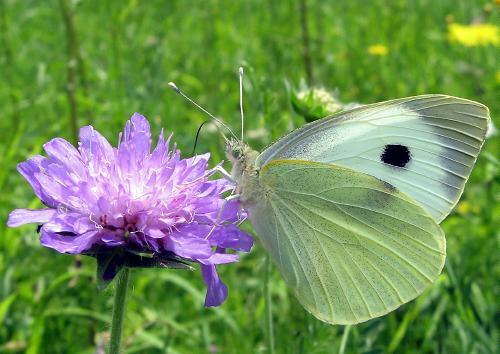 21st: Lunchtime walk around Huémoz: wood white, small white, green-veined white and a single comma. 22nd: Weather still mixed sun/cloud - and not particularly warm. 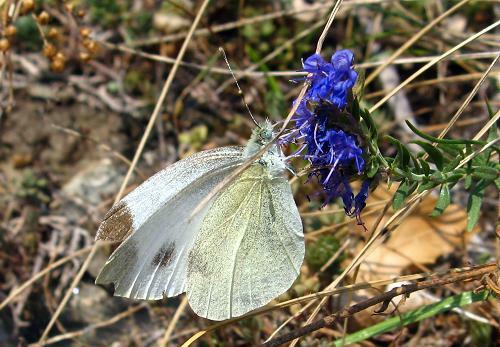 Small white, wood white and green-veined white around Huémoz. 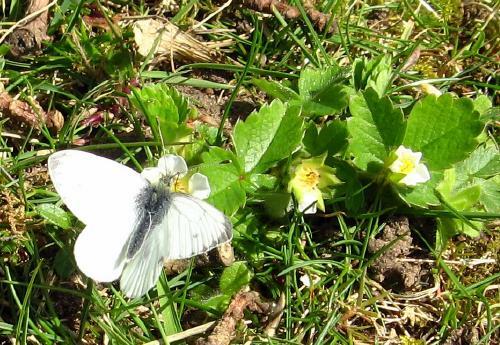 23rd: First wood whites already on the wing by 8.15, as I came back from my morning dog-walk. 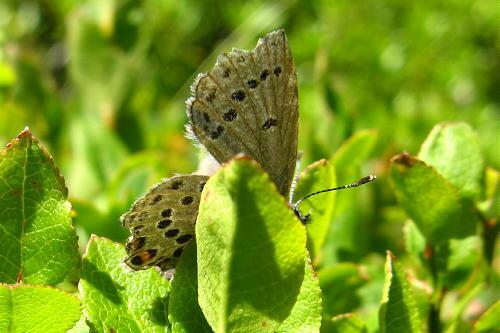 A lunchtime walk around Huémoz produced my first green hairstreak for the year at this altitude - a male, setting up a territory, plenty of small, green-veined and wood whites, a single peacock, and at least one, perhaps two, painted ladies (I can't tell if it was the same butterfly I saw zooming back past me shortly after seeing one fly in the other direction). 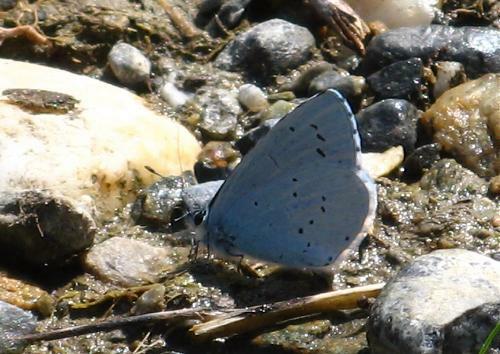 25th: A very enjoyable day in the Rhône Valley with Matt Rowlings, during which we found 36 species flying. This was despite a rather stiff breeze which gave the day a sometimes cool feel and meant things got going slowly. Most memorable, but actually towards the end of the trip, were three Camberwell beauties seen together flying over a small stream. 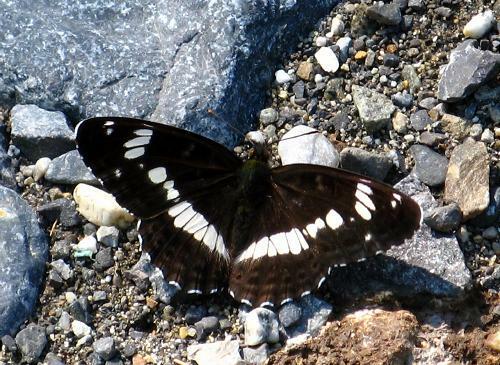 This one seemed to own the patch and remained on guard for about an hour (the whole time we were there) often settling on a rock, chasing away other butterflies (including commas and peacocks, as well as Camberwell beauties). 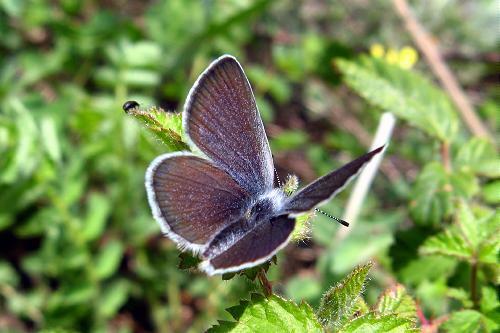 At least two other Camberwell beauties were in the region, and for a very brief period we saw all three flying together. Here is a video, including two flying together at the end. 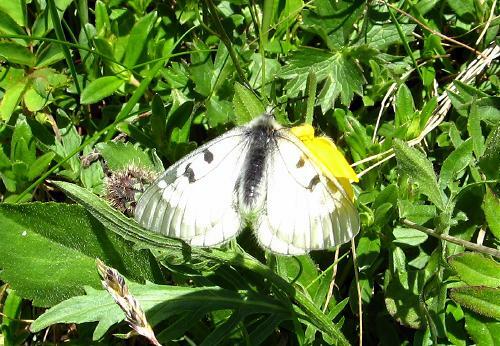 We saw all the common whites, including large white (very few), small white, green-veined white, southern small white (rather local, as usual), wood white and Bath white. 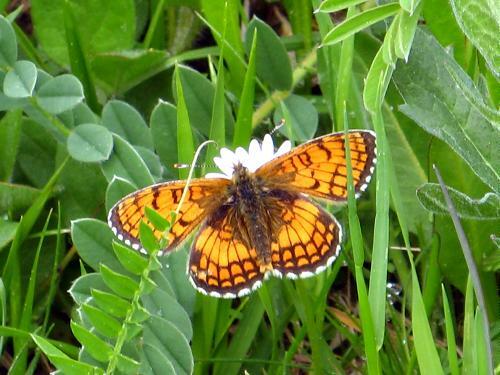 Orange tips were common in some places but not so visible in others, particularly where the wind was blowing. 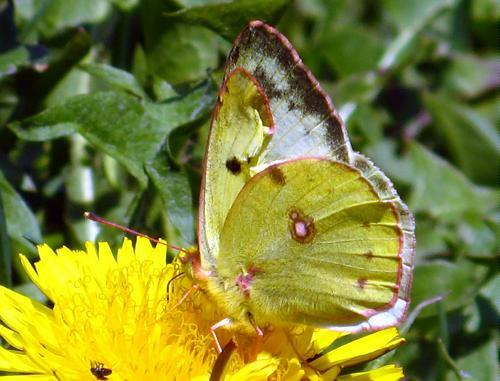 Berger's clouded yellows were frequent but there were just two clouded yellows. 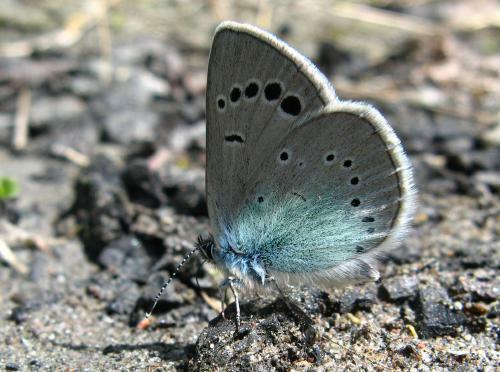 Blues were now much in evidence, with common blues cropping up in several places and Chapman's too (I'm not sure if this female is common or Chapman's), Adonis blues locally but not common yet, holly blues (just a few), several green-underside blues, frequent baton blues, the first Osiris blues (some, like this one, already looking old) and Provençal short-tailed blue, which seemed to get going as the day got warmer. 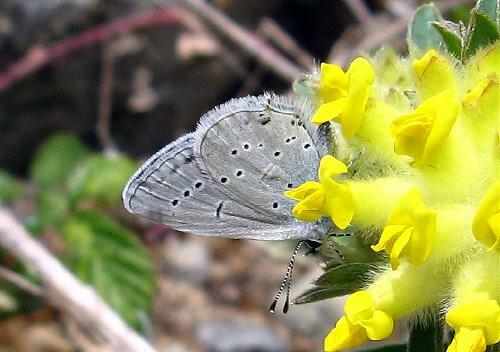 There were no short-tailed blues. 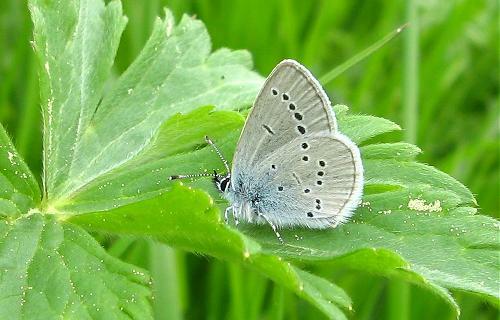 At one site several chequered blues were flying. 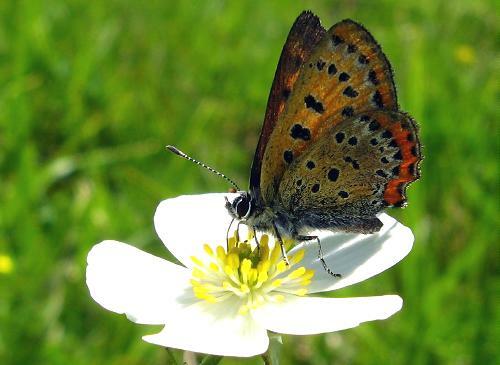 I saw my first small copper of the year in a flowery field where grizzled skipper, dingy skipper, mallow skipper and rosy grizzled skipper were also flying. 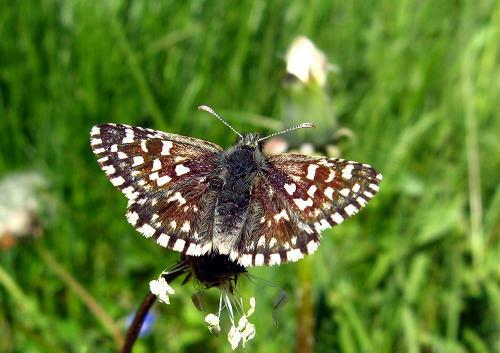 Here is a rosy grizzled skipper underside (and here). 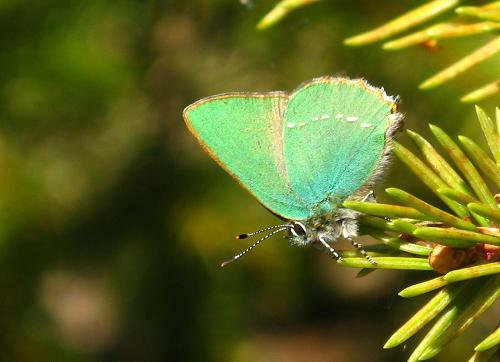 A green hairstreak was watching his territory nearby and there were small heaths flying over the low grass. 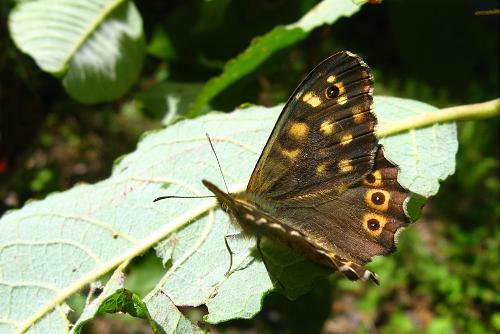 We saw a few scarce swallowtails, one or two swallowtails and many speckled woods. 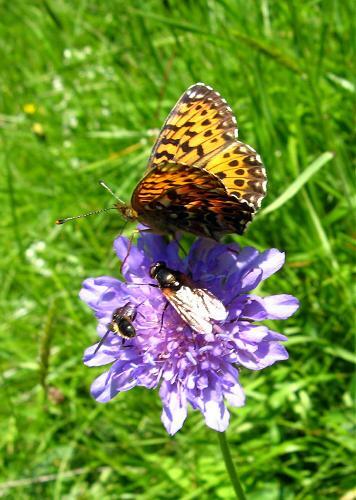 For the fritillaries, just Queen of Spain and violet were on the wing at the sites we visited, some of the Queens being very large and clearly different from the small, dark insects seen in March. Clouds came over by 3.40pm but it was a great day! 26th: Overcast all day, with no sun, but quite warm. 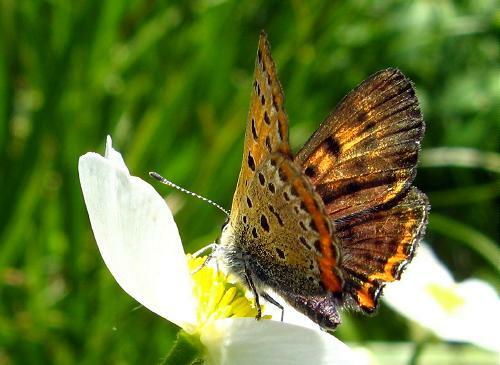 Two painted ladies, several wood whites, a comma and a dingy skipper were flying around Huémoz. 29th: Painted lady, peacock and a handful of whites around Huémoz on a dull day. 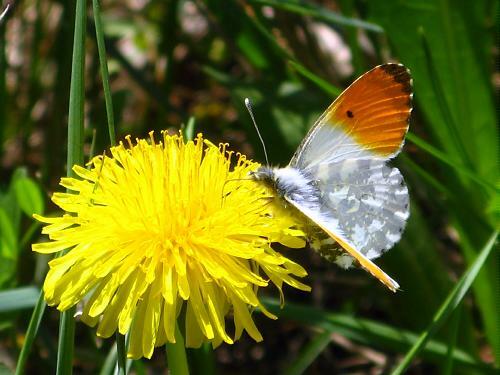 30th: Orange tip and whites around Huémoz. 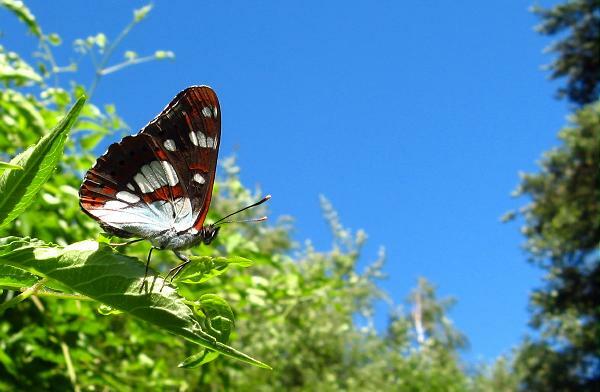 1st: Orange tips now commoner up here. 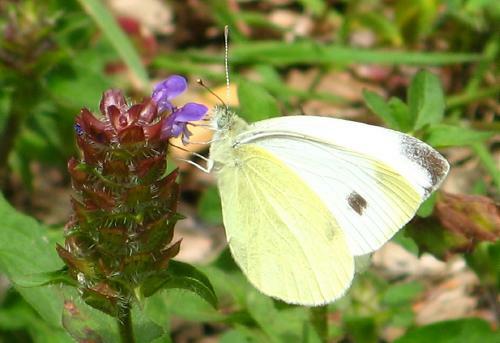 Several whites, including at least one male large white. 2nd: A mixed day - bright and cloudy. 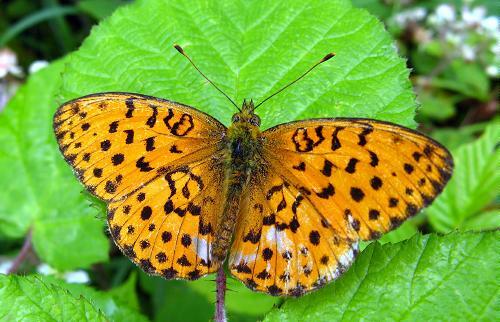 This violet fritillary was flying near my house this morning, as well as wood whites, orange tips, green-veined and small whites. 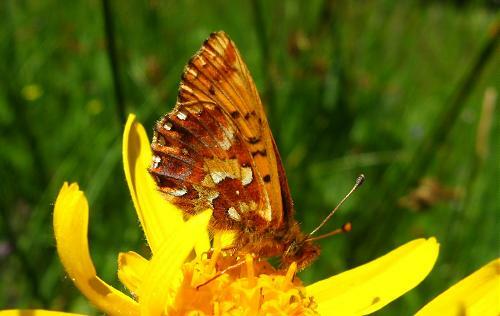 I had to go to Monthey in the late morning, and saw plenty of whites while cycling down the hill, and several painted ladies and a comma near Bex on my return. A swallowail flew past while I sat at Bex station. 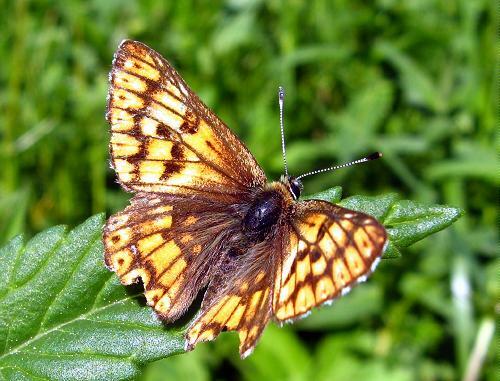 In the afternoon I walked the dog to a pearl-bordered fritillary site, but there were none there - nor any bugle, their usual nectaring plant there. 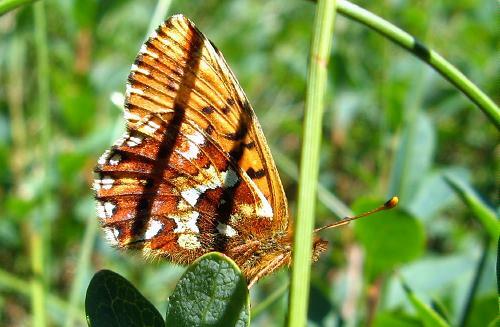 I did see a violet fritillary in a nearby meadow, and also comma, queen of Spain, whites, and several painted ladies during the walk. 3rd: A hot day in the Rhône Valley. Despite the warmth, it seemed many things were still slow onto the wing and the season does not feel far advanced. 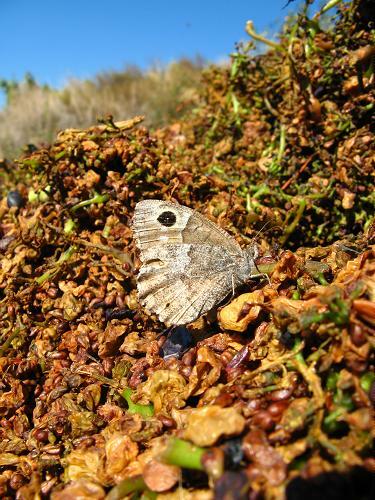 My first de Prunner's ringlet of the year took some looking for, nearly three weeks later than I saw my first one last year. 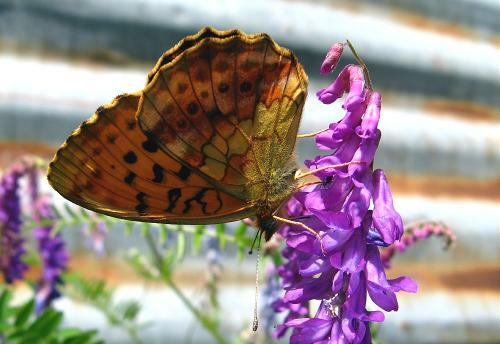 This spotted fritillary was also my first for the year, but it seems he has already been flying a while! 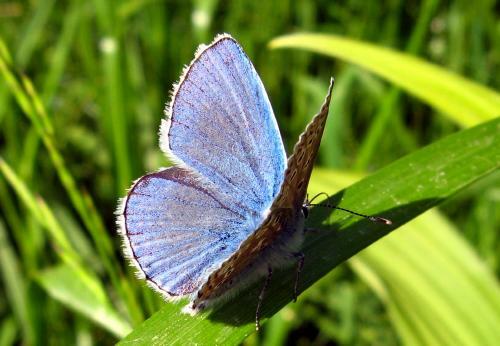 My other first was turquoise blue, which was flying in small numbers in three different places. That was very nice to see. 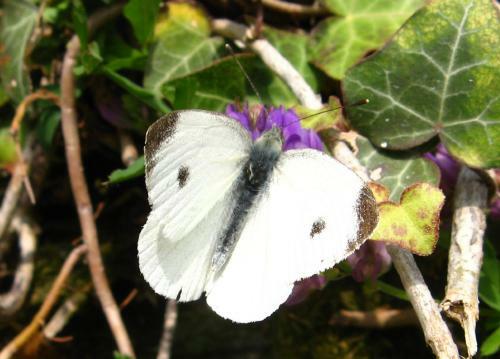 The usual whites were flying - small, green-veined, southern small, large white, wood white and orange tip - but just a single Bath white. 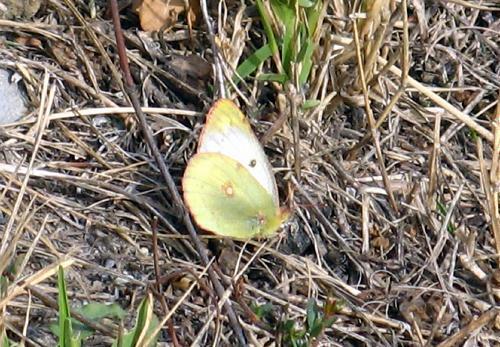 A male brimstone was cruising up and down a path and Berger's clouded yellows were common - no clouded yellows. 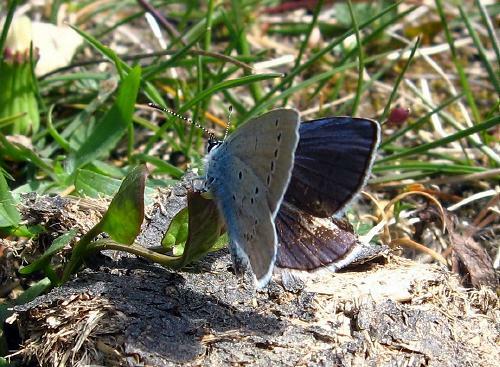 Plenty of blues were about. 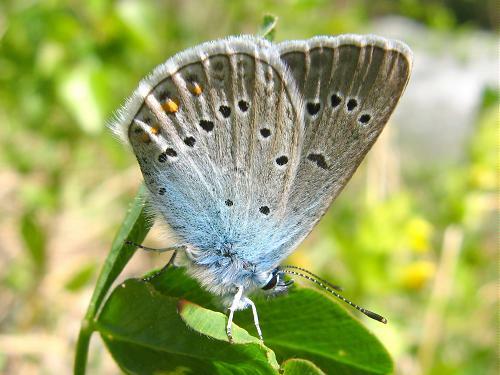 In addition to the turquoise blues there were Provençal short-tailed blues (locally common), holly blues, common blues Chapman's blues, chequered blues at one site, little blues, Osiris blues (and here), baton blues, green-underside blues and Adonis blues. 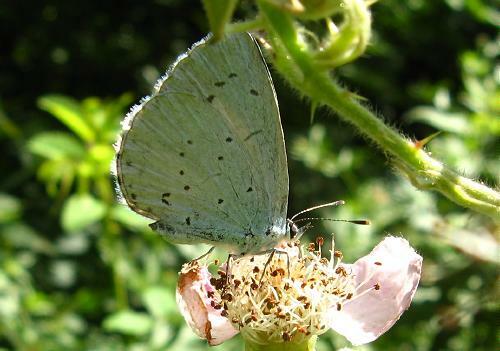 There were a couple of green hairstreaks. 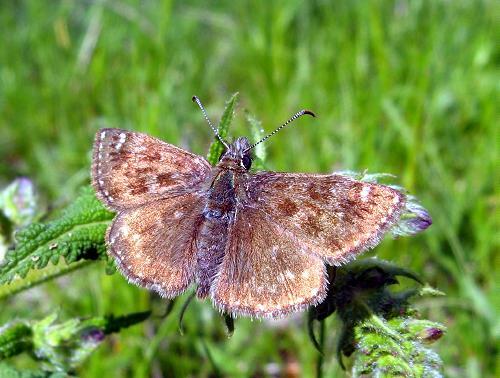 For the skippers, grizzled were relatively few and far between, rosy grizzled now common at an extended site (and here), dingy common, mallow occasional and a few red-underwings. Swallowtails and scarce swallowtails crossed our path quite frequently. 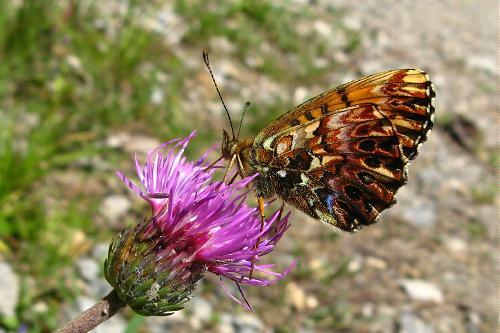 Painted ladies are now common in the valley, and peacocks were still around, with a single small tortoiseshell seen. A few commas. Wall browns are now quite numerous, with small heaths and speckled woods being the only other members of that family apparently on the wing today. 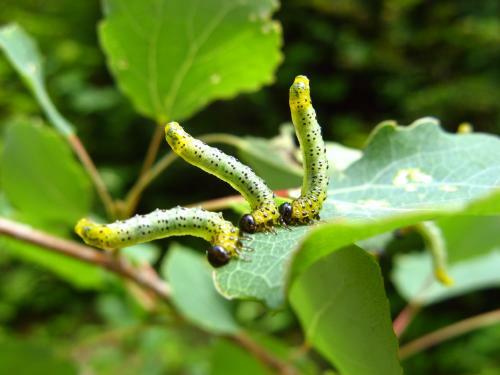 These pine processionary moth caterpillars were great fun to watch. There's a video of them here. Nightingales were singing in many places - a delight to hear. 6th: Asha recently lost a toenail and has been limping, so we went to the vet in Bex after school today. 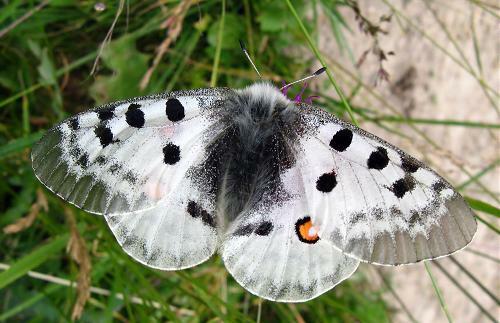 It was a hot day, and from the train we saw all the common whites (including orange tip), Berger's clouded yellows, plenty of painted ladies, speckled woods and, on the way back, a Bath white, near Bex. 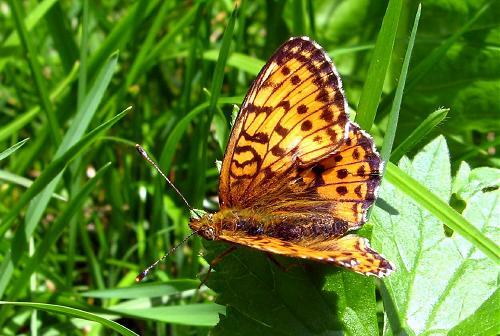 7th: I had a couple of hours off in the afternoon, and Asha couldn't take a proper walk, so I visited a couple of Duke of Burgundy sites at my altitude and also some local woods, this time for pearl-bordered fritillary. 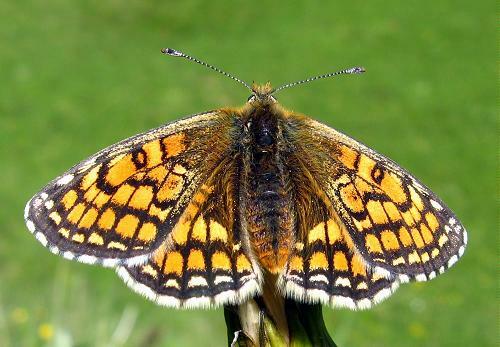 There were no Dukes flying - and the sites looked rather early season still, though there were violet fritillaries and small heaths in the meadows and probably one or two pearl-bordered fritillaries also in the meadows (they never stopped). 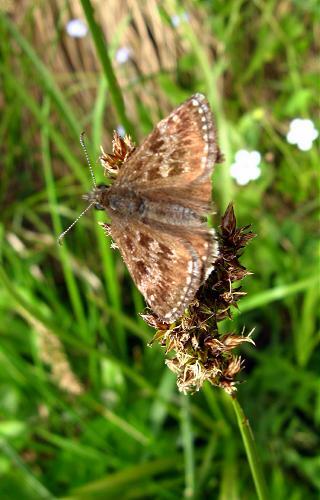 I saw two male Chapman's blues there too, and a dingy skipper in different meadows. 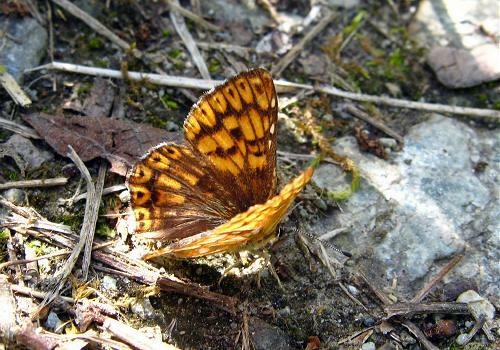 In the woods, speckled woods, Queen of Spain and a couple of pearl-bordered fritillaries were flying. 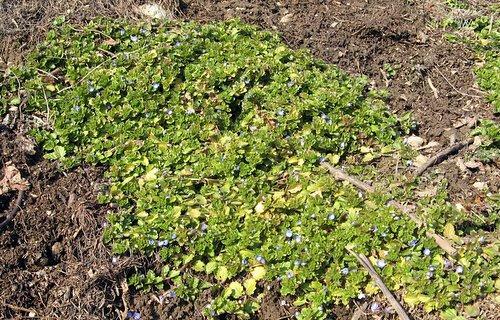 These last were restricted to a very small area where bugle still flowered. It used to flower along all the rides but they have become more shady. 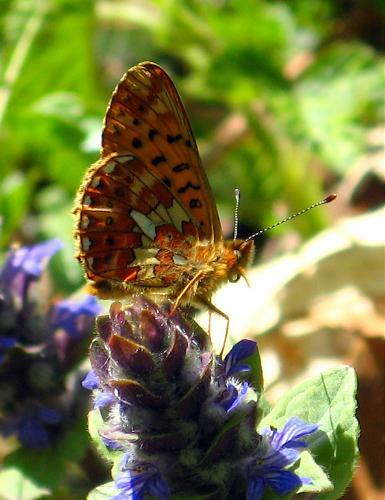 The fritillary is a great bugle specialist and as a rule it only flies where the flower flowers. Later in the day (about 5.00pm) I was able to visit another Duke site, near Gryon. 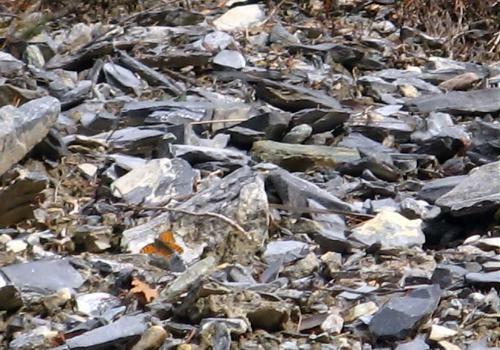 This is a strong site, where many fly in season, but none were visible today. 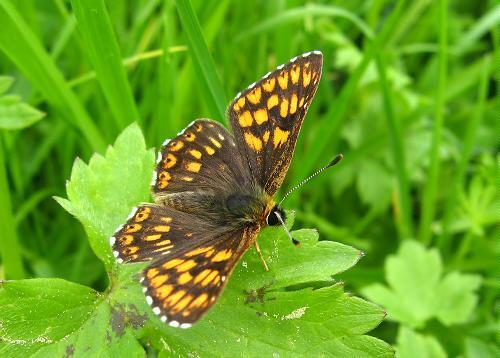 My first meadow fritillaries (and here - both these pictures are of the same female) of the year were flying with violet fritillaries; little blues, Chapman's blues and Berger's clouded yellows were present. 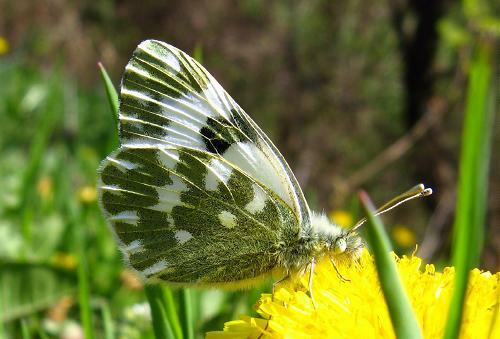 Orange tips, green-veined whites, small whites, large whites and wood whites were also flying. Some pristine male sooty coppers, again my first for the year, were moving restlessly around - it was still a warm day and things were not settling! Painted ladies regularly punctuated the evening with erratic fly-throughs. 8th: Asha is still incapacitated. 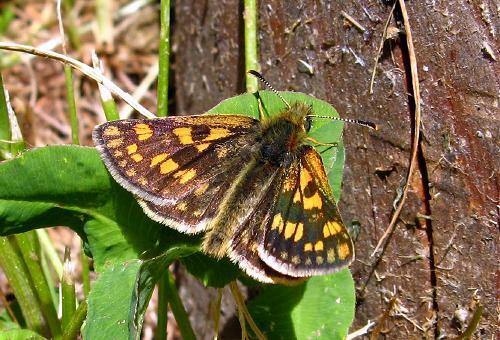 A local walk around Huémoz at lunchtime produced my first chequered skipper of the year. 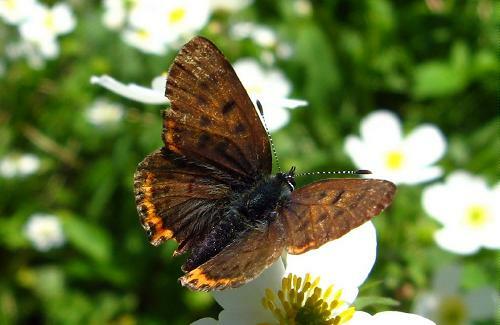 Sooty coppers are now quite visible here (here is a female) and orange tips, wood whites and painted ladies were also around. 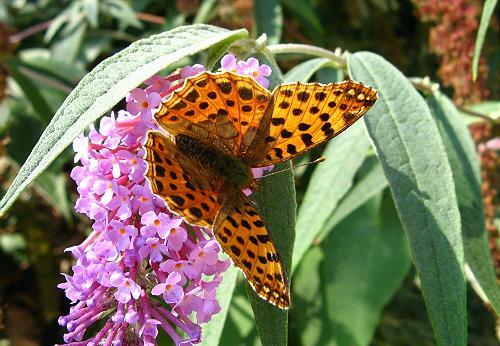 I saw a single comma and a couple of violet fritillaries. 9th: A sunny morning. With Asha still unable to walk, I cycled over to Gryon to look for Duke of Burgundies. 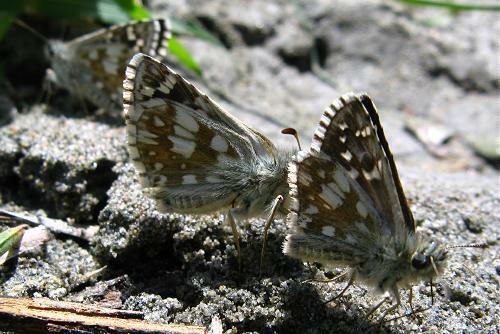 I found three fresh males at two sites (here and here are two different individuals from the first shown). By this time the sky was already clouding over. I had hoped to find skippers, but there were none, perhaps because of the cloud. 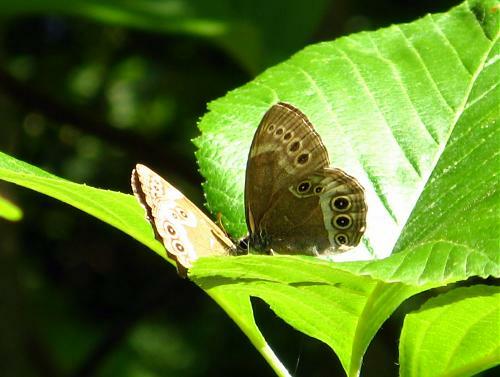 I had also expected the first woodland ringlets, but these were not flying either. 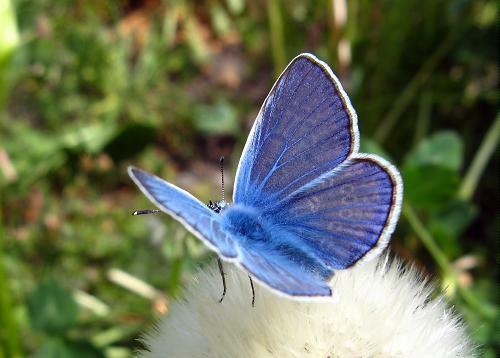 However, there were several Chapman's blues, common blues, little blues, violet fritillaries (mostly rather worn now), meadow fritillaries, orange tips, wood whites, and small heaths. I cycled home before long, under grey skies! 10th: Late morning walk in heavy, sometimes sunny, weather, to meadows and villages a little down the hill from my home. 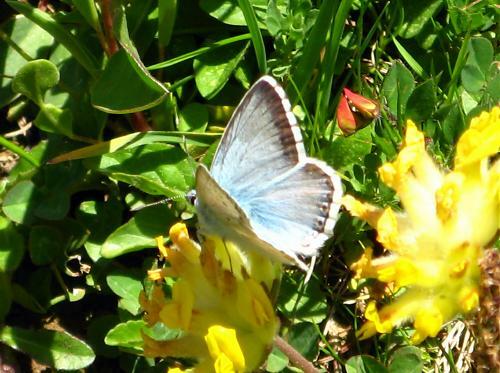 I was initially very pleased to find this osiris blue - my first of the species at this altitude this year (I might have missed him, because he was initially feeding on kidney vetch and I almost passed him over as a little blue). 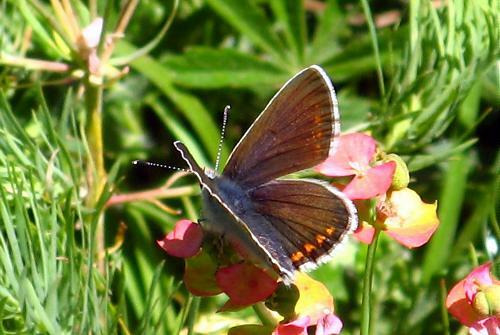 Since posting it, though, Tim Cowles has pointed out to me that it is actually a Provençal short-tailed blue. The confusion with little blue put me on the wrong track!! Thanks, Tim! 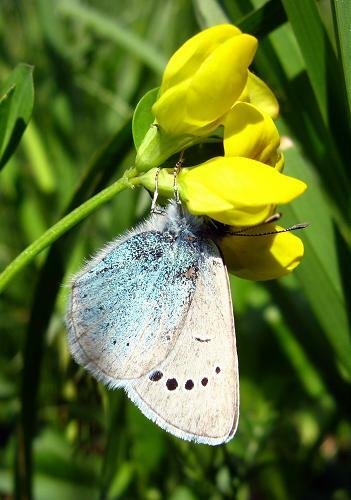 Other blues on the wing were common blue, Chapman's blue and Adonis blue, with wood whites and orange tips common, a few large whites and small whites, several painted ladies, a brimstone, a swallowtail (feeding with a painted lady on Buddleia) and this female Berger's pale clouded yellow. 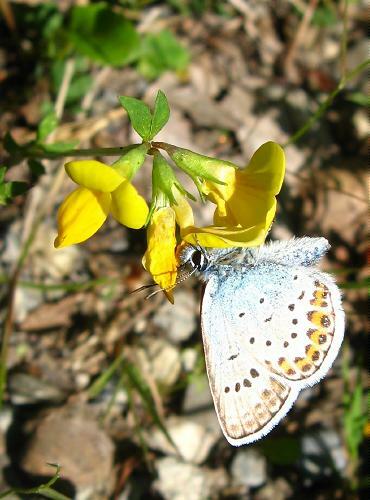 She was so interested in bird's foot trefoil I was hoping she was a pale clouded yellow, but on inspection she is not this - she was just nectaring. 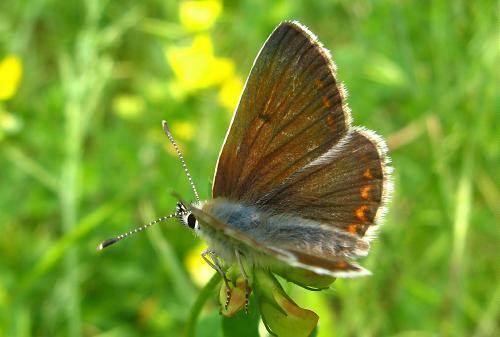 Other species seen included green hairstreak, small heath and sooty copper. 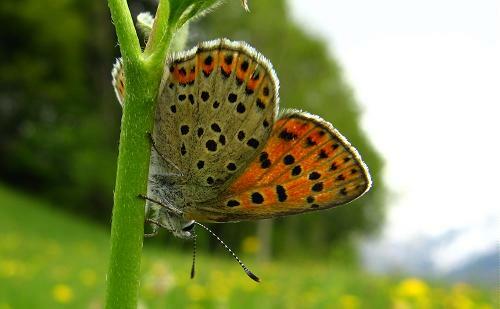 Here is another photograph of sooty copper taken later in the day, just a little higher up the mountain, at Huémoz. There is great variation in the amount of orange. 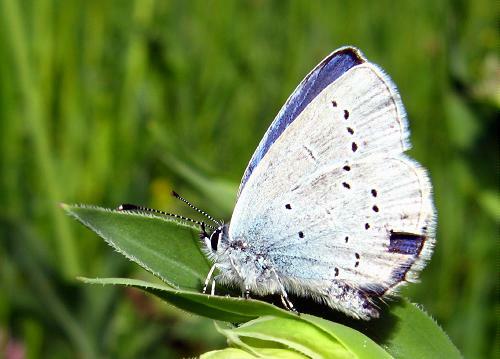 On the same, later, walk, I found this female Chapman's blue at Huémoz (and here). 11th: Gloomy and heavy but often warm and very occasionally sunny. 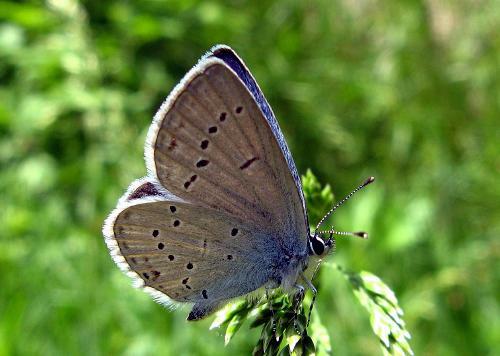 Around Huémoz there were painted ladies, wood whites, orange tips, green-veined whites, small whites, sooty coppers (and here), Chapman's blues, green hairstreaks, speckled woods and small heaths all flying under overcast skies. 12th: It was raining during my lunchtime walk with Asha so I didn't take a camera. This turned out to be a mistake. 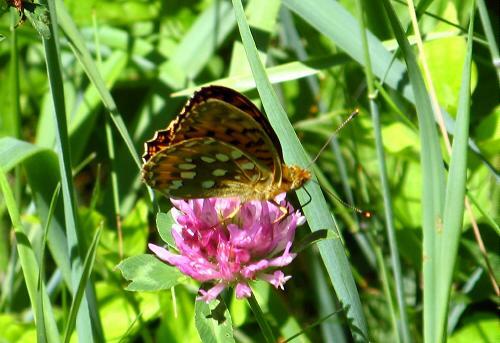 There were painted ladies everywhere! 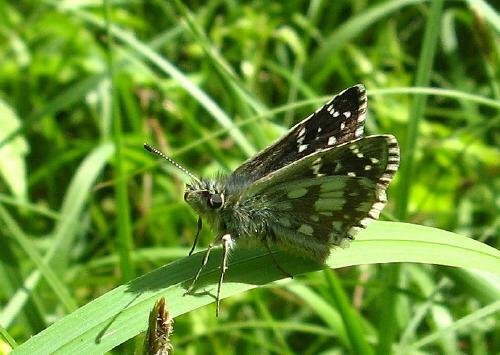 Along tracks through the meadows they were flying up in groups of up to 5 at a time, ever few metres - not exactly clouds of butterflies but certainly hundreds of them altogether. Nothing else was on the wing. 13th: Wet again for much of the day, but warm. 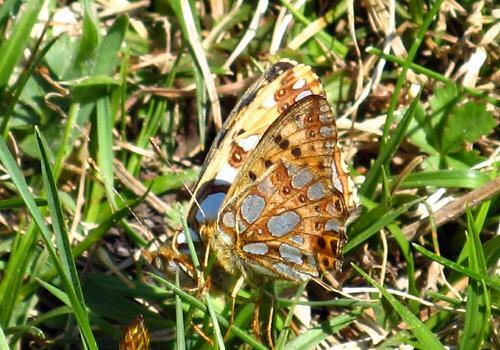 A few whites and Chapman's blues were about in the meadows at lunchtime but painted ladies were again the commonest species. 14th: Another overcast day, after a very wet night. 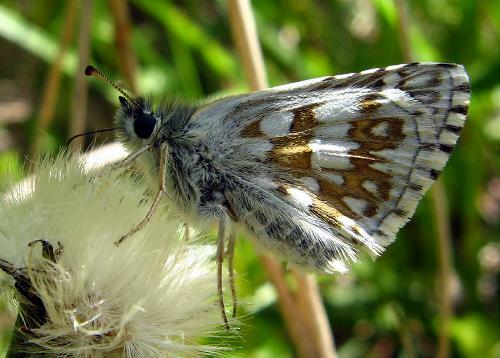 Despite this, painted ladies were in the meadows in good numbers and I also saw wood white, green-veined white, small heath, a single meadow fritillary and, in the meadow right next to my house, a female green-underside blue. 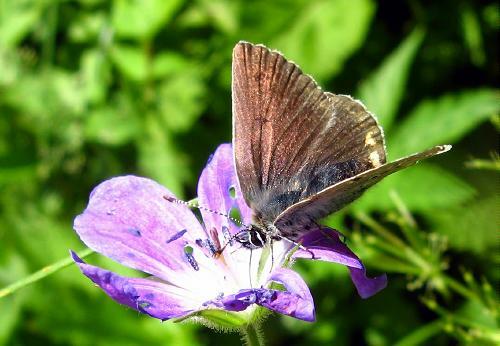 She was flying around wood cranesbills and I took her at first for a geranium argus. 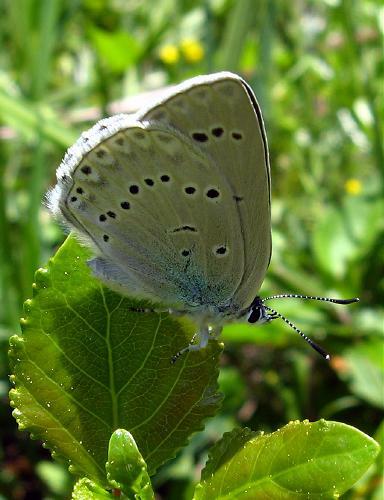 This is the first green-underside blue I've seen near Huémoz. 16th: After pouring (and very cold) rain yesterday, it was bright this morning and I decided to go looking for iolas blues in the Rhône Valley. 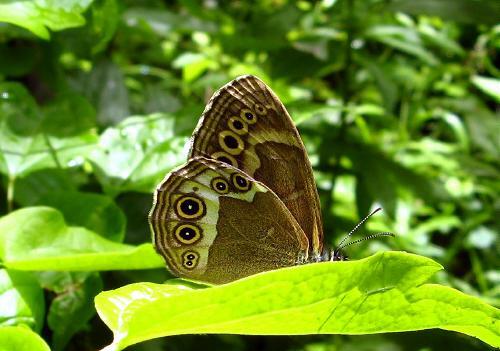 On the way, I saw plenty else - butterflies were very numerous and active everywhere. 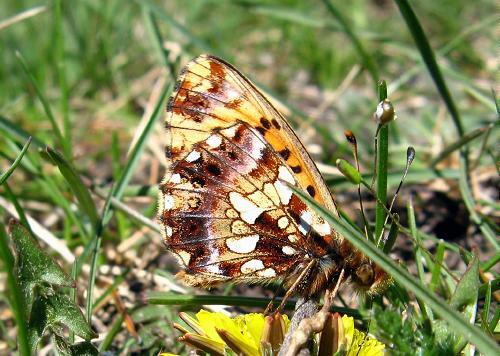 Painted ladies were the commonest, present in good numbers along every track and in every meadow. Small tortoiseshells were now out too - presumably the new brood. Walls have become much more common since the last time I was in the valley (two weeks ago). 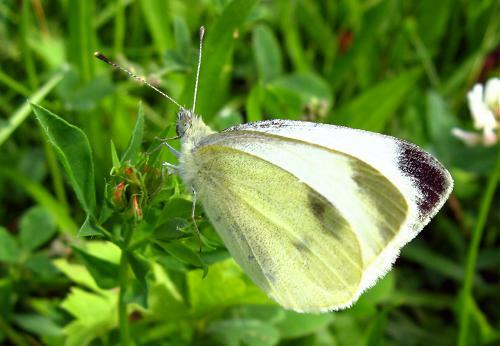 Large white were scarce but small whites, southern small whites, green-veined whites and wood whites were quite common, with a few orange tips around. 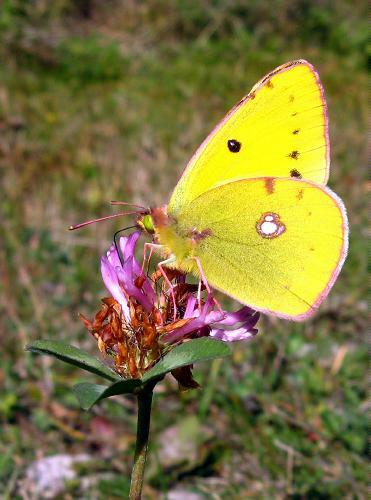 Berger's pale clouded yellows were everywhere but I saw just one clouded yellow, right at the end of my trip. 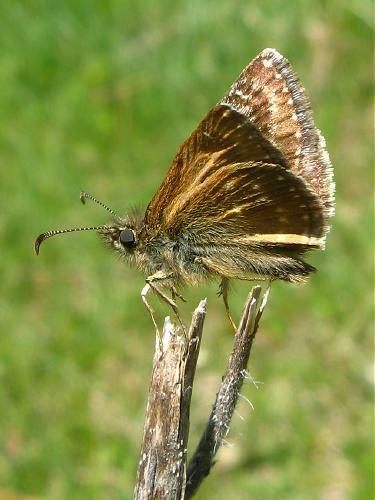 Dingy skippers were still around, and mallow skippers, but I saw no grizzled skippers. 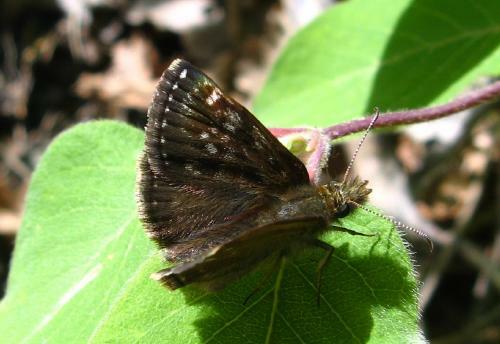 Instead, safflower skippers were now common. 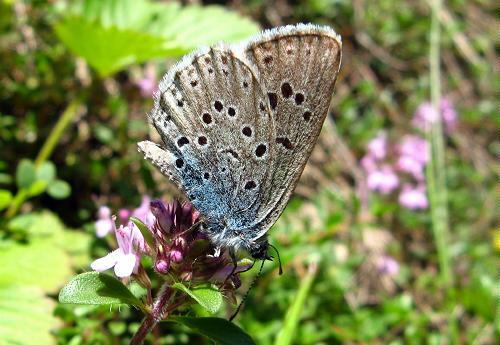 Chequered blues were amazingly numerous - more than I have ever seen them - and there were also plenty of common blues, adonis blues, Provençal short-tailed blues, green-underside blues, little blues (actually these were not common), baton blues, Chapman's blues and turquoise blues (also not common). 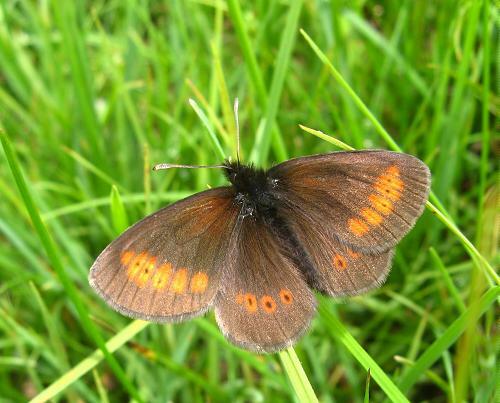 I saw my first northern brown arguses of the year in the meadows. At one site, where I stayed for two or three hours, iolas blues were very regular, with both males and females being seen. 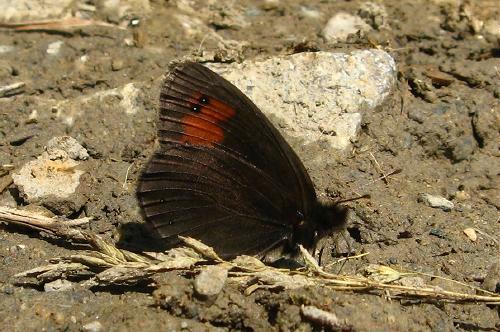 It was hot and they never showed their uppersides when resting or nectaring. 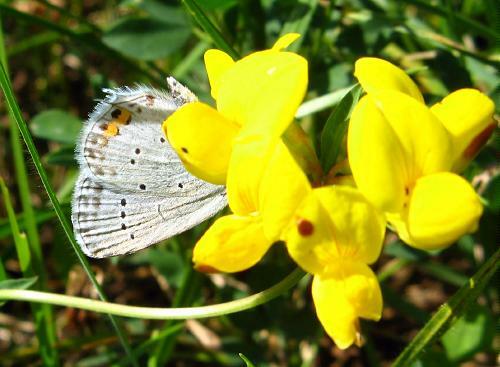 No bladders were on the bladder senna yet, so the two females I saw had nothing to lay on and were behaving rather like males, cruising around, nectaring and generally showing off. They were all amazingly mobile. 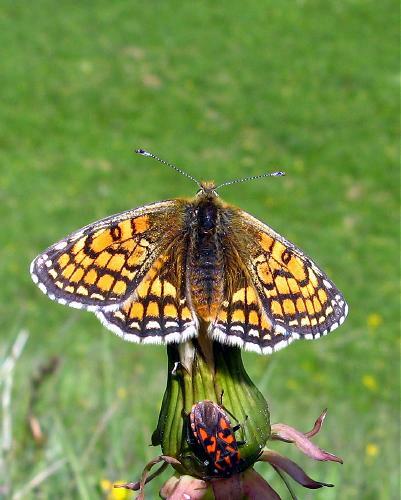 For the fritillaries, Queen of Spain were still numerous, and Glanville locally so. 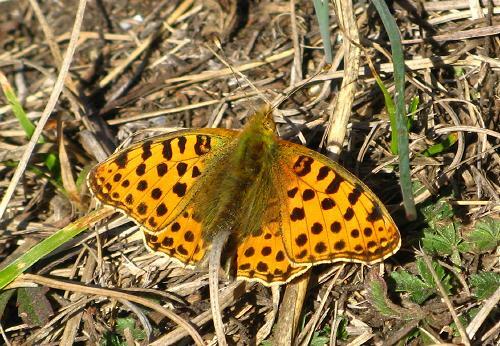 Spotted fritillaries were even more local, but present, and I saw a single pearl-bordered fritillary. 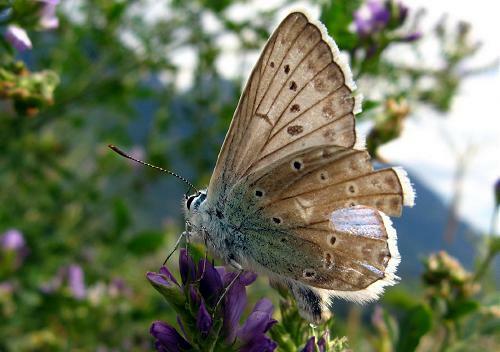 In the vineyards, Apollos were drifting aimlessly back and forth, rarely stopping for more than a second or two. Several scarce swallowtails swooped past but I saw no swallowtails today. 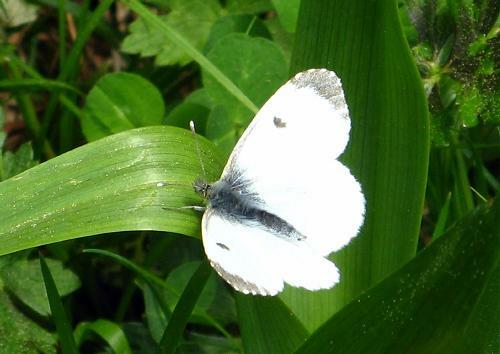 A single black-veined white flew past at my Iolas blue site. I initially took it for a clouded Apollo, having just seen my first Apollo, until it flew right under my nose! 17th: Sunny in morning. 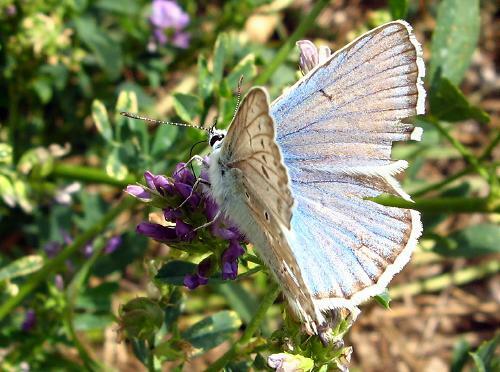 While walking Asha around Huèmoz I saw large white, small white, green-veined white, wood white, small tortoiseshell (the first of this year's brood), painted lady (still very common), common blue, Chapman's blue, grizzled skipper (my first 'altitude' grizzly of the year), comma and small heath. 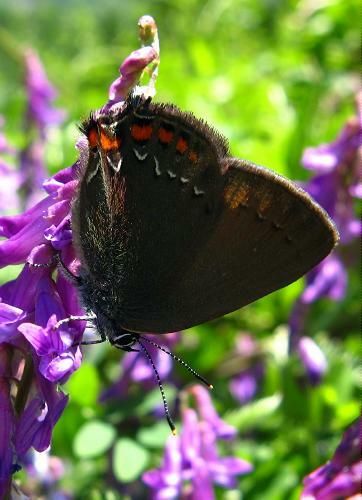 After lunch I cycled to a local violet copper colony - that seemed to fail last year, as a consequence of changing land use. 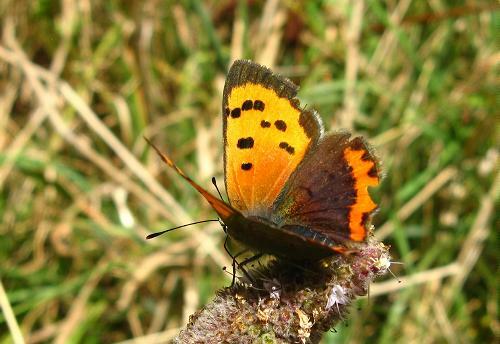 There was no evidence of violet coppers today, though it was only occasionally sunny and more often very overcast so they could simply not have been flying. 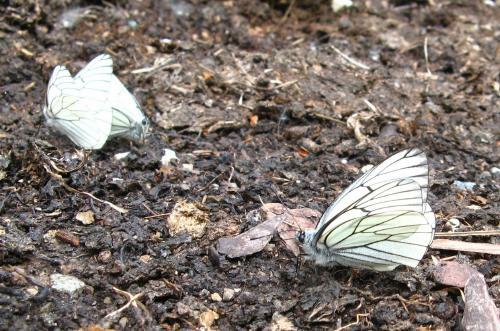 They could also not be on the wing yet - there was still persistent snow on the ground near the site! Although their historic site is almost certainly now useless, being too dry, the surrounding marshy regions have good quantities of bistort and their favourite nectar plants (a white Ranunculus) and I suspect they are still around, if I can only find them! 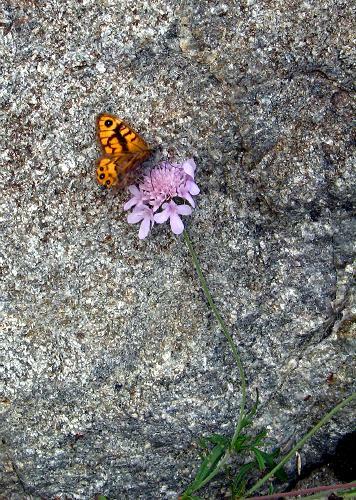 Plenty of painted ladies there, and a single green hairstreak - but very little else. 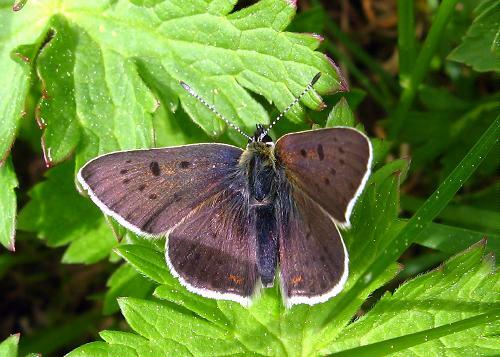 19th: Little time for butterflying but I did photograph this sooty copper and found a large white with quite prominent scaling around the veins on the underside. 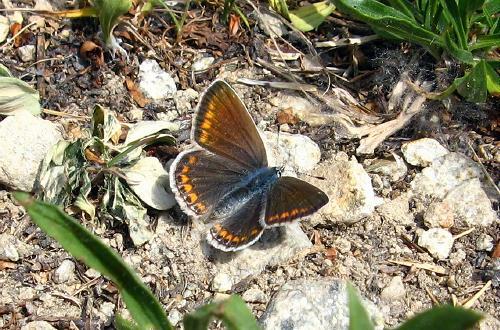 20th: The first heath fritillaries were flying in Huémoz, as well as hosts of other butterflies, including common and Chapman's blues, little blues, Adonis blues, a single Provençal short-tailed blue, a probable green-underside blue, wall browns, speckled woods (very common around here now), sooty coppers (also very common), small heaths and, of course, painted ladies. 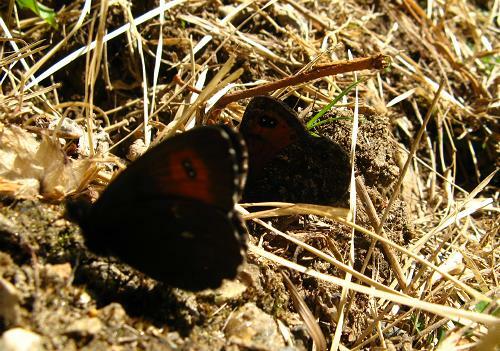 Small tortoiseshells are increasingly numerous, the new brood having just emerged. 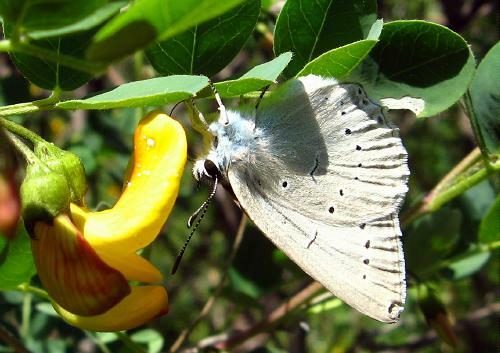 Berger's clouded yellow is prominent and I saw a single swallowtail. All the whites are flying, looking first broody still. 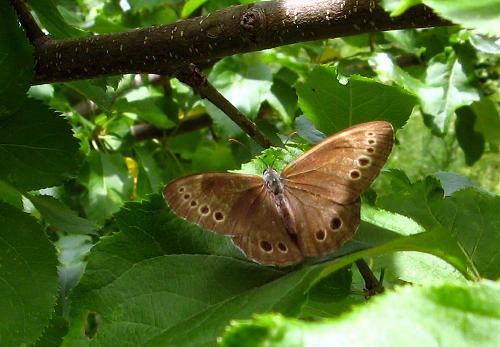 After school I went to Gryon, where woodland ringlets are now flying. 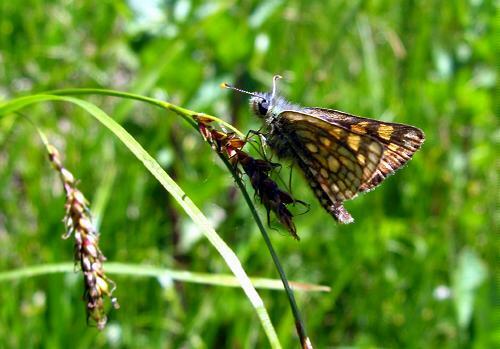 Heath fritillaries were probably more numerous than meadow there, but it is not always possible to be certain of the identity in flight. 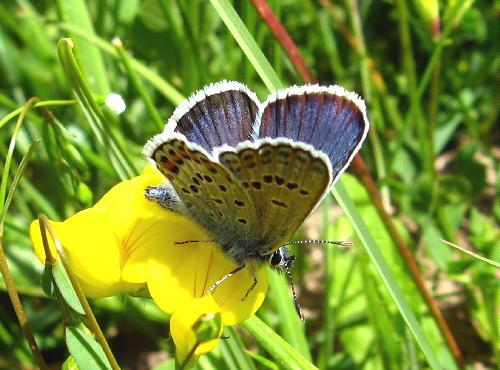 Sooty coppers were very common and I found this rather lovely female Adonis blue, as well as Chapman's, common and little. 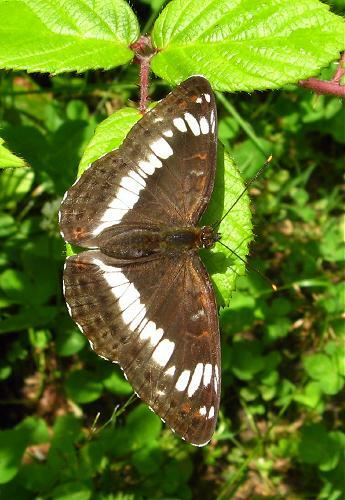 Duke of Burgundies were locally common and I witnessed four in the air together at one point. Here is a female. 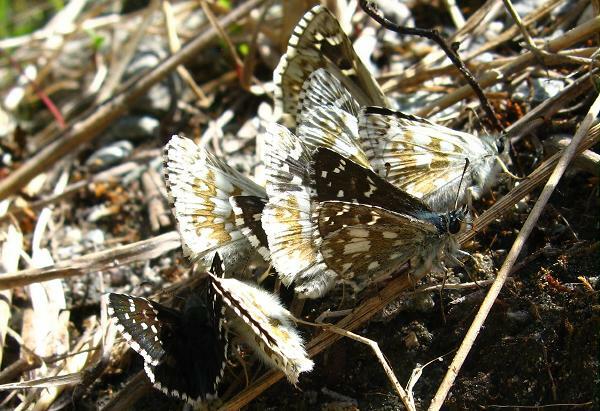 Grizzled skippers were also common but I saw no dingy nor any other Pyrgus, like large grizzled. 21st: Heavy and sometimes overcast but mostly sunny. 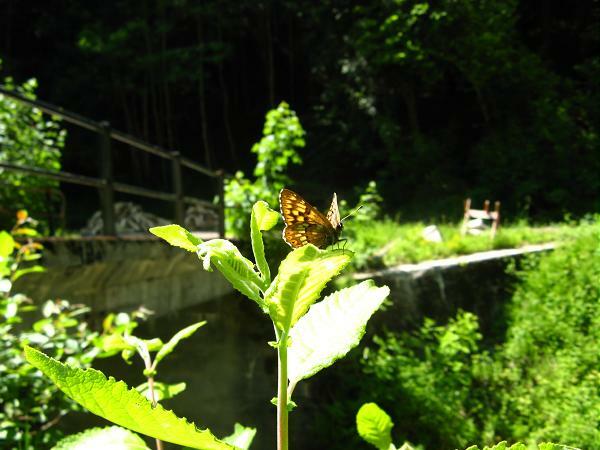 In the afternoon I walked from Huémoz to Panex and the woods beyond. 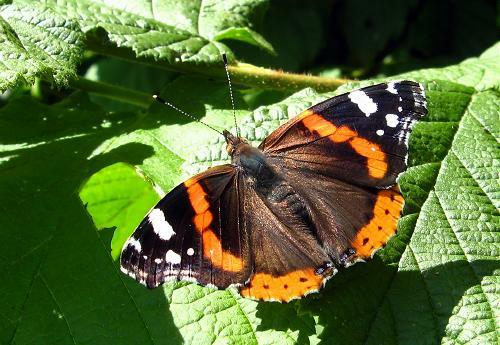 Near Panex I saw two red admirals - my first of the year. 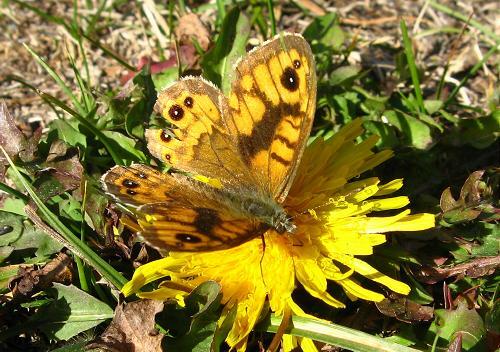 I also saw a single large wall brown, again my first of the year. 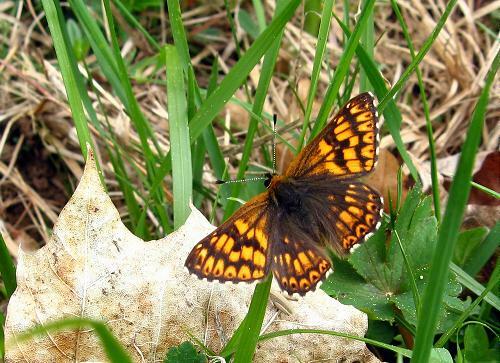 In Huémoz itself I found this melanic fritillary, that I take to be a meadow fritillary. 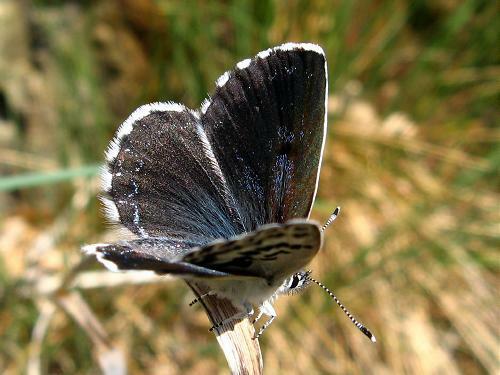 Here is another upperside and here an underside. It seemed to have been hit by a car, though Huémoz is a tiny village and nothing moves very fast where I found it. 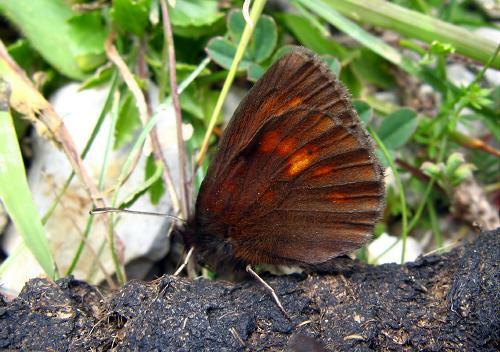 Other species seen today were: brimstone (several in the woods near Panex), comma (several), small heath (now very common), Berger's pale clouded yellow (common), heath fritillary, violet fritillary, pearl-bordered fritillary (I think this species is curently at its peak, with lots of males and females flying), Chapman's blue, common blue, little blue, sooty copper, painted lady, small tortoiseshell (now common again), dingy skipper, large white, small white, green-veined white, wood white, orange tip, wall and speckled wood. 23rd: A very hot day in the Rhône Valley. I visited a single site and found 34 species flying there. 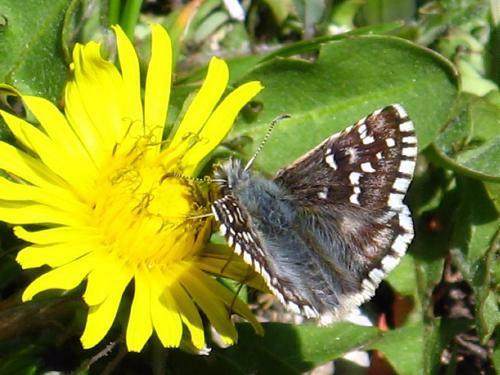 This included four new species for the year, but did not include several that are clearly not on the wing yet: I saw no ilex hairstreak, purple-shot copper, knapweed fritillaries, southern white admiral or marbled skippers, for example. 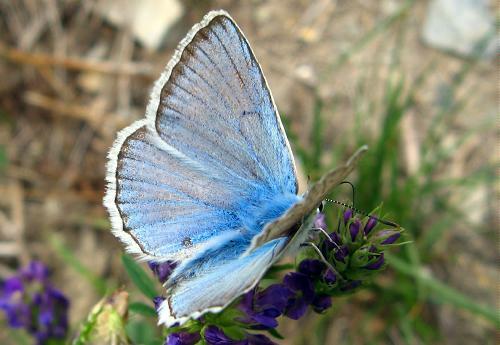 The year ticks were Swiss zephyr blue, of which a few very fresh and dark males were taking minerals at a couple of places (no females yet), Provençal fritillary - again, just a few males, mazarine blue (one male and one female) and olive skipper, of which I saw three different individuals in total. 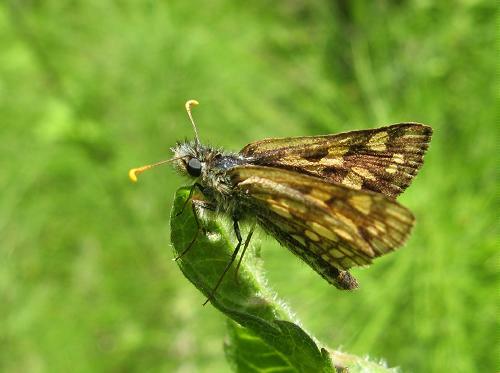 Here is an underside and here an upperside (surprisingly large spots, but this is certainly an olive skipper!!). As well as these, painted ladies were everywhere - quite literally - I saw a single swallowtail, dozens of scarce swallowtails, plenty of orange tips, large white (one), small white, southern small white (no green-veined whites consciously seen, but I expect there were some around! 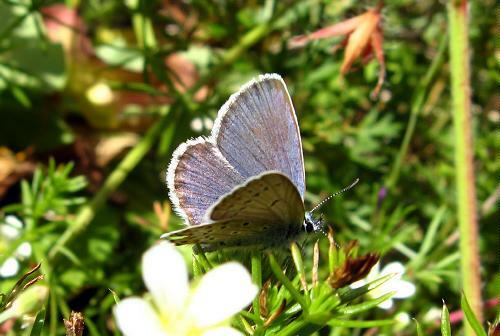 ), little blue (just a handful), Provençal short-tailed blue (all over the place - the commonest blue by far), wood white (common), red admiral (several, including a female checking out nettles for some while), wall (commonish), Chapman's blue and common blue (both common), dingy skipper (a few), de Prunner's ringlet (lots, drifting along the paths and rarely stopping long enough for a good picture! 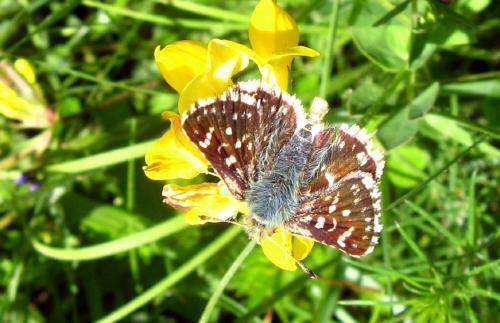 ), speckled woods (common in all the shady places), small tortoiseshell (present all day, but not really common), Adonis blue (just a few), black-veined white (getting going now), Queen of Spain (several), Glanville fritillary (just one), safflower skipper (several - easily recognised by the huge size), small heath, grizzled skipper (just a handful), a single female green hairstreak, oviposturing on this plant, which I haven't identified yet, violet fritillary (just one), Bath whites (locally common) and comma (three). 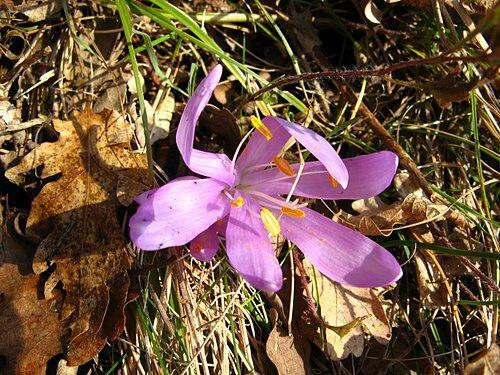 It's still very much spring, despite the summer heat today! 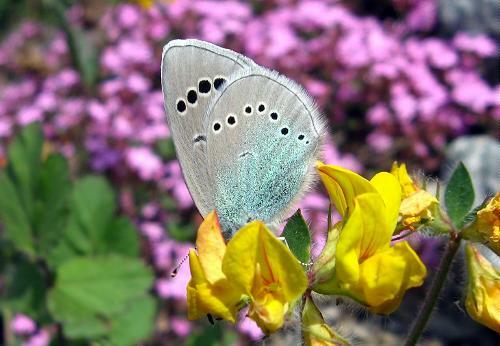 But if the weather continues, some of the summer species should start appearing at sites like this. 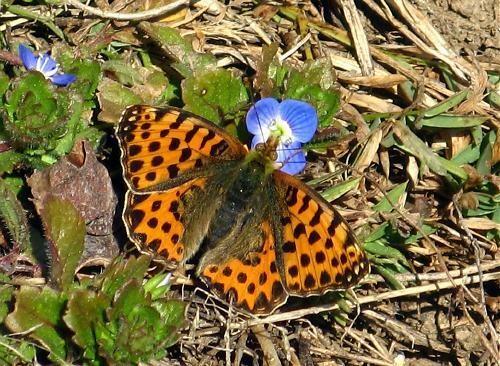 24th: A pleasant morning in the Gryon region, where meadow fritillaries were flying in great numbers, males and females. 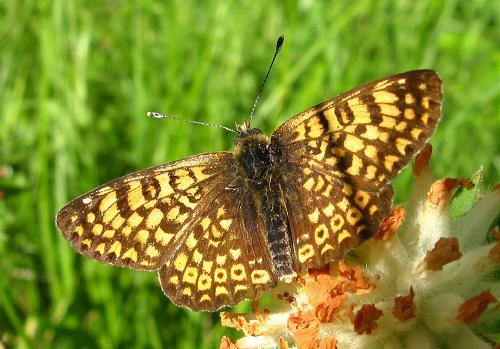 Today I found no heath fritillaries at all, and I now suspect that my comment of 20th May that more heath than meadow were flying was wrong! 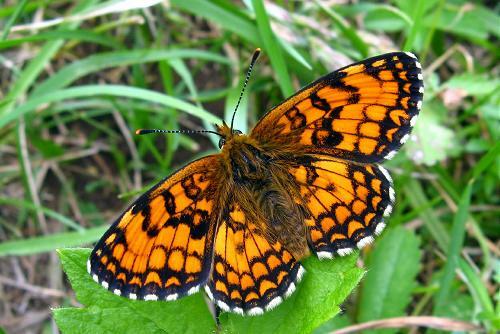 I think the heath fritillaries I identified in flight were probably female meadow fritillaries (though I did formally identify at least one heath fritillary close up that day)! 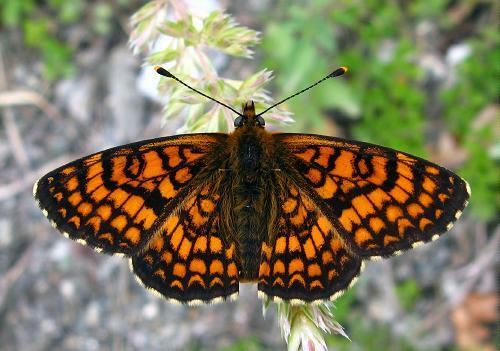 This male meadow fritillary was flying in Huémoz first thing in the morning. 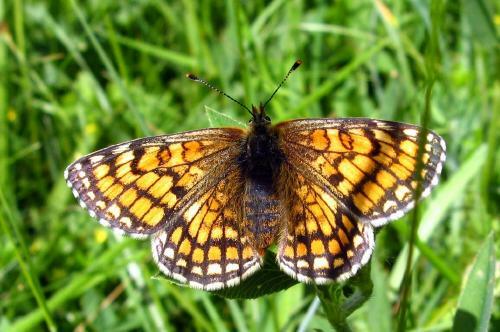 My first false heath fritillary of the year was flying, and also small heath, wood white, small white, green-veined white, large white, black-veined white, Berger's pale clouded yellow, Duke of Burgundy, dingy skipper, grizzled skipper, red-underwing skipper, red admiral, painted lady, small tortoiseshell, Chapman's blue, common blue, Adonis blue, sooty copper, wall brown and little blue. 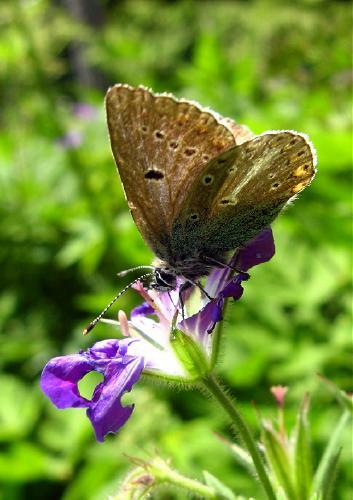 Despite looking for them, I found no geranium arguses on the wing yet. 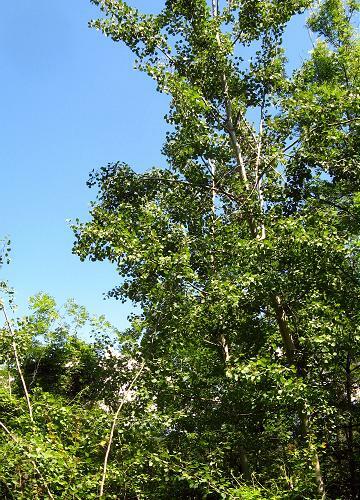 25th: A very hot day in Valais, with temperatures of 31°C in the shade. 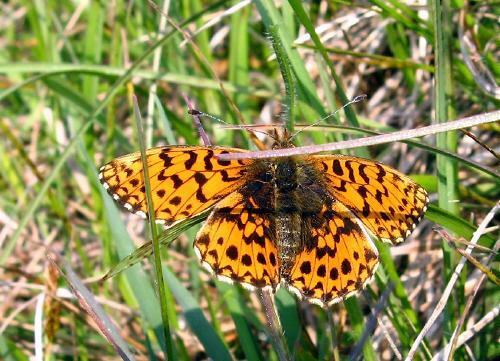 The target species for my trip was Nickerl's fritillary - a life tick for me. 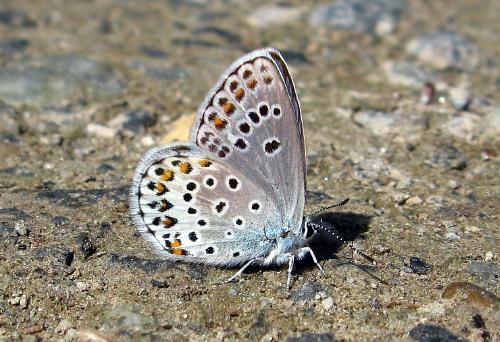 I saw perhaps a dozen, all at one site, though the heat meant none of them ever rested with their wings open for me to get a natural picture of the upperside! 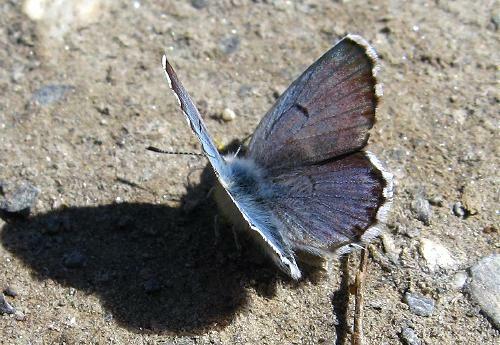 I resorted to deliberately casting my shadow over this one, which induced it to spread its wings (but did not frighten it in the least). This is the best upperside shot I got in the shadow - but my camera is not so good in shade. I did also net one male so I could identify it formally, being a life tick! I let him cool down a little so he might sun himself when I released him. This is him sitting in his open box, refusing to crawl off onto a flower! When I nudged him, he flew off. 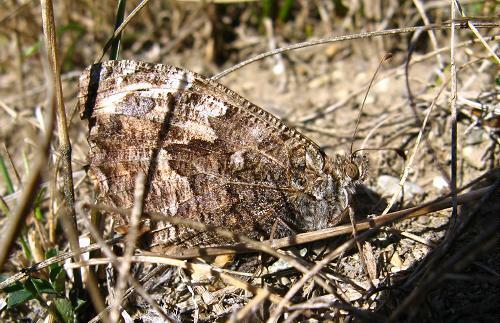 Here is another underside, of a different individual. 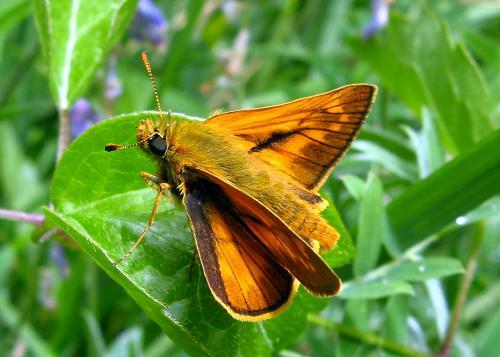 Other firsts for the year were large skipper (here is another), Amanda's blue, brown argus, geranium argus (here he is being studied by a swallowtail) and idas blue. 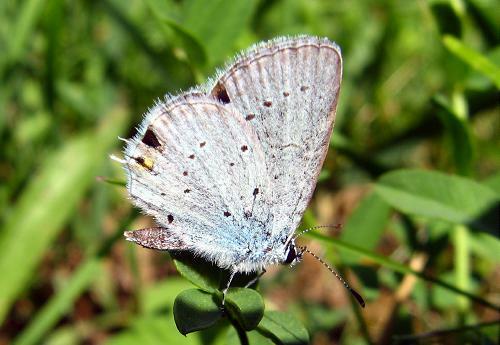 Common blues and Chapman's blues were common, with some Adonis too, and I saw two or three holly blues. 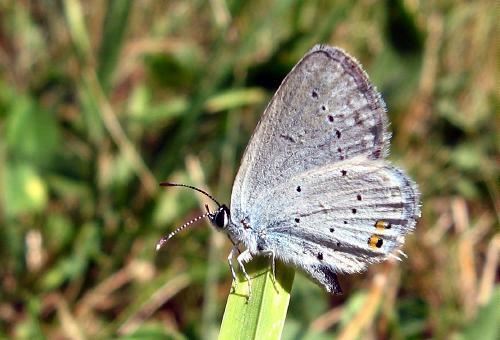 Little blues were locally abundant, as were Provençal short-tailed blues, and green-underside blues were also present in good numbers. 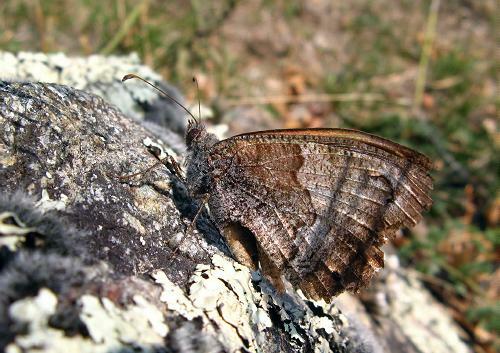 There were plenty of baton blues, competing with all the rest for the best mineral spots! 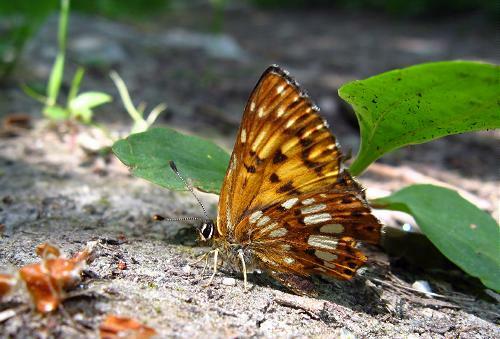 In the woods, Duke of Burgundy fritillaries were flying, but generally seeking the shade rather than the sun, and so difficult to photograph well. 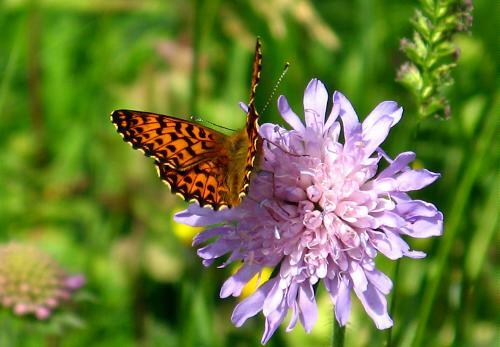 For the other real fritillaries, Glanville was the most prominent, setting up territories on paths and beside them. 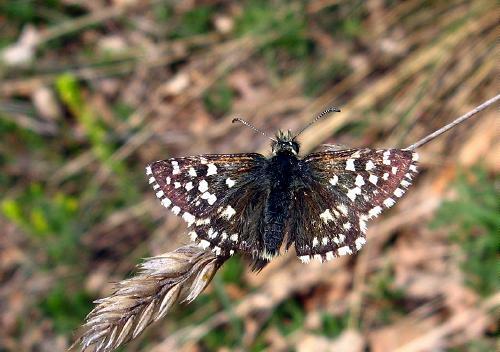 There were also a few false heath fritillaries and a single heath fritillary in the woods, but I saw no Queen of Spain, surprisingly. 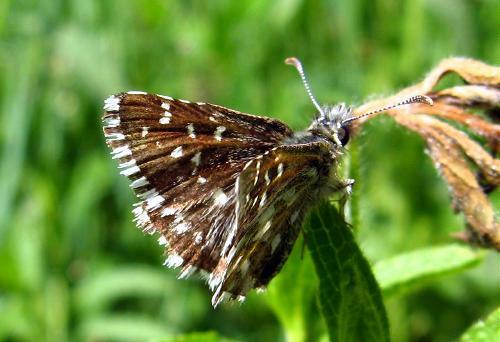 Mallow skippers were present in small numbers and I saw one chequered skipper, but the real skipper stars of the day were safflower skipper and olive skipper, of both of which I saw dozens of individuals. 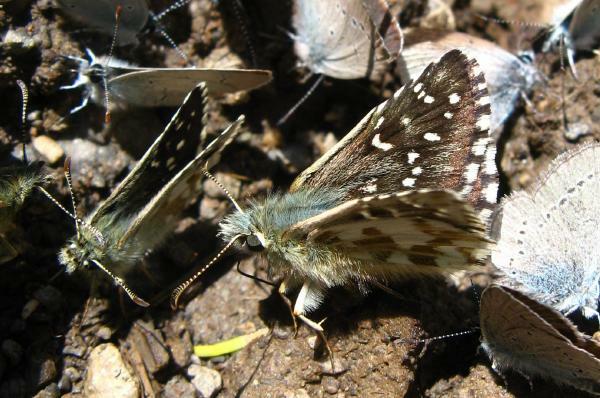 Here is a cluster with both those species present, and here a little group with two olive skippers, one safflower skipper, and a grizzled skipper being trampled by the safflower skipper. 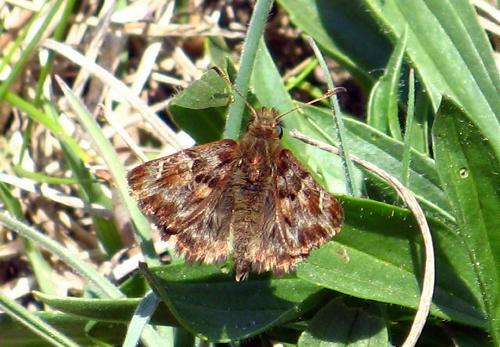 This olive skipper was older and more worn than most - here is the upperside. 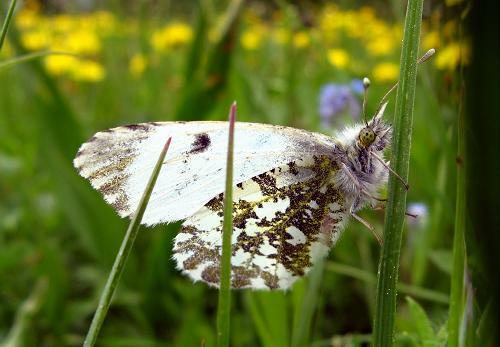 Other species seen today included Bath white (locally common), painted lady (enough said!! 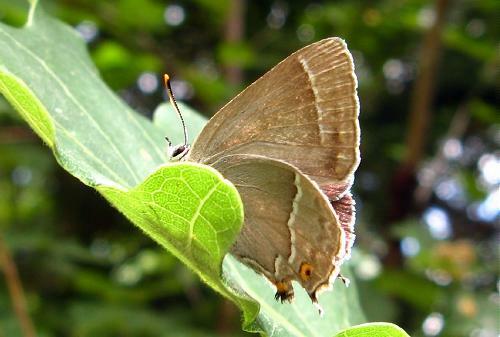 ), green hairstreak (two or three, looking a little weary now), peacock (many, looking very weary now!! 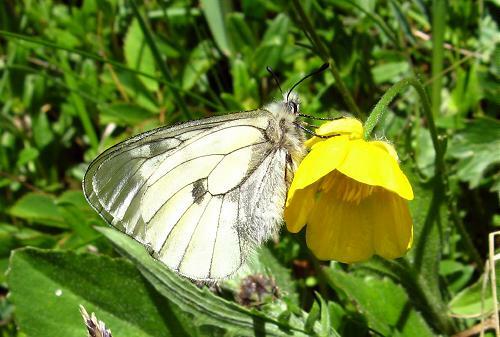 ), small white, wood white, scarce swallowtail, small heath, black-veined white (quite frequent but still early season for this species), large white (one), Apollo (one), clouded yellow (two) and Berger's pale clouded yellow (I presume - though today I didn't check any). A wonderful day! 27th: Large walls now regular (but not common) around Huémoz. 28th: A normal working morning, but very warm at lunchtime. 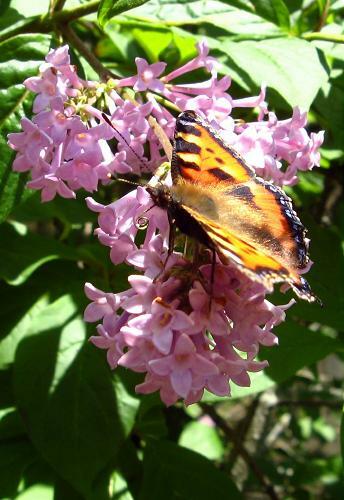 This small tortoiseshell was nectaring on a lilac in my garden (and here). 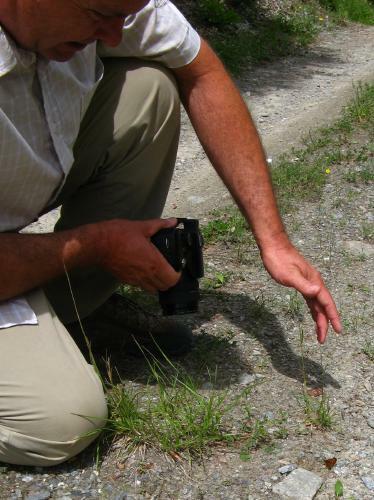 Fresh small tortoiseshells are now common around Huémoz. 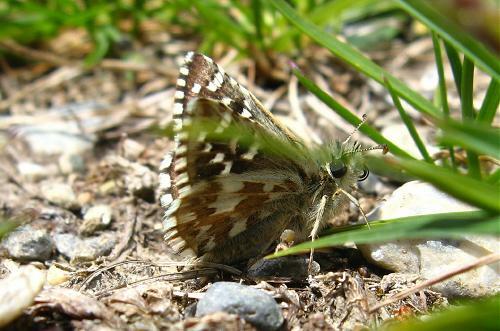 Painted ladies were common too, as ever, and in the shady parts speckled woods were frequent. 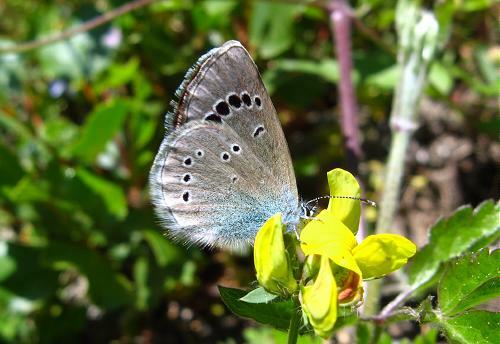 I saw common blues and Chapman's blues but did not consciously notice any whites or yellows. 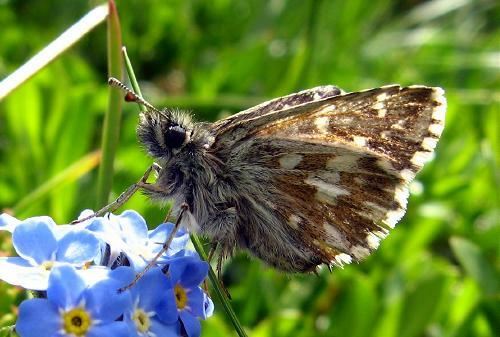 This grizzled skipper was in good condition. 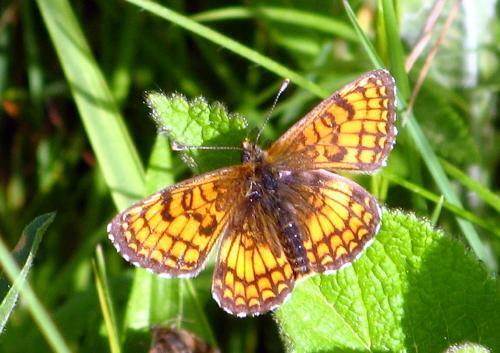 There were many pearl-bordered fritillaries flying locally, including females ovipositing on young violet plants. 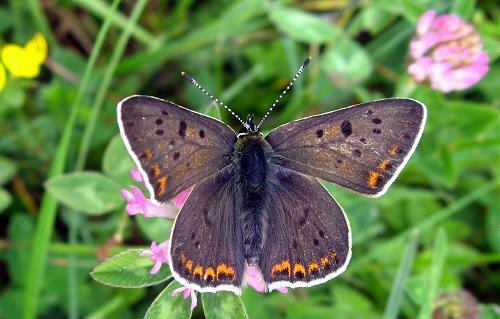 In the afternoon I decided to look for violet coppers, but was thwarted by the weather, which turned overcast and cold as I arrived at the site. 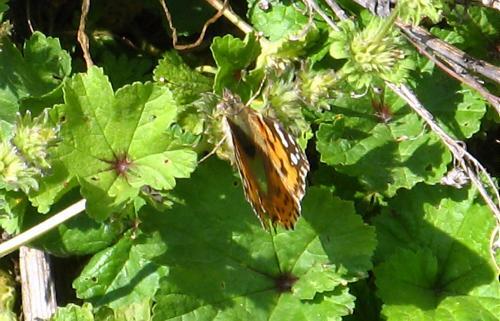 Painted ladies and small tortoiseshells were flying, but no other butterflies. 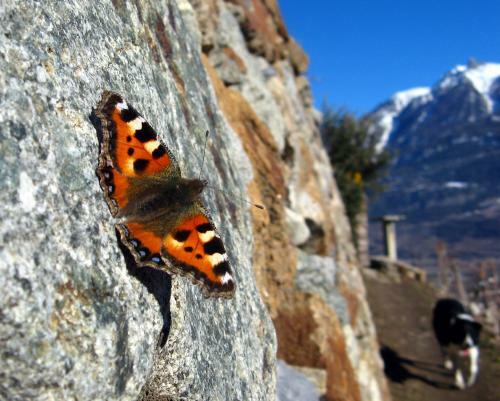 30th: Painted ladies were flying in Huémoz in the early morning and the forecast for Valais was sun, sun, sun. So I caught the 0812 down the hill and found that actually it was cloud, cloud, cloud. It also rained the whole time I was out, so no butterflies at all!! Bad forecast. 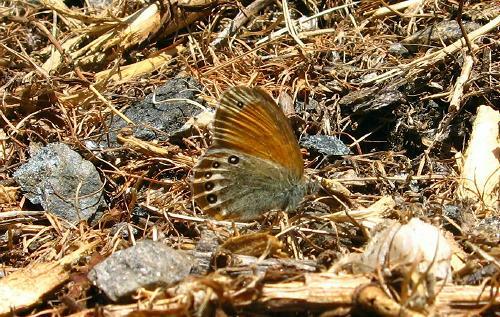 31st: Sunny morning so visited my nearest violet copper site again, where I fear the butterfly has been lost as I didn't see it last year. 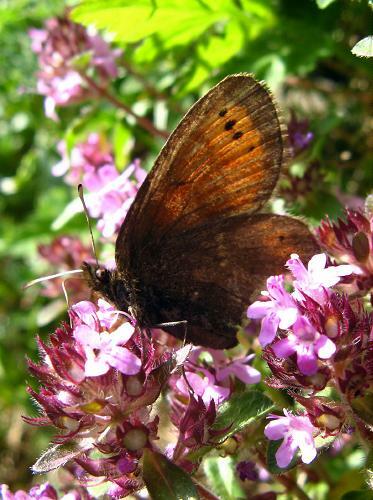 No violet coppers in their usual places so I extended the search to all the surrounding likely habitats. Nothing at all. 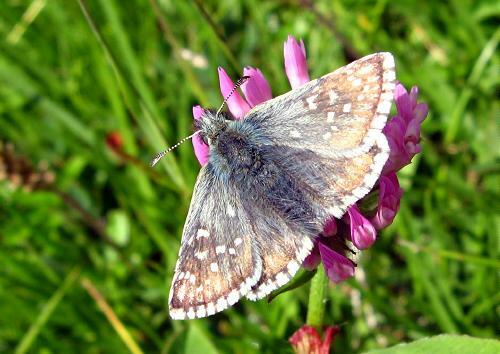 I did find two chequered skippers, a few grizzled skippers, plenty of small tortoiseshells and lots of painted ladies. In the afternoon I walked up the local mountain a little way (to about 1600m). 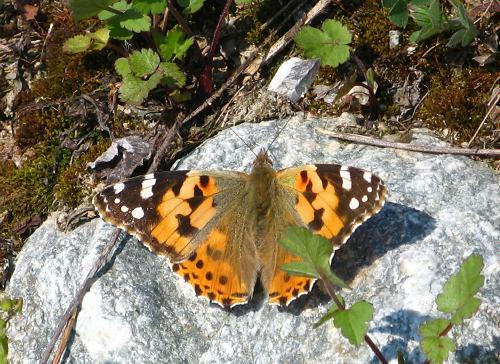 Painted ladies everywhere, and small tortoiseshells, but not much on the wing. 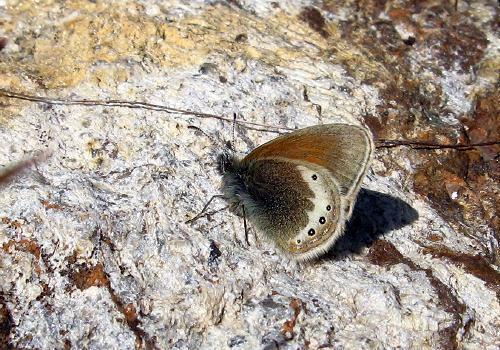 At one spot there were many little blues, at another a few wall browns and back down near Huémoz some large walls. 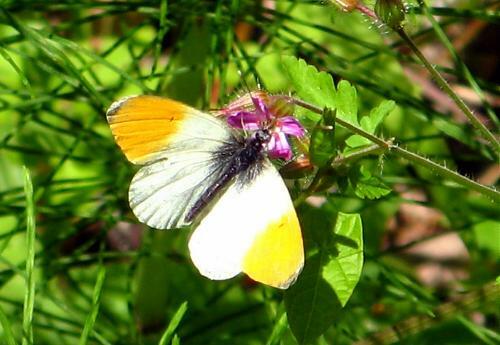 Orange tips were present but no other whites today - I suspect it is between broods. 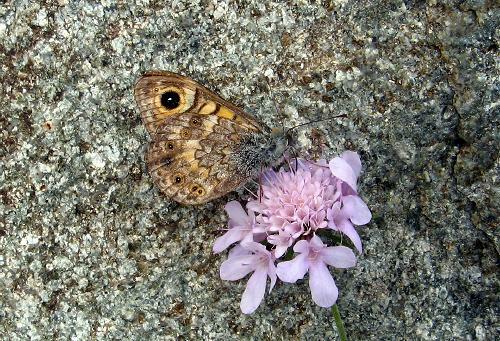 A single dingy skipper was the only other butterfly I saw. 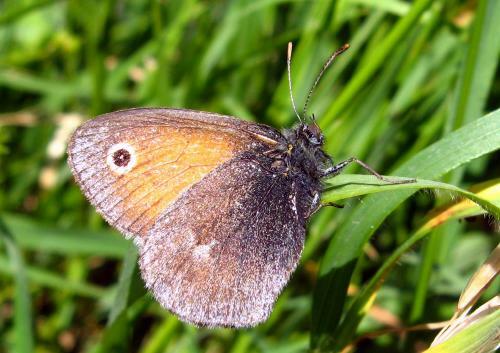 3rd: Found my first meadow brown of the year in Huémoz. I was surprised he was apparently so worn, but on closer inspection it became apparent he must have had an encounter with something that had damaged him. 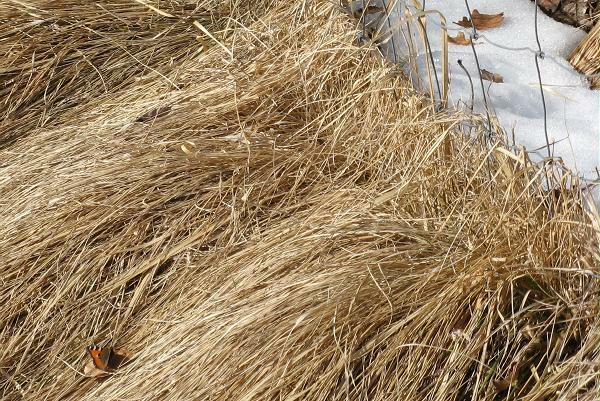 Most likely, this was a hay-making machine, as the meadow where he was had been scythed the day before. He was able to fly. 4th: A lovely warm afternoon. 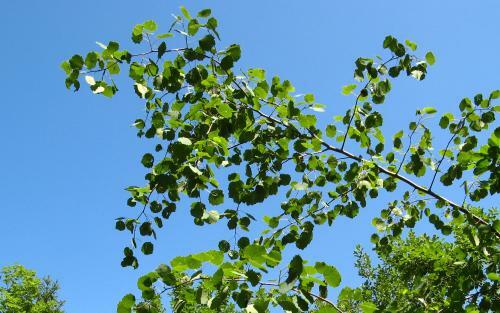 Asha and I explored a new walk near Huémoz, looking in particular for aspen, as the poplar admiral season is fast approaching and so far I haven't seen any aspen locally. 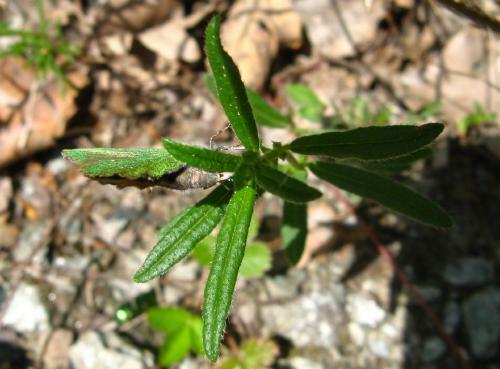 This new walk proved fruitful, with two or three concentrations of the tree, including both established plants and young saplings. 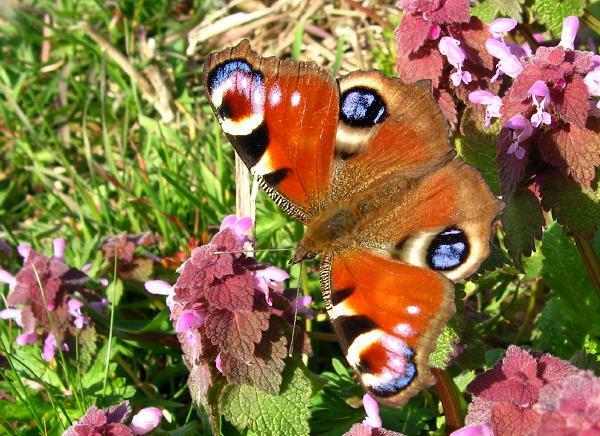 Now I've just got to find the butterfly! 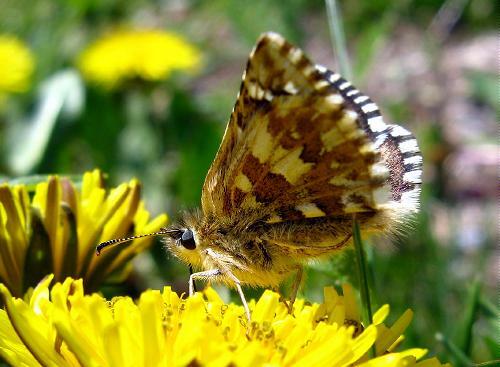 The same rides were bordered with copious quantities of various species of sallow, so I do expect purple emeperors and large tortoiseshells to breed there, even if I don't find the admirals. 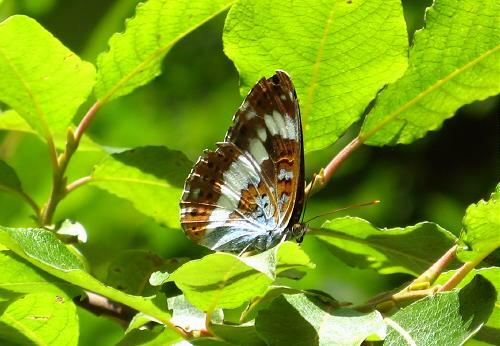 And the presence of honeysuckle was promising for white admiral too. 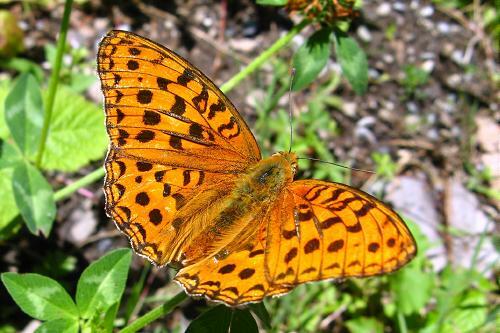 Elsewhere on the walk pearl-bordered fritillaries were plentiful, with Queens of Spain among them, and there were a few commas. 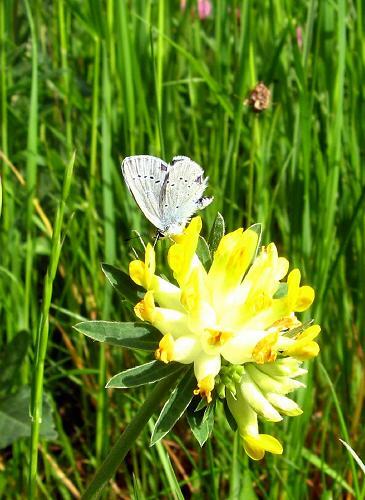 I saw several small and green-veined whites - possibly the first emergers of the next brood - and some small heaths, now rather knackered! 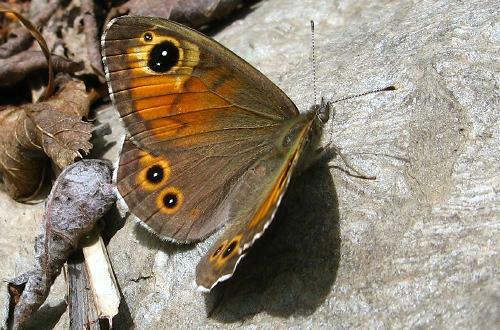 Large walls were common - no woodland browns among them yet. 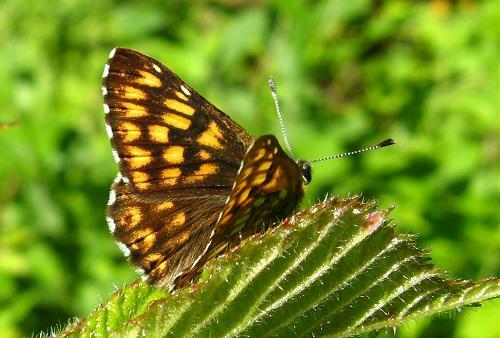 Painted ladies were plentiful too but my best butterfly of the day was this highly territorial Duke of Burgundy, my first for the Huémoz region since I moved here. Here is a closer shot of him. 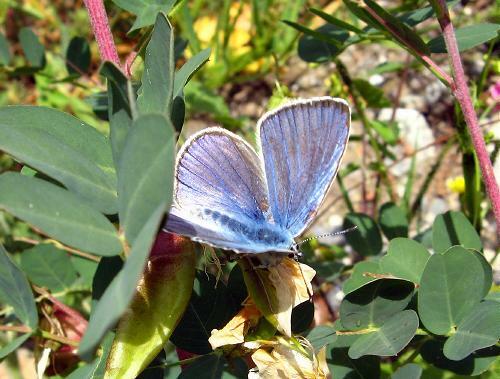 It was particularly nice to find it as the colony I used to know here about 10 years ago is extinct. 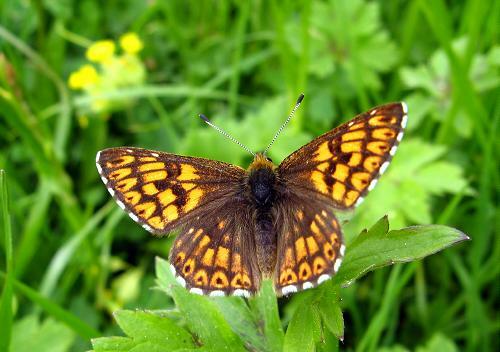 5th: In late morning repeated yesterday's walk and saw all the same species, including Duke of Burgundy in a woodland part of the circuit. By the early afternoon cloud was building up and it was getting quite heavy. 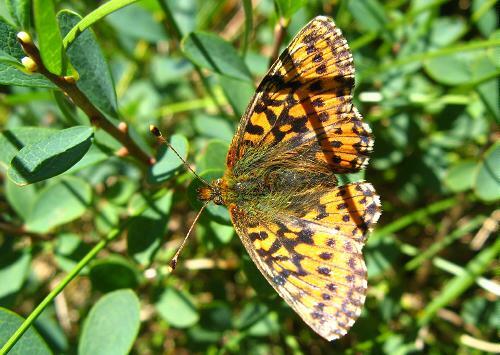 Pearl-bordered fritillaries were becoming torpid and unusually easy to approach, tucked down among the foliage. 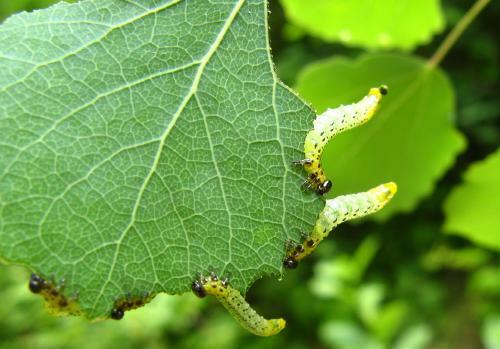 I was vainly examining all the aspen closely for any signs of poplar admiral but did discover these sawfly larvae decorating the edges of the leaves. Here is another picture. 6th: Cloud and rain, but a little sun too in the afternoon. 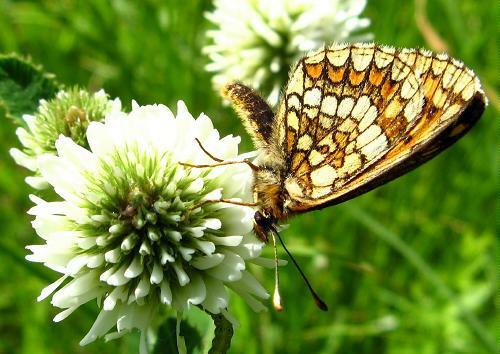 First marbled whites on the wing, from Glutières to Huémoz. 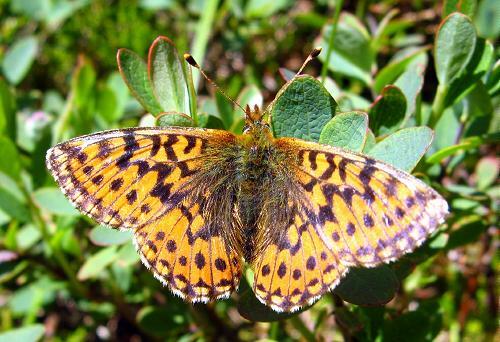 In the evening, went for a stroll around Huémoz with Paul Kipling, out on a butterfly holiday from England, and found my first ever Glanville fritillary for Huémoz - indeed for this mountain. 7th: The weather forecast was for cloud, some rain and possible thunderstorms, so we didn't expect to see too much today. 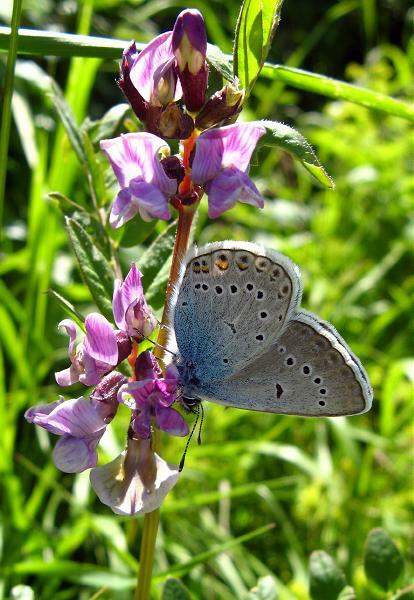 In the event, we saw 44 species, visiting several sites in the Rhône Valley. It was cloudy, and at times nothing flew, but all together a superb day. 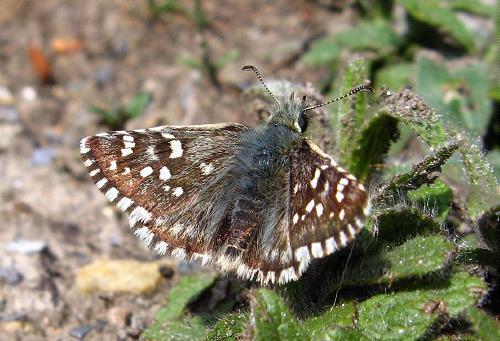 Year firsts for me were knapweed fritillary (just the one - very fresh but slightly damaged), marbled fritillary (several at one site, all pristine fresh), northern wall brown (just one seen but it was largely overcast at the appropriate place), Essex skipper and small skipper (at least one of each and half a dozen or so in total), ilex hairstreak (several pristine fresh males at one site) and pale clouded yellow (I netted a male to confirm identity and there was no doubt at all - I then released it to take a picture and it flew off!). 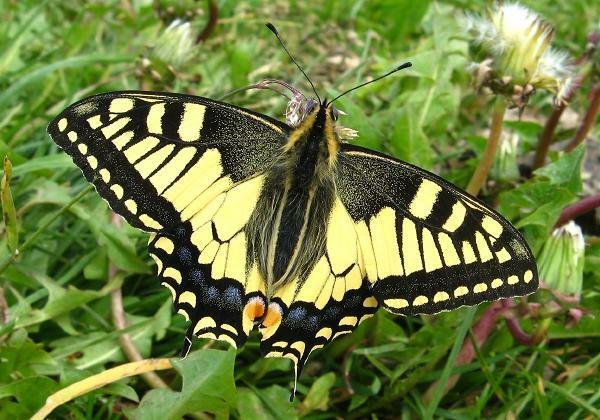 The other species, listed in roughly systematic order were: Apollo (very common at one site, nectaring freely), swallowtail (two individuals), scarce swallowtail (also two individuals), clouded yellow (again, two individuals! ), Berger's pale clouded yellow (several - I didn't firmly identify every Berger's/pale clouded), large white (two or three), small white (several), southern small white (several), black-veined white (becoming locally common), iolas blue (probably half a dozen males and no females at one site, including both fresh and worn individuals - at one point we saw four in the air together), zephyr blue (here is Paul photographing one, and here a male on its foodplant, at a site where there were plenty of males, despite the clouds), little blue (not numerous, but we saw a good number during the day, including mating pairs), Provençal short-tailed blue (numerous, as usual! ), chequered blue (a couple of rather worn individuals at one site), common blue (common), Chapman's blue (several individuals, but again the weather was often poor where we might have seen more), northern brown argus (a single individual), painted lady (not numerous, but we saw plenty during the day), small tortoiseshell (a handful of individuals), comma (two, both looking rather worn), peacock (several at one site and one at another), Queen of Spain (several, including fresh and worn individuals), Glanville fritillary (two at one site), Provençal fritillary (amazingly numerous at one site - more than I've ever seen before - males and females equally present and at times up to four seen together at once - here is Paul with one of them), heath fritillary (just this single individual), Nickerl's fritillary (two individuals at the same site I saw and photographed them last week - the day was old and getting cold and these ones were looking for a place to sleep), marbled white (not common yet, but we saw several), large wall (several passed at various stages of the day), wall brown (three or four), small heath (locally common), large skipper (becoming common), red-underwing skipper (just the one seen today), safflower skipper (locally common, though in the cool weather never numerous), olive skipper (just this one seen - and here), dingy skipper (several). 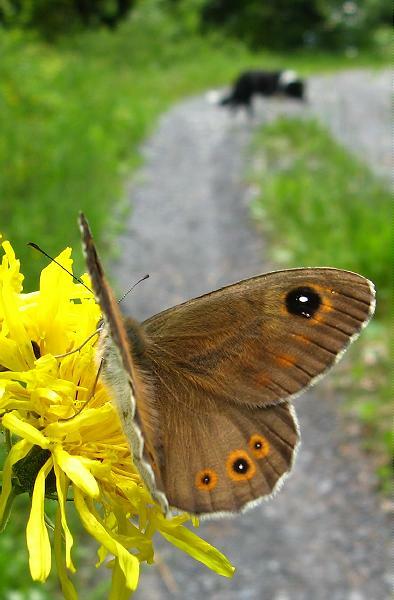 8th: Early morning sun brought out my first ringlet of the year on my dog walk at about 7.30 am. 9th: Mixed weather, but generally cool and wet. 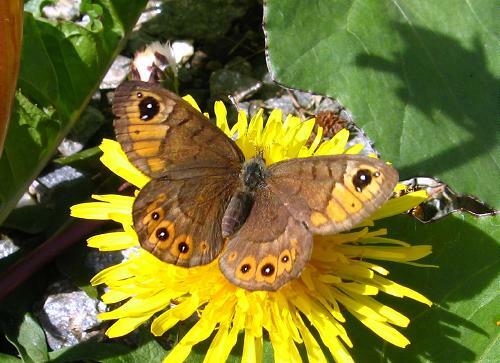 Large wall browns were able to take advantage of any sunny patches - here is a female - and were the most numerous butterfly seen on my lunchtime walk. 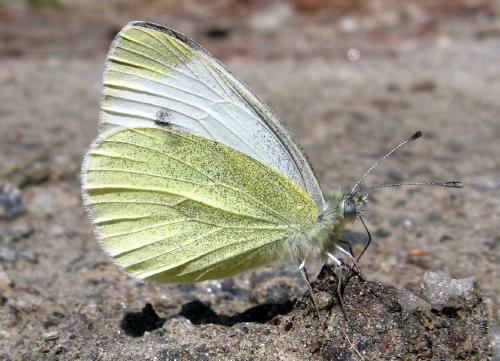 Wood whites were about, now looking fresh and bright, and my first second brood green-veined whites were flying too. 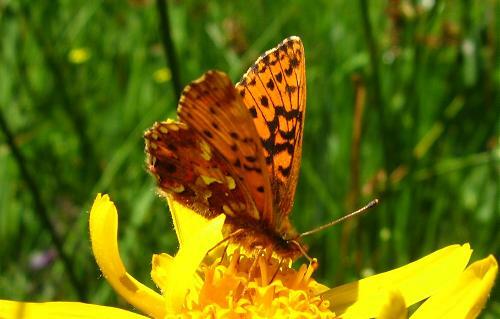 Here is a heath fritillary from a meadow near my house. 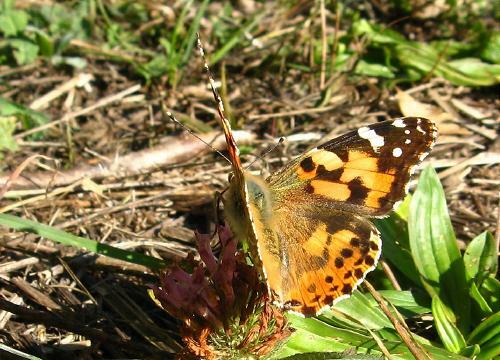 When I returned home from school in the early evening, four painted ladies were on the tarmac outside my house. 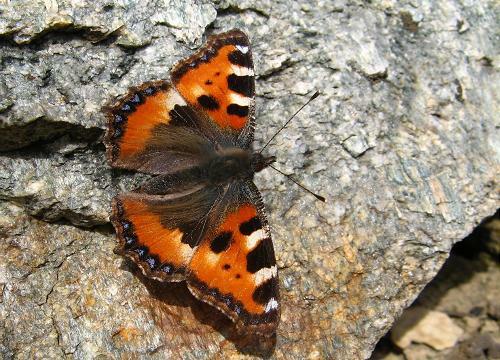 Small tortoiseshells have been very present for the last few weeks and were also flying today. 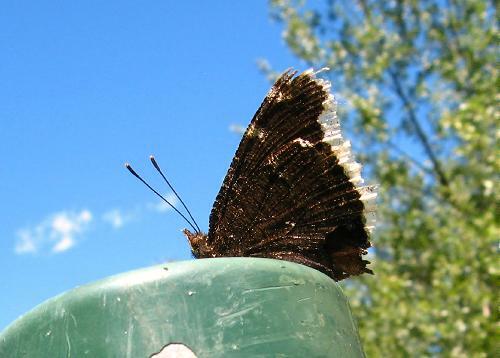 10th: Bright weather - much the same butterflies as yesterday. 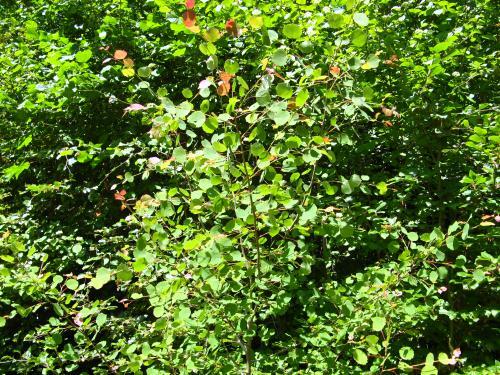 I revisited the woodland ride with aspen and sallow in the hope that an admiral or emperor might be flying but it seems still too early (or they don't fly there) and just large walls and whites (wood, green-veined, large) were in evidence. 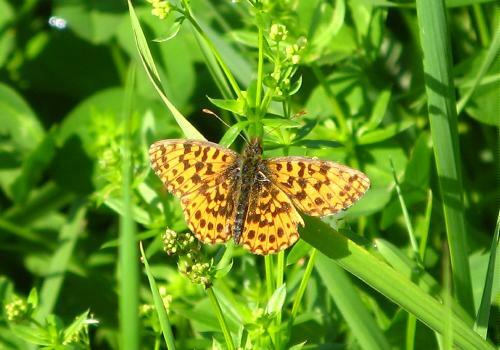 Pearl-bordered fritillaries were common in the woods (as they have been for the last week or so) and I saw at least one ringlet and one meadow brown during the day. 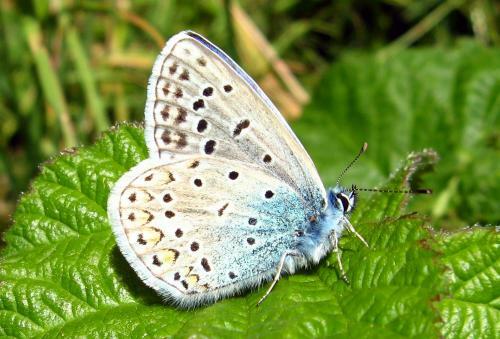 Several blues - either common or Chapman's - were flying in the meadows and I saw one or two commas (two sightings of what might have been the same individual, in both cases a hibernated individual). 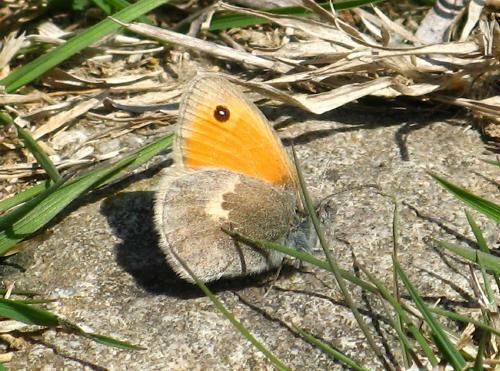 12th: Lunchtime walk as recently, with all the same species (pearl-bordered fritillary, comma, wood white, large white, green-veined white, painted lady, small tortoiseshell, small heath, large wall, wall, speckled wood, Chapman's blue, common blue). After school I tried my local violet copper site again, with continuing lack of success. 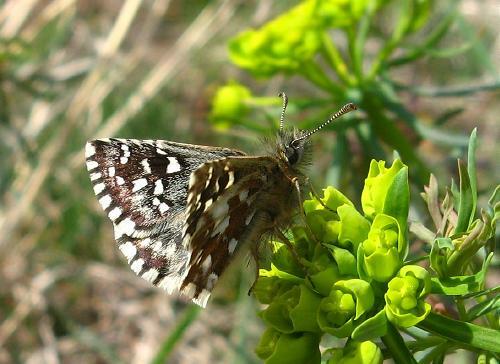 There were chequered skippers and dingy skippers there, and a sooty copper (which had me excited for a moment), as well as painted ladies, small tortoiseshells, plenty of little blues, a mazarine blue and small heaths. 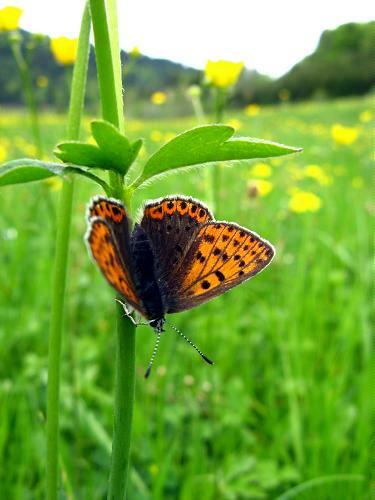 But no violet coppers even extending my search to all the surrounding suitable areas. Tomorrow I shall try the other 'batch' of local colonies, which shouldn't have been affected by the interminable building work in the Villars region. 13th: Instead of going up the mountain, which I shall reserve for tomorrow, I set off down the Rhône Valley with Matt Rowlings, on a bright and ultimately very hot day. 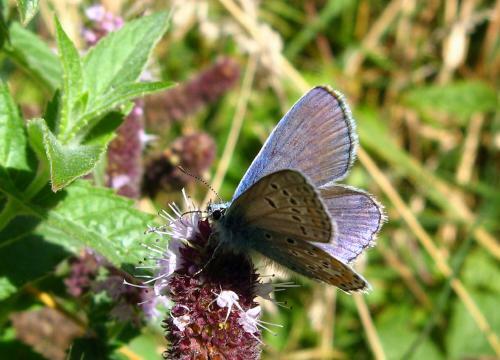 We saw 65 species of butterfly in total, at two or three sites, though nowhere were butterflies particularly numerous. 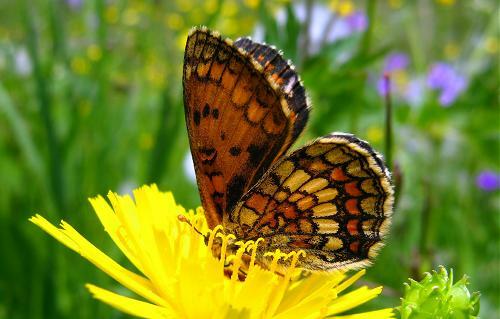 The relatively high total seemed to be because spring butterflies were still hanging on, while summer butterflies were now emerging. 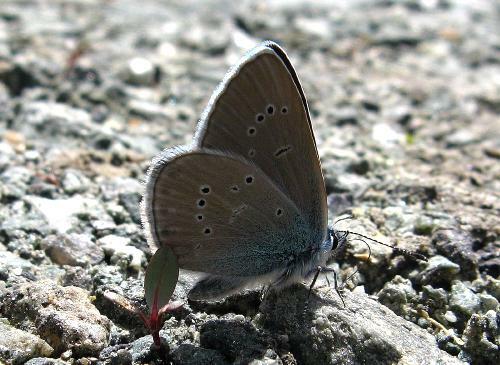 New for the year were silver-studded blue (a small colony at one site), great sooty satyr (just a single individual seen, and in flight, but no possibility of confusion! 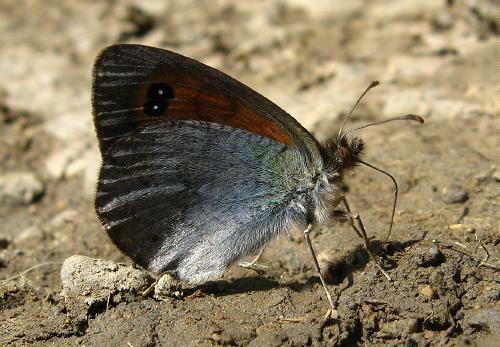 ), purple-shot copper (two or three at one site and two at another - all males), large blue (two or three individuals at one site), southern white admiral (three at one site, two at another - all evidently males, proudly defending their territories), lesser woodland grayling (for want of a better name - the species is Hipparchia genava, which is now considered a separate species from rock grayling - we saw three or four of these, all at one site), marbled skipper (two or three very fresh individuals, at two sites) Oberthür's grizzled skipper (here is the best I could get of an underside - just this one, fresh, individual - the first I have seen of this species in Switzerland [EDIT: there is now some doubt as to whether this individual is really Oberthür's grizzled skipper, or whether it might possibly be a small, bright, large grizzled skipper]), dark green fritillary (just this one) and high brown fritillary (just this one). 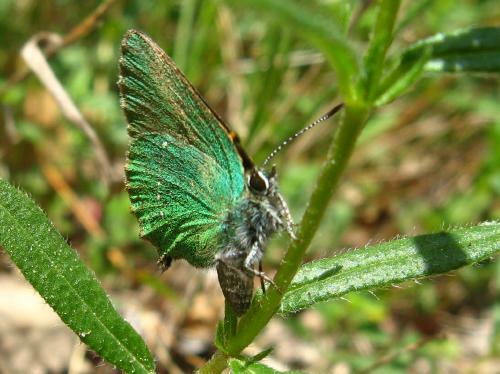 Hangers on from the spring included orange tip, green hairstreak (just one), two Camberwell beauties, Osiris blue (one, possibly more, at one site) and grizzled skippers (two, I think). 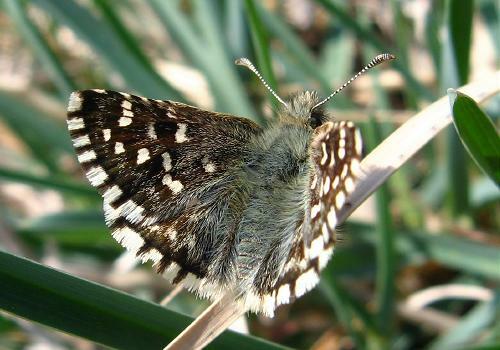 Some spring species were already in a strong second generation - violet fritillaries, for example, at one site, and wood whites too, I think (i.e., I think they were second generation). 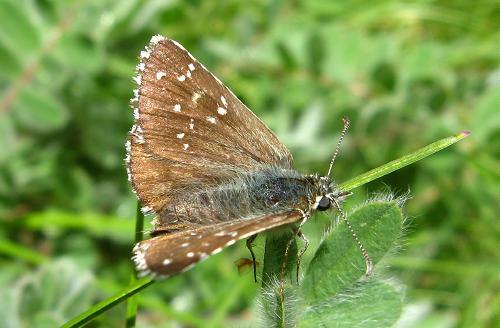 The other species seen, in roughly systematic order, were: Large, small and Essex skippers (large the commonest, but the other two present in many places), dingy skipper, mallow skipper (just one seen), chequered skipper (one), safflower skipper (still common - many very fresh but some tatty), red-underwing skipper (several), olive skipper (just one, amazingly, after seeing so many recently), little blue (common), iolas blue (several males and probably a female at one site, followed by one or two males seen in flight only at another), Amanda's blue (several, in one extended region), Adonis blue (several, many now looking rather weary), common blue and Chapman's blue, zephyr blue (rather few, at one site), brown argus, northern brown argus, turquoise blue (nowhere common, but several seen during the day), ilex hairstreak (increasingly common at one site), knapweed fritillary, Provençal fritillary (less numerous than last weekend but still very much in evidence - here is an upperside), Nickerl's fritillary (in the end, just one seen, at a site where they were common three weeks ago - a tatty individual I photographed thinking it was Nickerl's is undoubtedly a heath fritillary), heath fritillary (a few), Glanville fritillary (locally common), marbled fritillary (getting commoner at two sites), Queen of Spain fritillary, spotted fritillary (one or two only), Apollo (locally very common), scarce swallowtail (locally common), red admiral (one), painted lady (lots!! The one pictured had just been apparently laying eggs on thistle, but we couldn't find the eggs and she doesn't look very pregnant...), comma (several sparring presumed males at two sites), small tortoiseshell, large white, small white, green-veined white, black-veined white, clouded yellow (two or three), Berger's pale clouded yellow (locally common, but less so than earlier in the spring), brimstone (a single individual seen), wall brown (several), large wall brown (several), small heath (all looking rather tatty), meadow brown, ringlet, and finally marbled white (abundant at one site, thoroughly enjoying the white clover). I hope I haven't left anything out!! A great day! 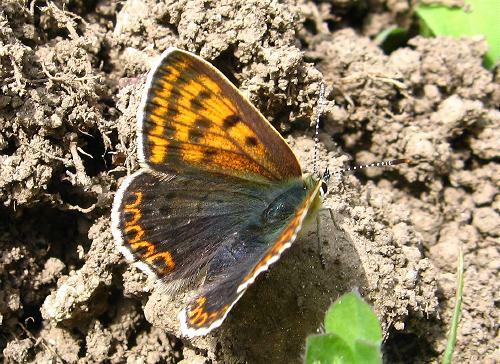 14th: Target species for the day was violet copper. Having concluded that my most accessible local colony is now extinct (deviation of water courses, general land moving and extension of a housing estate) I headed to higher (but still local) colonies. 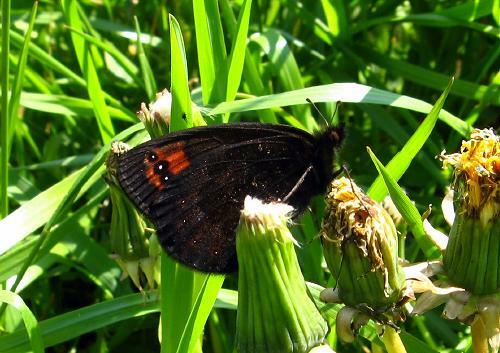 There, the species was still alive and kicking, but also nearing the end of its flight period. I quickly found this female, oviposturing (I found no egg on that leaf) and without venturing across the wetlands and crushing the plants easily saw about 5 more, including this male and this one. All individuals were well past their prime - I saw none even remotely fresh. 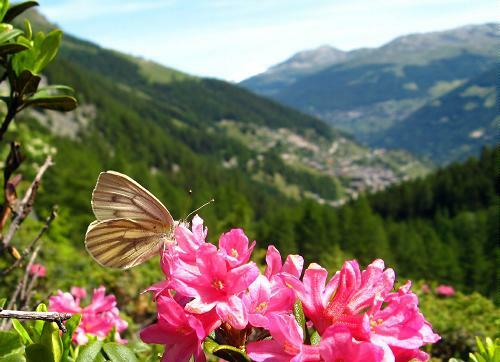 As I had to go up, and as it was a lovely day, I did a circuit of some real alpine spots, between 1800m and about 2200m before dropping down to the violet coppers. 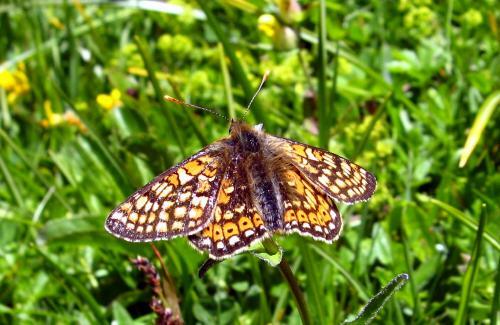 Marsh fritillaries were common at the high sites (as they were at the violet copper sites) and I found my first chalkhill blue of the year at about 1800m. 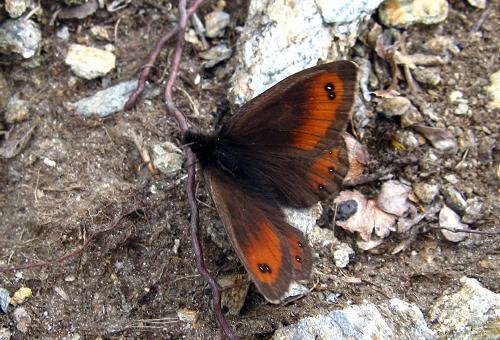 Bright-eyed ringlets were locally common and I saw a few Alpine heaths. 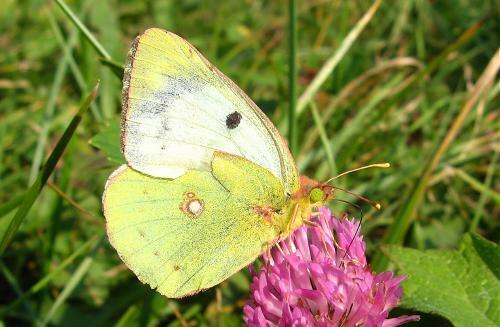 In total I saw three mountain clouded yellows. 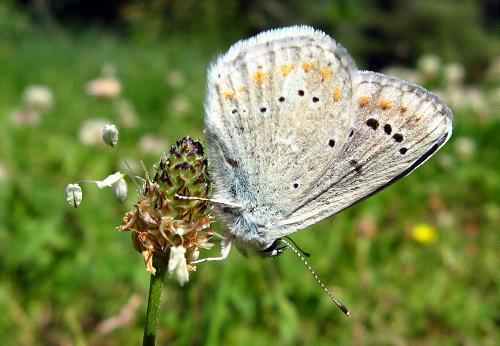 The best insect at altitude, though was this male clouded Apollo (and here), freshly emerged and very briefly willing to sit around for photos. He rapidly changed his mind, though, and disappeared over a precipice without a goodbye. There were a lot of people on this mountain ridge, enjoying the fantastic weather, and it was difficult to watch butterflies. 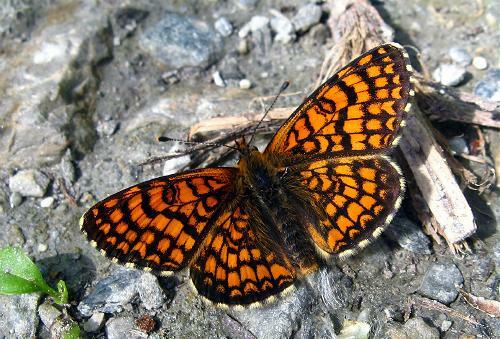 I'm sure I had several Shepherd's fritillaries and one Alpine argus, but there was no opportunity to confirm these. 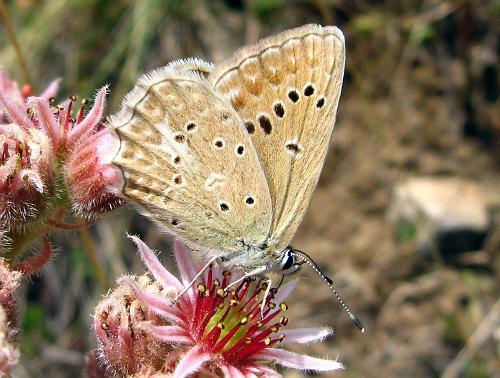 There were several small, dark Erebia right at the top, which could have been bright-eyed (this was a different place from the confirmed bright-eyed, above) but also could have been the very first blind ringlets - a species that flies there. 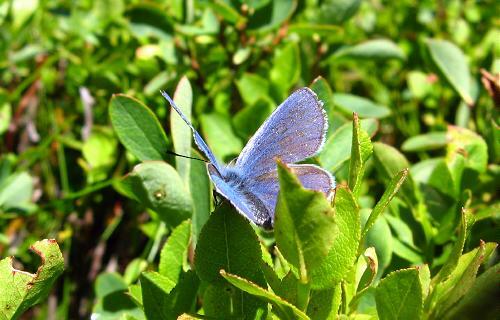 Little blues were abundant everywhere up the mountain. 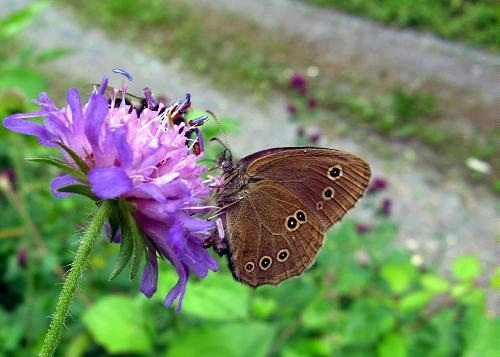 I saw a single dewy ringlet at a site where there will be hundreds within a week or two. 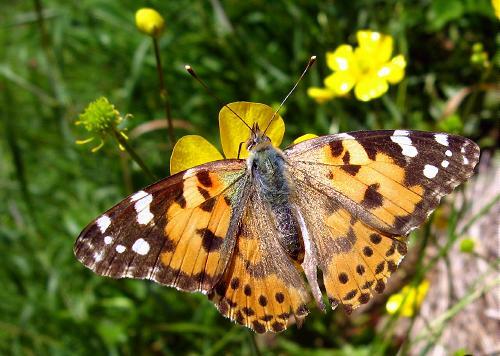 Painted ladies and small tortoiseshells were ever-present. 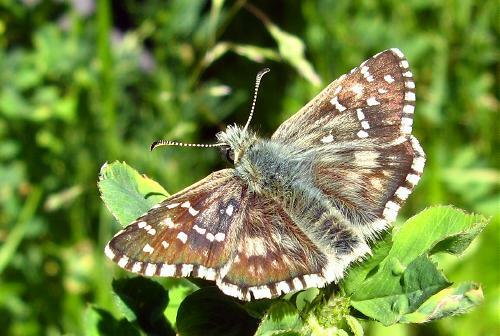 Dingy skippers were common, and grizzled skippers at one place. 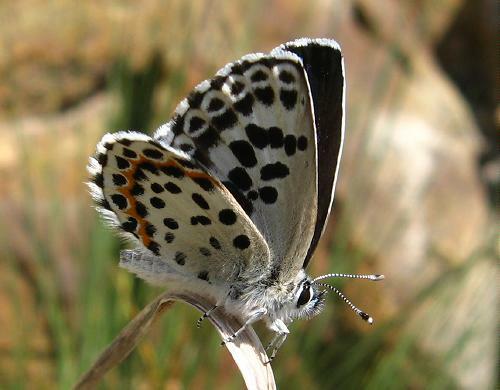 I saw at least two Pyrgus that were not grizzled skippers, but again the number of people made it difficult to do my stuff. 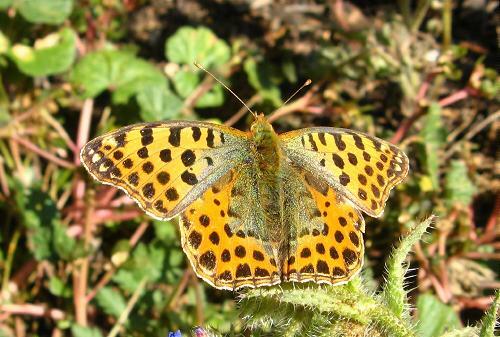 Returning home from the violet coppers, I was passed by a fritillary I took to be lesser marbled but which never stopped. 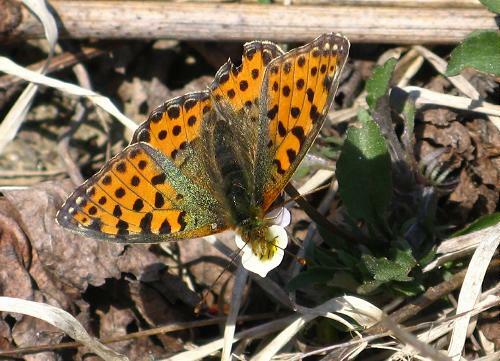 Nearer home I saw this Titania's fritillary and the other one could well have been this species. 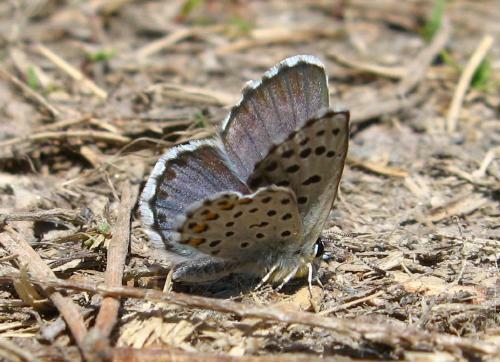 Locally, silver-studded blues were abundant on my walk home. 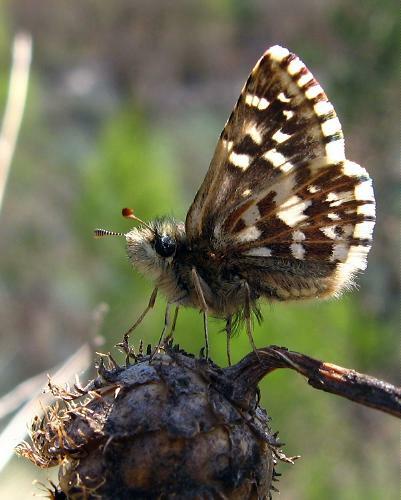 Other species seen today were speckled wood, meadow brown, ringlet (now locally very common), northern wall brown (at altitude locally common but looking rather tatty) large white, wood white, chequered skipper, small heath, pearl-bordered fritillary (this one was at over 2000m) and green hairstreak (also at over 2000m). 16th: Rain and sun. 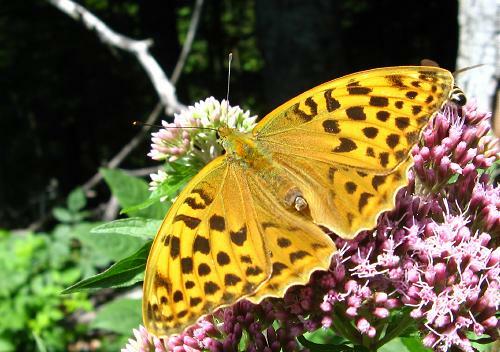 A dark green fritillary was flying in Huémoz at lunchtime. 17th: After a few rainy days the sun returned today. 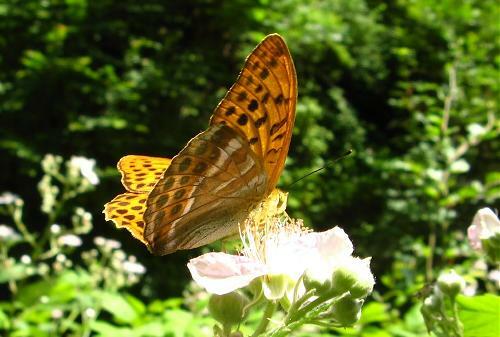 At lunchtime I visited my new, local woodland site and found the first silver-washed fritillary of the year on the wing. 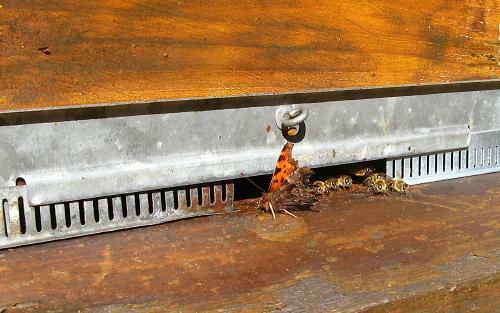 I saw several commas, and although none were hutchinsoni I now feel they have to be this year's brood, not hibernators. 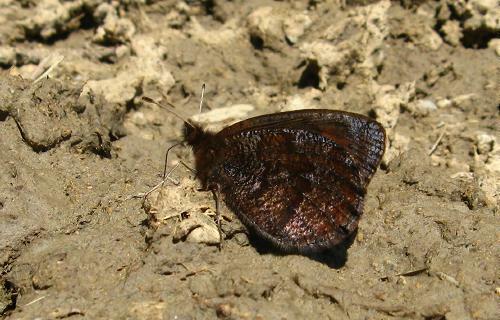 My best find was a single woodland brown - a species I had hoped to find here. It brings the total number of colonies I know of in my region to four, and I expect there are more. The single individual I saw today was elusive and kept sitting high in trees, behind leaves, making photography impossible, but I will watch the colony carefully and get photographs soon. 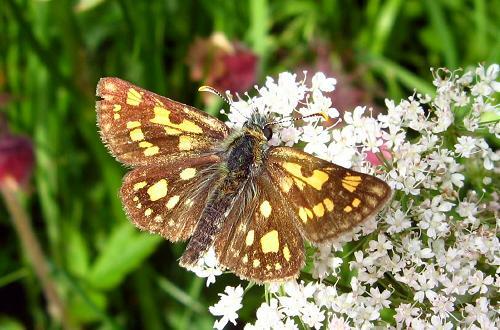 Other species flying were large white, orange tip (two males), chequered skipper, ringlet (now very common), holly blue (my first summer brood hollies of the year), meadow brown, speckled wood, wood white and dark green fritillary. 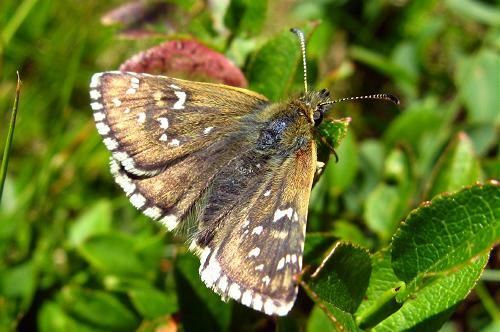 I think the Dukes are finished here, now, though their numbers were always small and it is difficult to be sure. 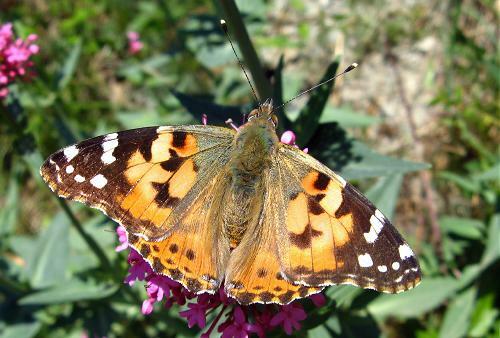 Painted ladies and small tortoiseshells were common. 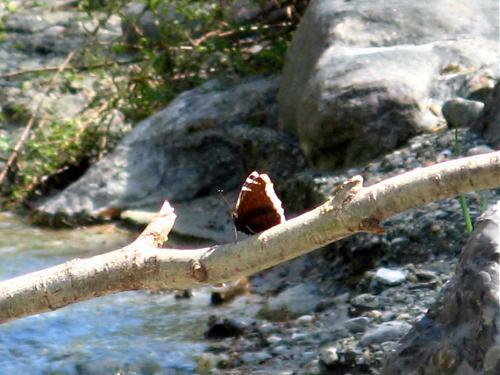 18th: The same lunchtime walk produced two woodland browns today - and one allowed me close enough to get this record shot. 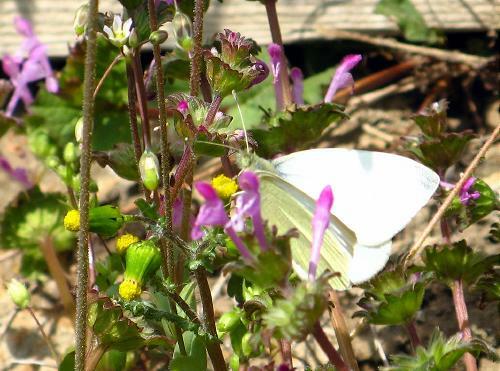 Even more interestingly, a single second generation southern small white was flying nearby, my first for the region. 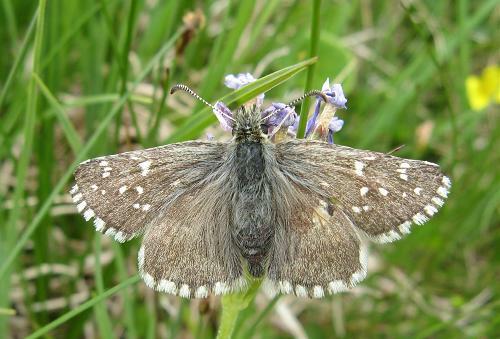 Ringlets and meadow browns were common and four fritillaries were flying: dark green, silver-washed, pearl-bordered (now very faded) and high brown. 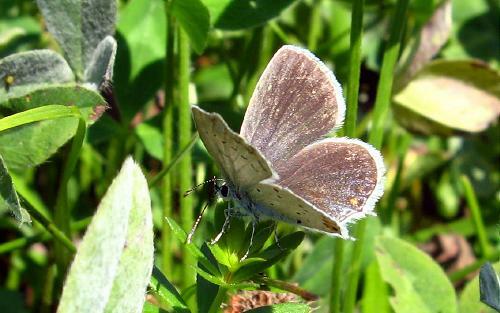 Again, two commas were on the wing, a large white or two and a few second generation wood whites. 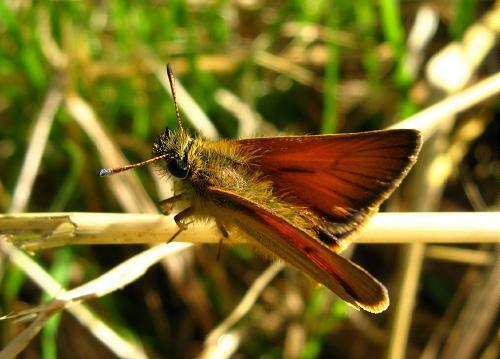 In the morning and on my lunchtime walk I found Essex skippers - no small skippers here. 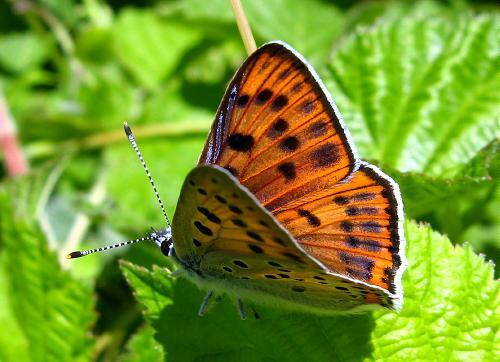 Painted ladies and small tortoiseshells were frequent, as ever, a single holly blue put in an appearance in the woods, common/Chapman's blues were flying in the meadows and a few presumed heath fritillaries flew past. 23rd: Mostly overcast and neither warm nor sunny - in fact very cold in the morning. 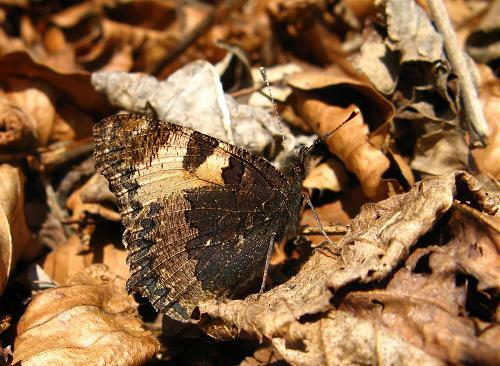 Nevertheless, painted ladies were flying and I saw my first white admiral of the year in a local woodland ride. 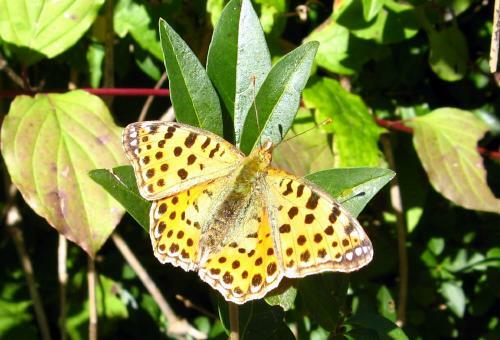 24th: I had a day off school and decided to go looking for Asian fritillaries. 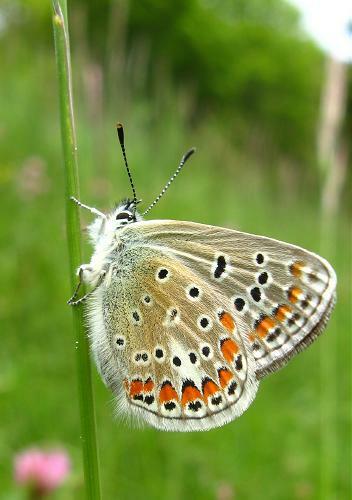 I went to a site where I saw them in good numbers on 23rd June in 2007, nectaring on abundant thyme. 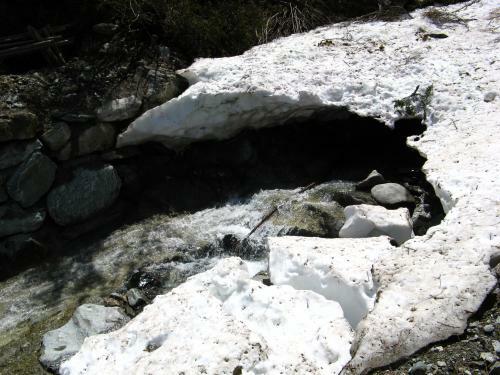 Today the same site (about 1800m) still had considerable snow patches and there was very little thyme. 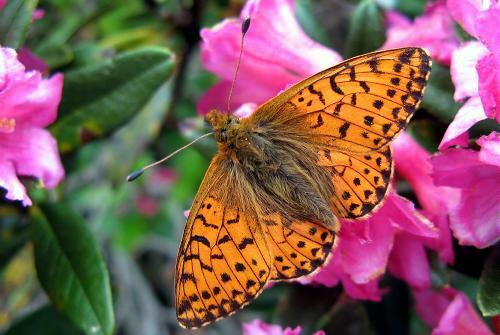 In four hours I had just four brief sightings of Asian fritillary - which might all have been the same insect - and on only two of those occasions did the butterfly pause briefly on its foodplant, blue honeysuckle. Luckily, I was able to get a very poor 'proof' shot from about 15ft on one of these occasions! Here it is. 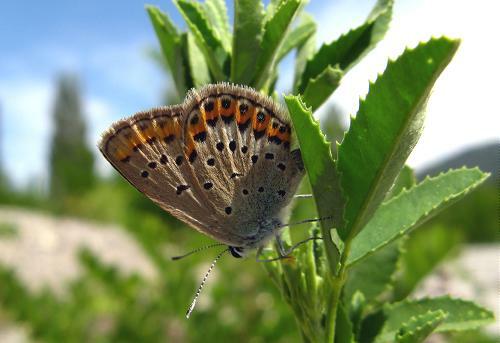 I conclude that at this altitude it is still early for the species this year. I did see plenty else, though. 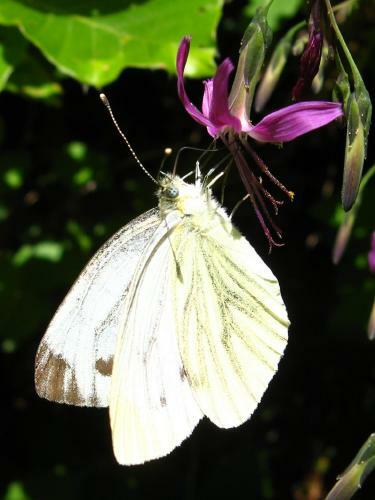 Mountain green-veined whites were very common, both males and females. 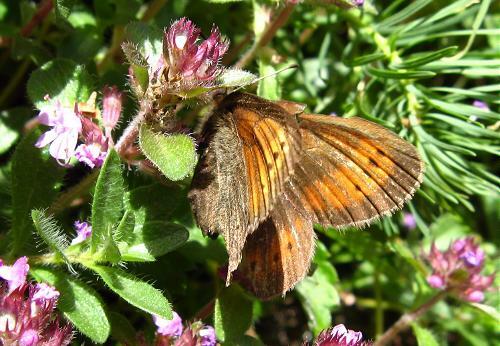 Almond-eyed ringlets were about, but not yet common, and flying with them but in far greater numbers were northern wall browns. Here is another. 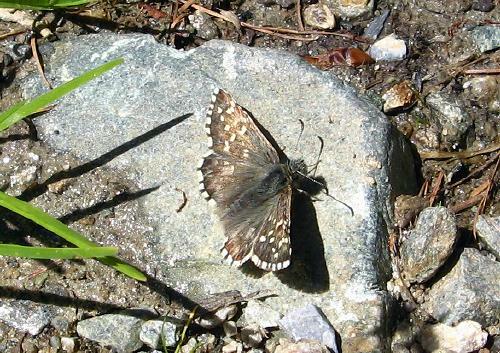 There were plenty of very fresh alpine graylings, two or three slaty blue, pristine fresh cranberry blues, two dusky grizzled skippers (neither staying put while I tried to get the photo!) 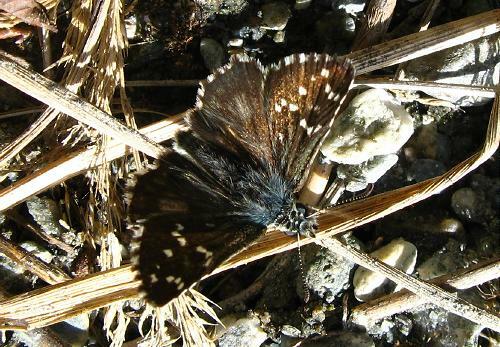 and at least two alpine grizzled skippers. 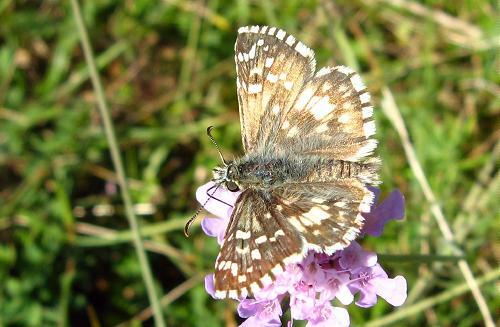 Other species seen were swallowtail (half a dozen in total), chequered skipper (very common), pearl-bordered fritillary (common), false heath fritillary (several), alpine heath (locally common), dingy skipper, grizzled skipper (both common), large skipper, little blue (locally very common), large blue (two or three), Amanda's blue (I saw perhaps 4 in total, at two sites over 1km apart - here is another), small tortoiseshell (common), peacock (a single, post hibernation individual still around, and looking amazingly good for its age!! 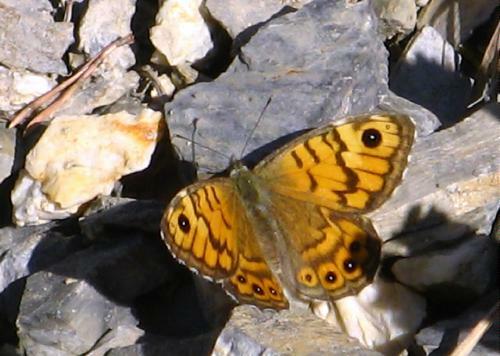 ), painted ladies (obviously), large wall brown (in a village, not at the true alpine site), and orange tips (three males). 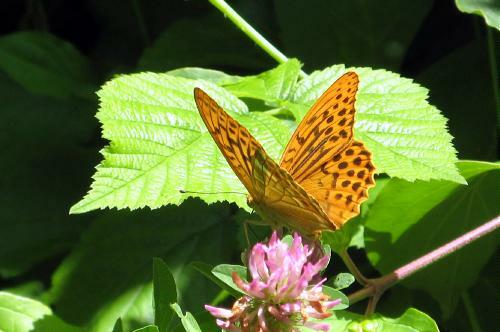 25th: Overcast all morning, but a few butterflies about on my lunchtime dog walk. 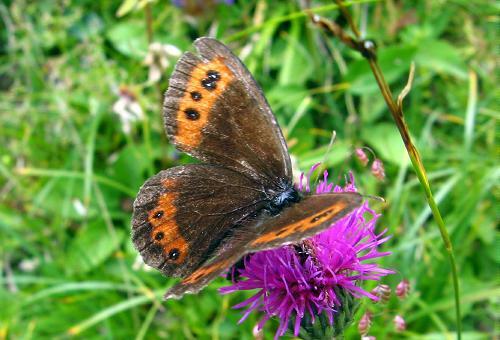 Ringlets took no notice of the weather, and nor did meadow browns. 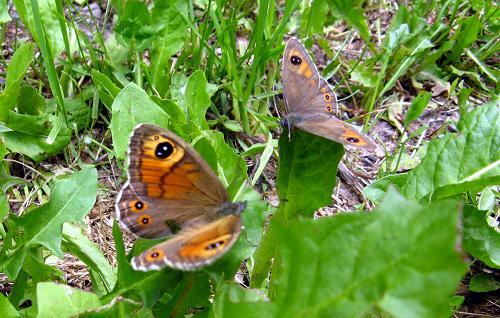 A few woodland browns were flying, at the site I discovered recently and also one much closer to home. 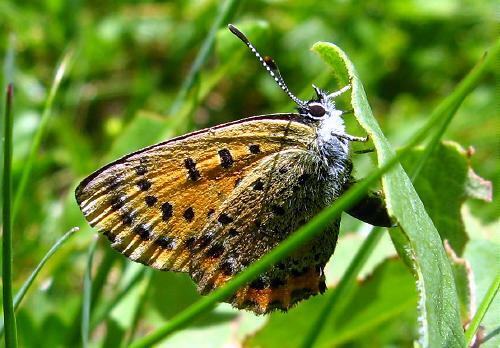 I saw two white admirals, both very fresh, a few large walls, a silver-studded blue or idas blue (couldn't get close enough to see), small tortoiseshells, painted ladies, wood whites, an orange skipper, this orange moth (Angerona prunaria) and a dark green fritillary. Not a lot, but not bad for a cloudy walk! 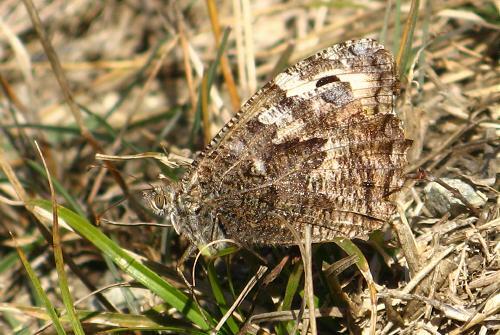 Oh, and I nearly forgot - I saw my first great banded grayling of the year on that walk too. I was reminded by a second one flying past the window just now, moments after I posted my write up for the day!! 26th: Another day of very mixed weather. Mostly overcast, but with some sun at lunchtime and then rainstorms later. 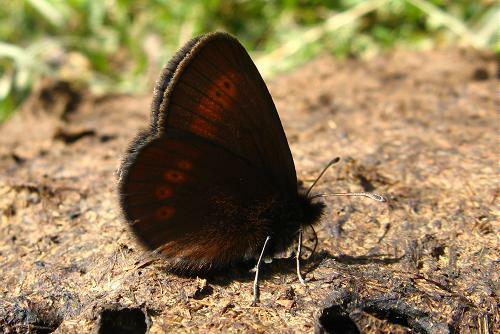 I caught the lunchtime sun to find some local butterflies, including my first confirmed Arran brown of the year (I forgot to mention yesterday that I had a probable Arran brown then). I saw two in total today. 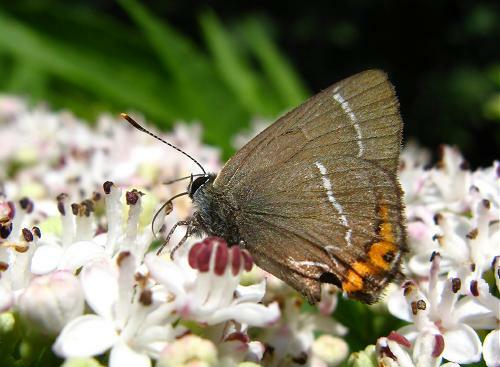 More exciting was my first white-letter hairstreak of the year. 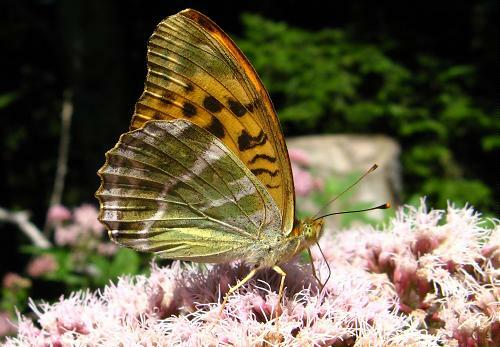 This is one of my all-time favourite butterflies. I saw just one, but it was very fresh, and I suspect there is a good colony here. 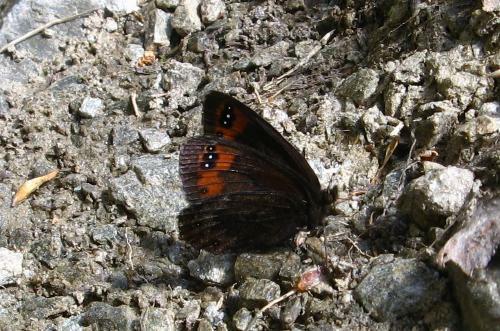 Woodland browns were much more numerous than recently. I saw at least 10 in the usual ride (here is another) and a single one in a different place (same place as yesterday, much closer to home). Other species on the wing were white admiral, of which I saw probably 3, probable marbled fritillary, dark green fritillary, a very interesting but unidentified blue (I was being chased by a forestry vehicle cutting the verges of the ride and this made me lose the blue), wood white, green-veined white, large white, comma, small tortoiseshell, ringlet, meadow brown, large skipper and some golden skippers. 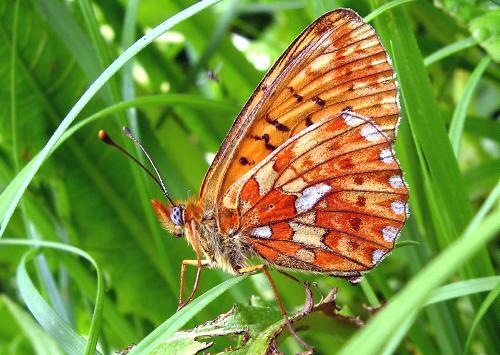 My local pearl-bordered fritillaries seem to have stopped flying now. 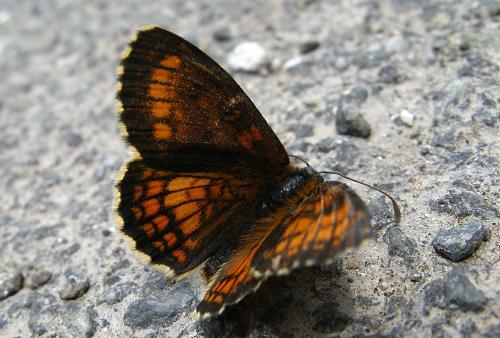 27th: It rained on my lunchtime walk - yet another overcast day - but a few butterflies mangaged to fly. 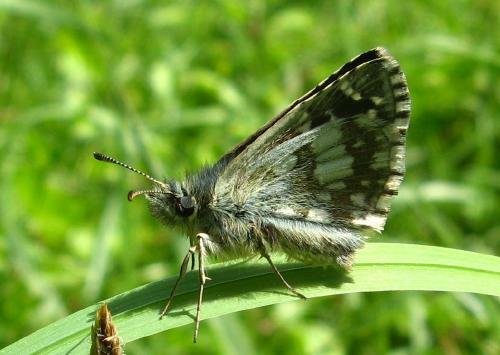 Marbled whites were most prominent, with ringlets and meadow browns too. 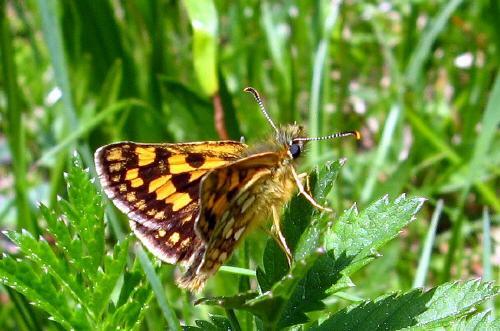 Orange skippers (mostly Essex) buzzed around in the grassy regions and I saw both dark green and high brown fritillaries. For the whites, large white, small white and wood white were all about. 28th: Early morning walk to local woods in bright sunshine. 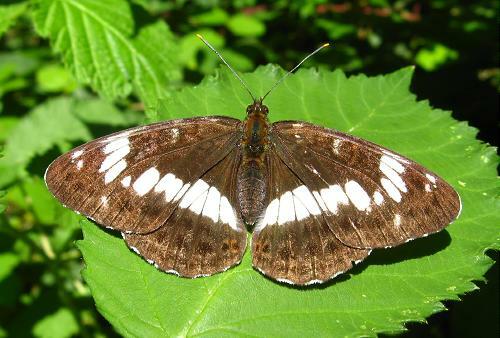 Many white admirals were around, sunning on leaves and taking minerals on the ground. 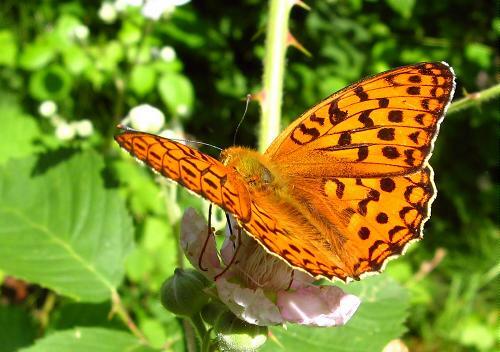 The woodland browns were not up yet but high brown fritillaries and several marbled fritillaries were avidly enjoying the brambles. 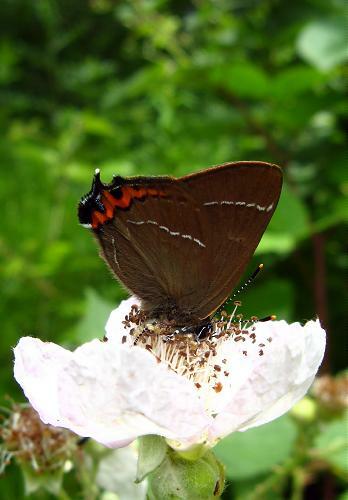 Probably saw a couple of white letter hairstreaks flitting around at the top of trees. 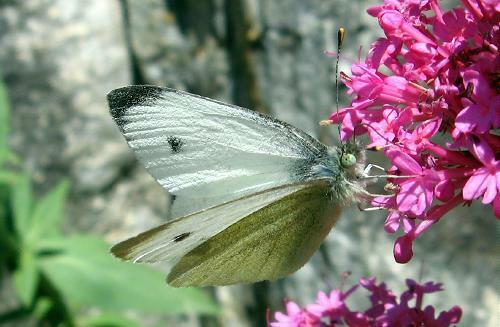 Also large white, wood white, small white and green-veined white. 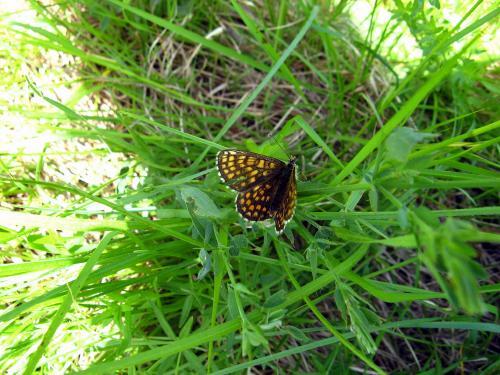 Probable dark green fritillaries were flying over the meadows. 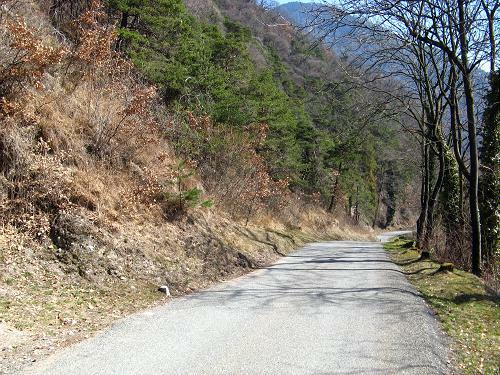 In the afternoon walked up the Col de la Croix road with my parents. 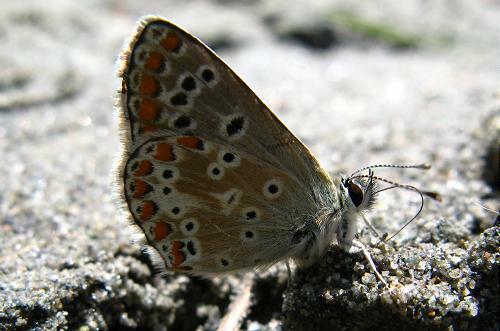 Silver-studded blues were common and there were several geranium arguses (here is another view of the same female). 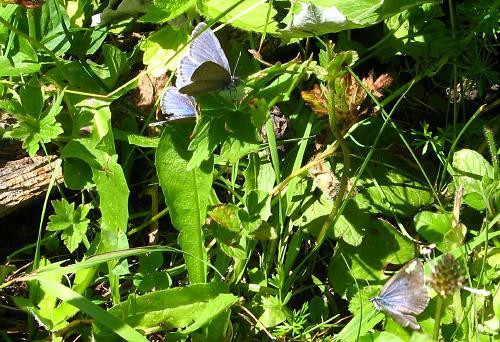 Neither of these species seems to fly in the Huémoz region, so I have recorded them rather late (I saw a single geranium argus much earlier in the valley, but none at altitude). 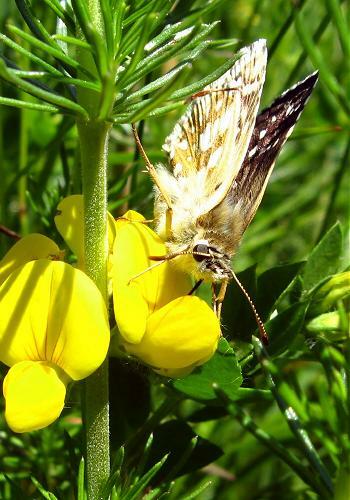 Large and small whites, marbled whites, painted ladies and the occasional red admiral were flying. Walking back to Huémoz afterwards I found this woodland brown at yet another new place, and also got my first lesser marbled fritillaries of the year. 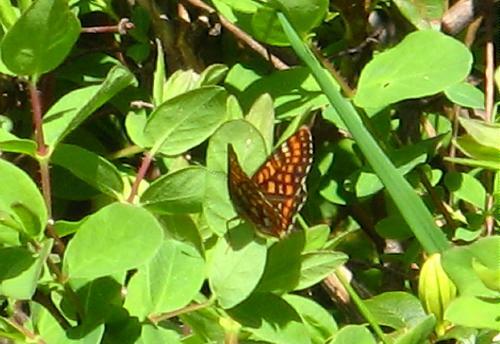 I think second brood violet fritillaries were also flying but I didn't confirm any identities. 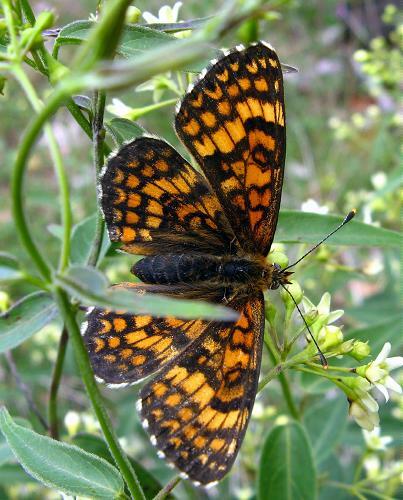 I did confirm heath fritillary. 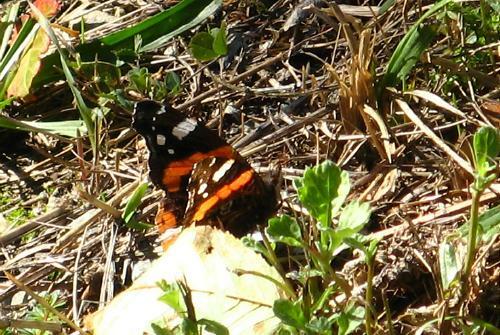 There were also dark green fritillaries, high brown fritillaries, small skippers, Essex skippers, ringlets, meadow browns and this beautiful, fresh red admiral. 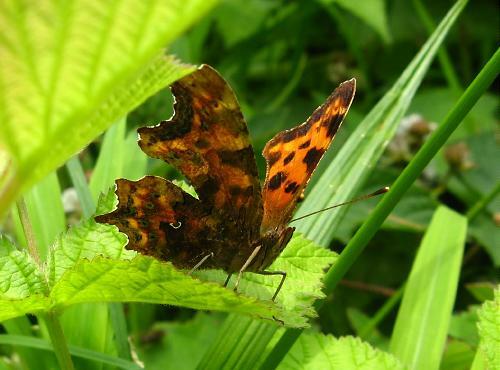 This is my first hutchinsoni comma of the year - very fresh and bright! 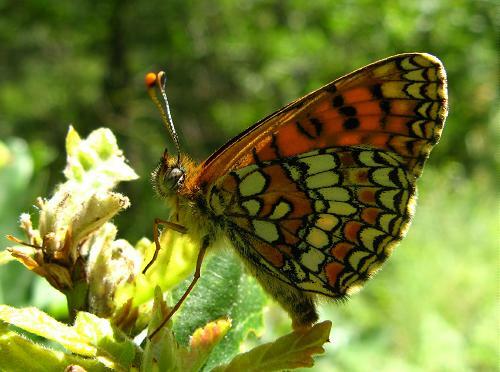 29th: My first Niobe fritillary of the year during a lunchtime walk in Huémoz. 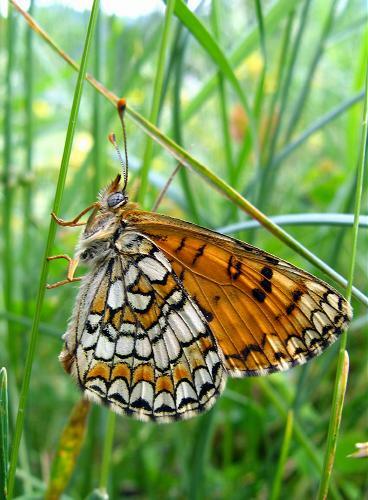 30th: Great banded graylings are now common around Huémoz, where lesser marbled fritillaries are also flying. Went up the mountain today with my parents, where we enjoyed sun until a thunderstorm and eventually torrential rain stopped play. 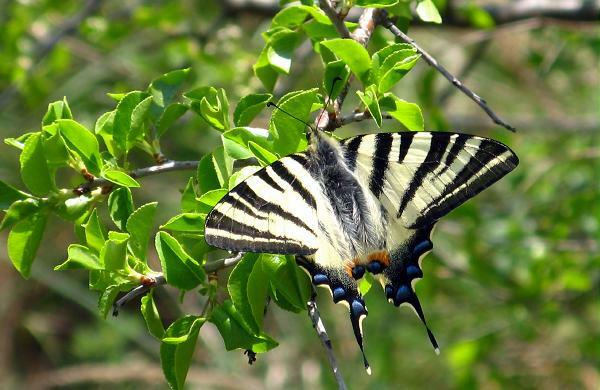 This swallowtail was hilltopping and nectaring. 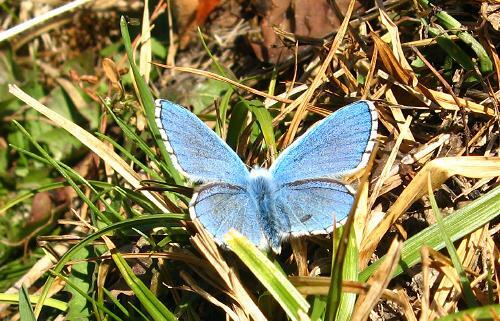 Eros blue was new for the year, as was shepherd's fritillary (though this was almost certainly flying the last time I came up here - I just didn't get a chance to identify one formally). Clouded Apollos seemed to be at their peak, with up to five visible on the wing together at one point. It was a rather steep and tricky point, though, and I couldn't get even one photo! 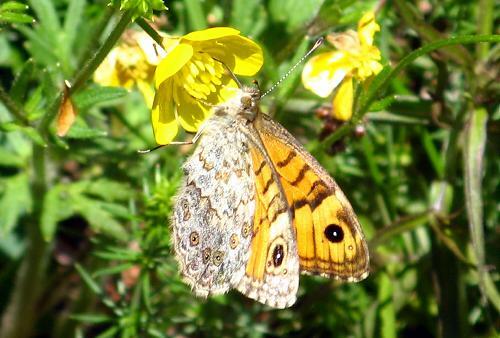 Small tortoiseshell, bright-eyed ringlet, painted lady, mazarine blue, alpine heath, northern wall brown and dozens of impossible dewy ringlets (impossible because they never stopped long enough for a good photo) were also flying. 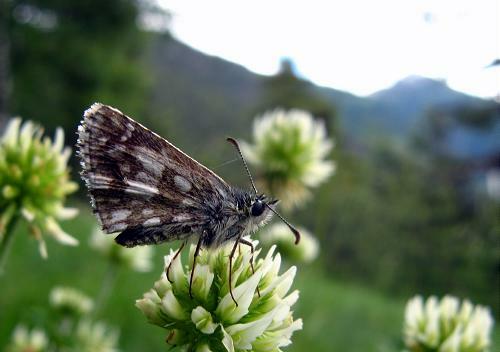 I netted (and released, of course) this olive skipper at over 2000m. Back home it seemed there was a break in the weather, so I went off to the woods, where several white admirals, lots of woodland browns and a few whites and ringlets were flying. But then the torrents came down again! 1st July: I had meetings in the morning so we went up the mountain in the afternoon. It rained, then thundered, then rained some more. 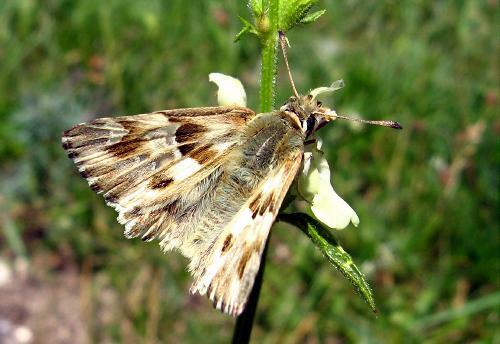 Amazingly, several things were flying despite this, including painted ladies, bright-eyed ringlets and this olive skipper. 2nd July: Mountain walk with my parents in the local region. 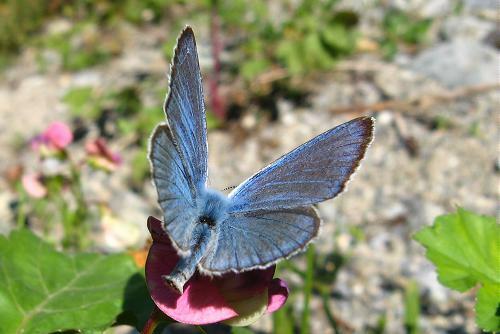 Mountain alcon blues (and here) were out in good numbers, but more males than females and very few eggs visible on plants, so it is clearly the very beginning of the season for them. Here is a couple of males with a female hanging in the curtains, and here the same couple a bit closer. 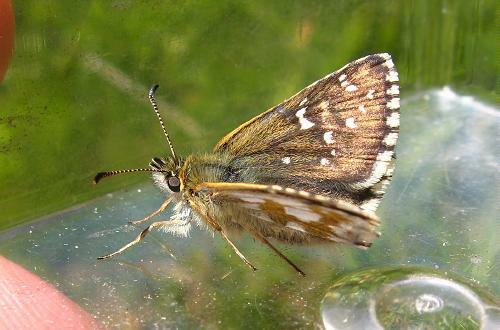 Also new for the year was carline skipper, of which I saw quite a few, and tufted marbled skipper, of which I saw two, together. 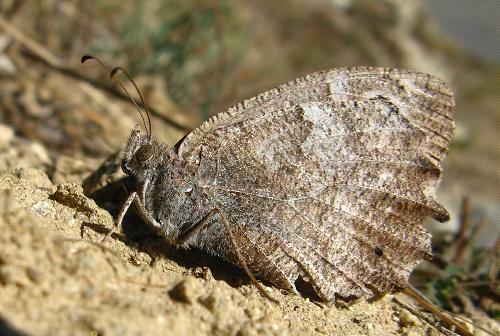 Large grizzled skippers were about, but at a lower density and there were some olive skippers joining the fray too. 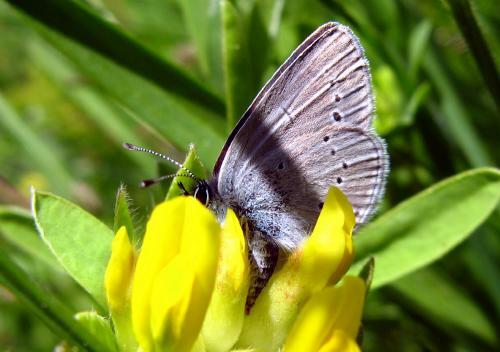 The commonest blue for much of the walk was Eros, which was gathering with other species at mineral spas in hundreds. 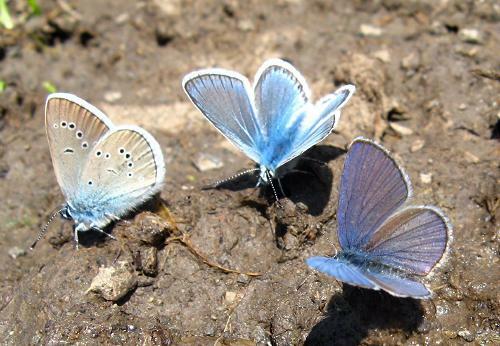 Those other species were: little blue, silver-studded blue (not so many at minerals but literally hundreds visible at once over parts of the meadow), Osiris blue, mazarine blue (here is a picture of Eros, Osiris and mazarine all together), Chapman's blue, geranium argus, Adonis blue, large blue (just a handful seen), northern brown argus, small skipper, Essex skipper and large skipper. 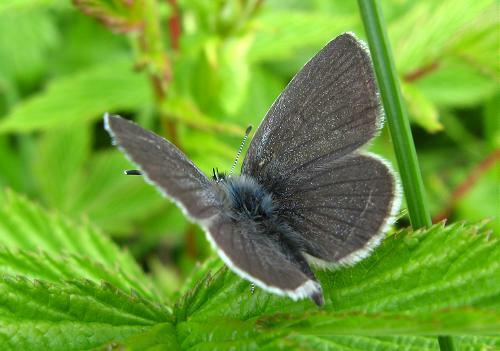 Other species seen were black-veined white (several, but not really common), several large fritillaries, Titania's fritillary, false heath fritillary, meadow fritillary, heath fritillary, purple-edged copper, small heath, northern wall, large wall, Arran brown, brimstone (four or five seen during the walk), pearl-bordered fritillary, swallowtail, and doubtless others that will come back to me when I'm not so busy!! Very little time at the moment to process pictures and write up this journal!! 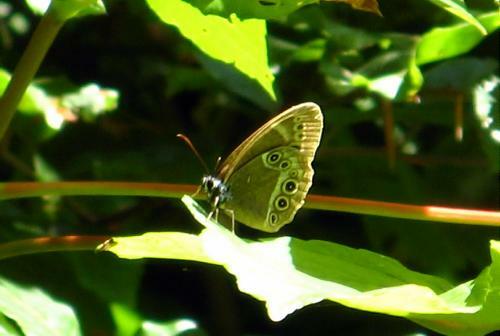 3rd: This bright-eyed ringlet near Taveyanne paused long enough for me to get a reasonable picture. 5th: Warm and sunny in morning. 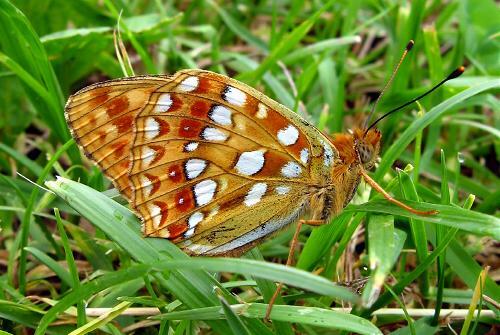 Violet fritillaries were flying in the local meadows, as were dark green, high brown and niobe - all three confirmed at some stage. 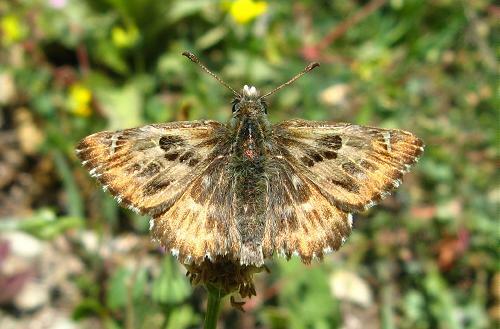 Great banded graylings are now very common. 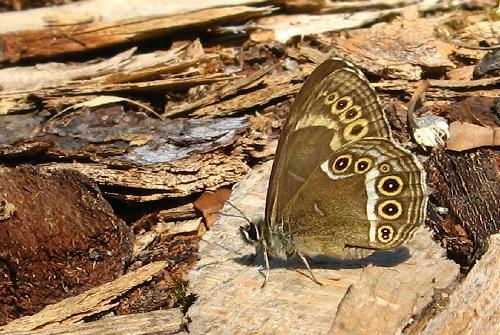 In my local woods, woodland browns were flying in good numbers (and here) and white admirals were also prominent. 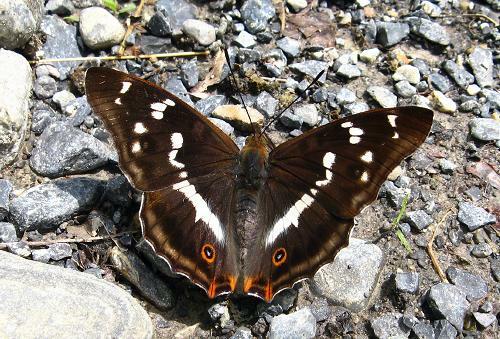 I had two glimpses of purple emperor high in the trees - my first of the year and I hope the first of many. 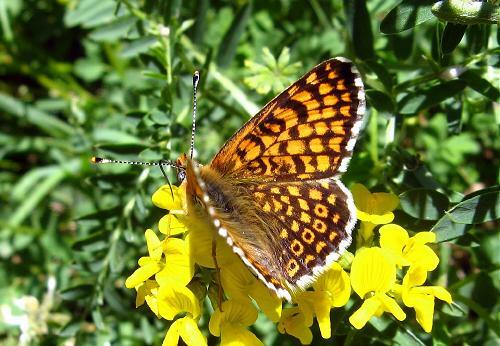 Marbled fritillaries, Queen of Spain, silver-washed fritillaries and commas were also in evidence, with meadow browns and ringlets a constant accompaniment. 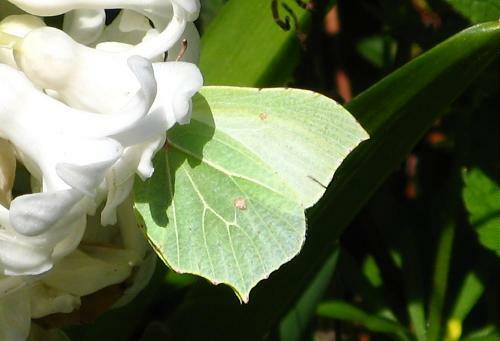 Two brimstones appeared, a male and a female, but on the male stopped for a picture. 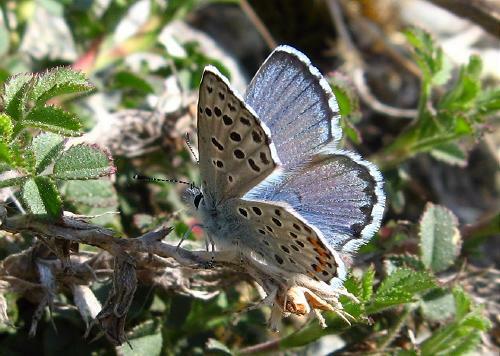 For the blues, this female Provençal short-tailed blue and this male silver-studded blue were the sole representatives. 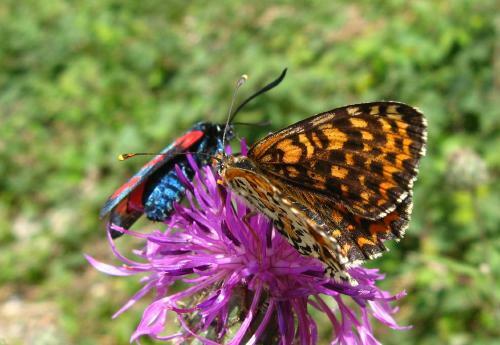 Painted ladies are still around! 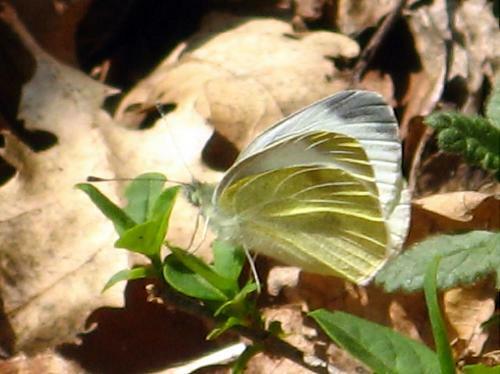 A female southern small white was flying with the woodland browns. 6th: Last day out walking with my parents. 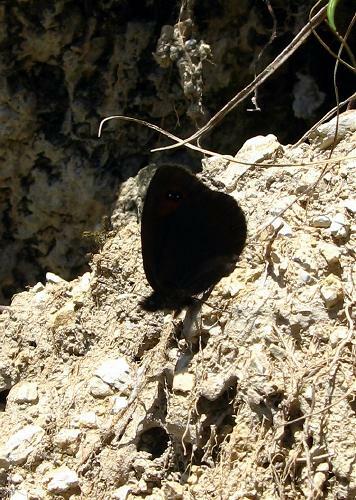 We climbed a local peak, where lesser mountain ringlets were becoming evident but bright-eyed much commoner. 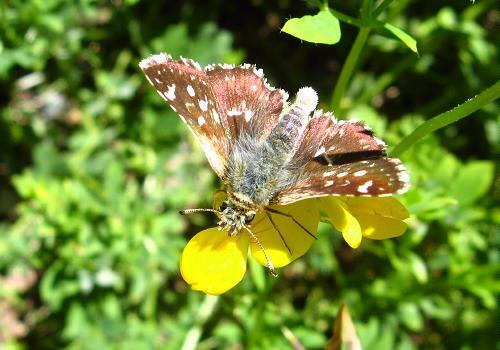 Despite a lot of cloud, swallowtails were hilltopping at the top and I saw several olive skippers. A few whites were around, and small tortoiseshells and painted ladies, but relatively little was out on a refreshingly cool day. 8th-9th: Both days mixed weather, and I spent both around Huémoz. Butterflies seen included: great banded grayling (now super common in the meadows around my house), silver-washed fritillary (and here - now super common in the local woods), marbled fritillary, high brown fritillary, titania's fritillary, Queen of Spain fritillary, white admiral (also very common at the moment), woodland brown (still common) purple emperor (female seen flitting around aspen and sallow on 8th), white-letter hairstreak (several feeding on angelica on 9th - and here), large white, small white, green-veined white, wood white, large skipper, Provençal short-tailed blue, holly blue, red admiral, painted lady, small tortoiseshell, large tortoiseshell (my first of the summer generation and very fresh, but it flew off before I could get close enough for a good photo), meadow brown, ringlet, swallowtail. 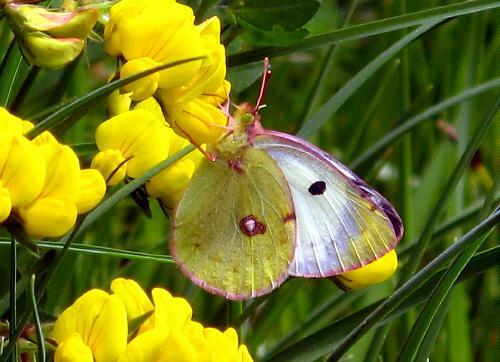 No clouded yellows of any species. 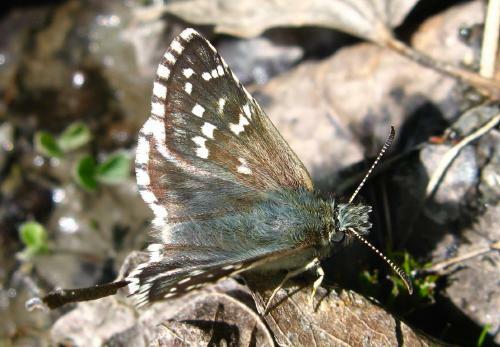 10th: Continued spending time in my local woods, hoping in particular to get a glimpse of a poplar admiral. 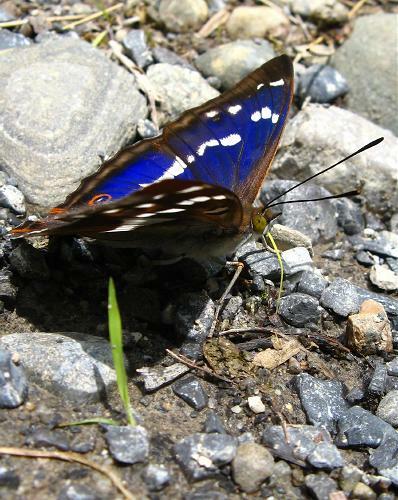 This wasn't to be, but I did see a female purple emperor twice, again flying around sallow and aspen, and caught this lovely male purple emperor on the ground, taking salts. Here he is from an angle where the blue is completely invisible. 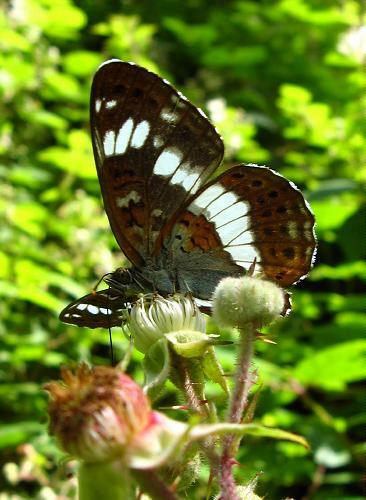 White admirals were abundant in the morning and the afternoon (some looking rather middle-aged now), as were silver-washed fritillaries, and woodland browns were still easy to find, if not to photograph! 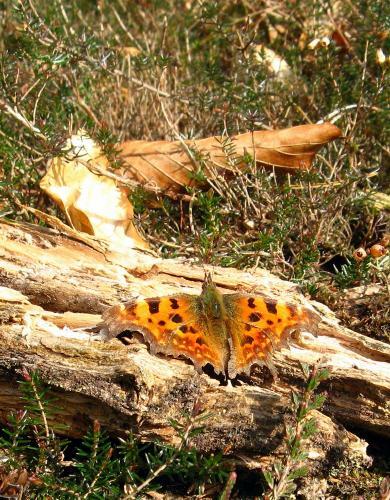 A single large tortoiseshell put in a brief show, with commas common, painted ladies quite frequent, ringlets, meadow browns, large skippers and various whites all continually present. 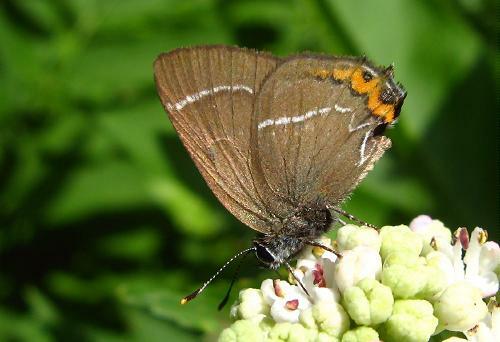 This white-letter hairstreak is identifiably one of the same individuals I photographed yesterday. 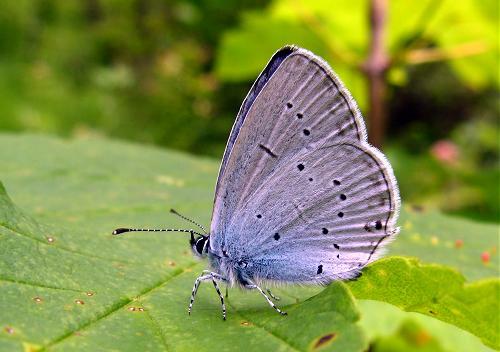 Silver-studded blues and Provençal short-tailed blues flew in clearings in the woods and two quite different female holly blues were nectaring at about 5.00pm. 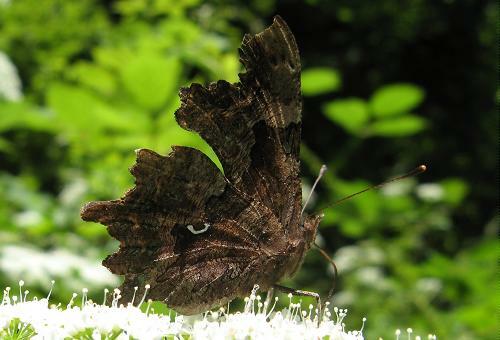 This is one and this the other - the pattern and extent of the dark around the wing edges differ. 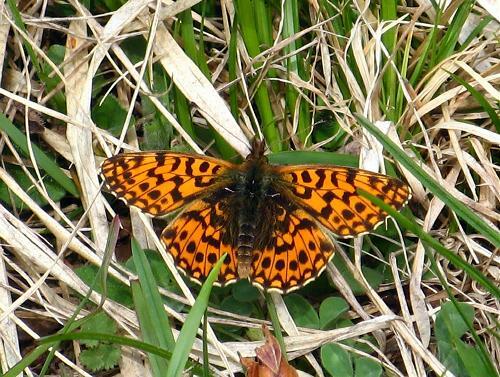 A few violet fritillaries were flying in the meadows and great-banded graylings were still very common. 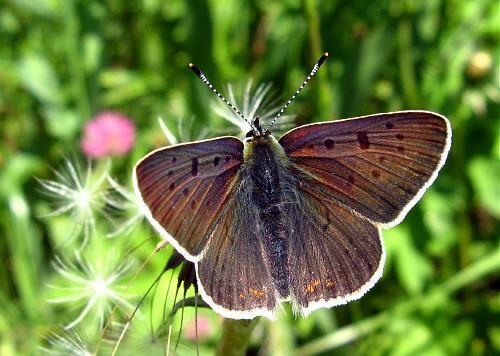 11th: The day's mission was to find Erebia christi, Rätzer's ringlet, one of the least common and most local species in Europe. The mission was achieved, thanks to this single, aged and rather broken female that Matt found resting on snow. 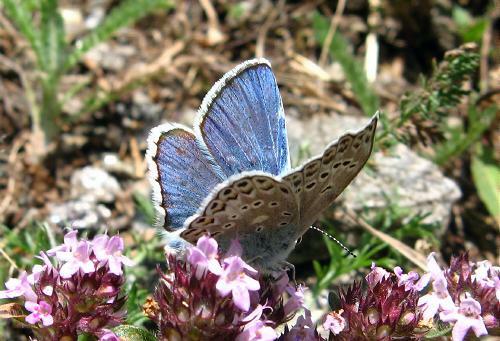 We moved her to some thyme where she drank gratefully, but I fear she was not long for this world. 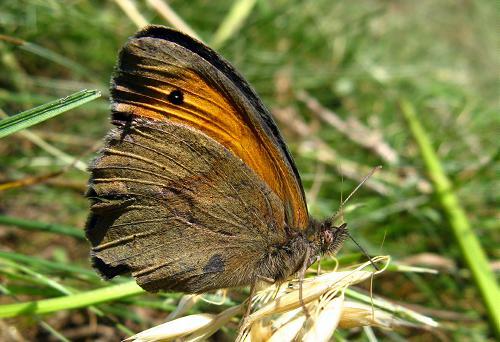 We did see two or three other likely candidates during a 4 hour search, but they were flying over extremely steep and difficult terrain amongst hundreds of other Erebia butterflies, of eight different species, and could not be confirmed one way or the other. We were particularly grateful to her because the day was in certain other respects most unfortunate, with Matt's car breaking down and having to be towed away and me slipping down a shale slope and dislocating my shoulder!! 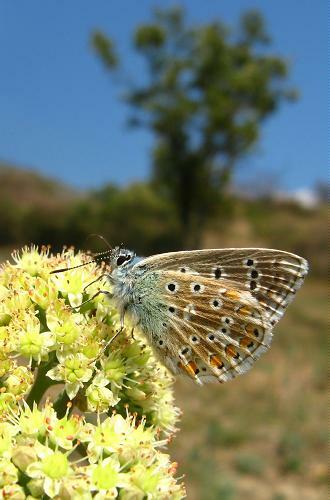 Before these calamities set in, we did see quite a lot of species of butterfly at the one, christi site. 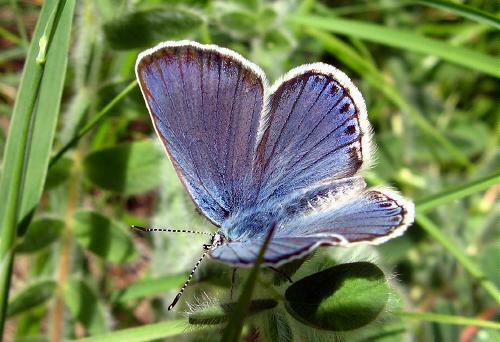 These included scarce copper, purple-edged copper, subspecies eurydame (here is an underside), Escher's blue, large blue, little blue, idas blue, common blue, mountain dappled white, Apollo, large wall, northern wall, Darwin's heath (in the company of heaths that looked far more like alpine heaths - so I think this is an overlap region), great sooty satyr, clouded yellow, large ringlet (quite common - here seen out of focus in the foreground, with marbled ringlet), lesser mountain ringlet (a few), almond-eyed ringlet (very common), Piedmont ringlet (2), Swiss brassy ringlet (just a few), Arran brown (Matt saw one), marbled ringlet (very common), woodland ringlet (a few). 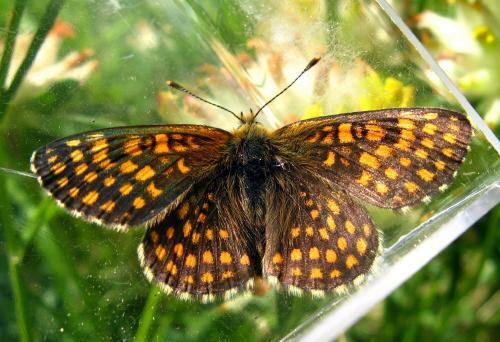 There were several species of fritillary flying, including Queen of Spain and heath fritillary, but our efforts were concentrated so much on finding Rätzer's ringlet that we did not really devote the necessary attention to these. 12th: Mostly overcast. 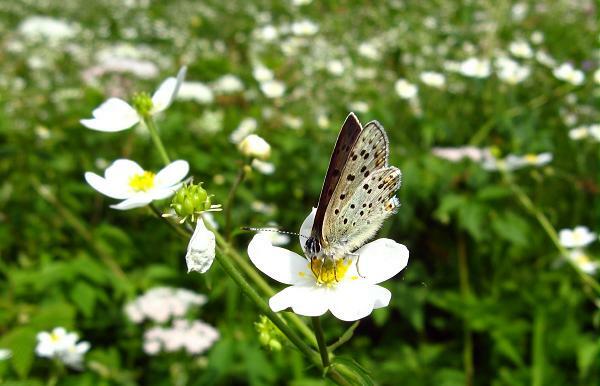 The local woodlands produced plenty of white admirals, a few woodland browns, and meadow browns, ringlets, silver-washed fritillaries, marbled fritillaries, green-veined whites, painted ladies and Provençal short-tailed blues - despite the weather. 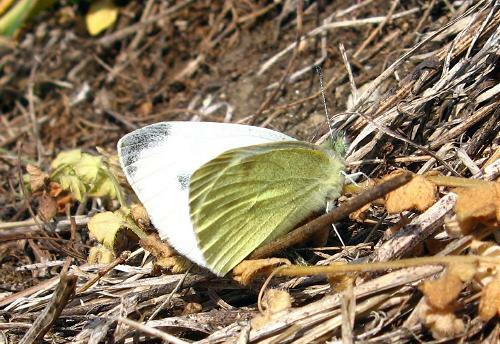 Two male southern small whites were flying in a clearing. It is evident there is a colony of this species here, which is quite exciting. 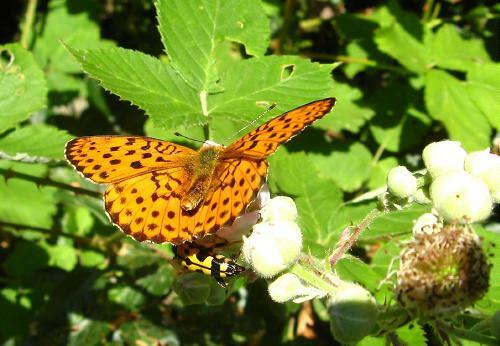 While it was overcast, fritillaries sat around on bramble leaves. I saw perhaps a dozen doing this over a 200m stretch of bramble. 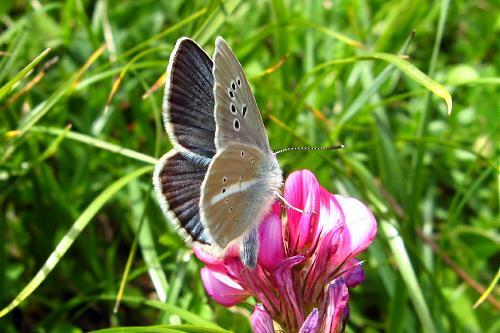 13th: A trip to a high mountain pass, with Yannick Chittaro, who is in charge of mapping Swiss butterflies. 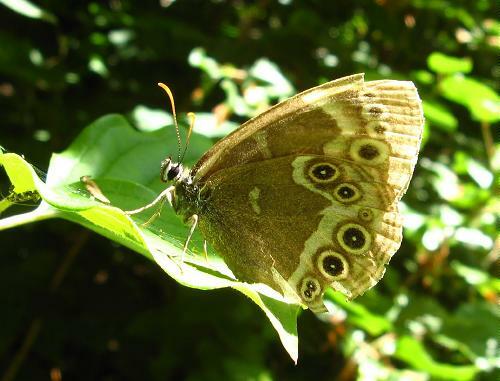 The misison was to confirm (or otherwise) a record of yellow-banded ringlet from the 50s. 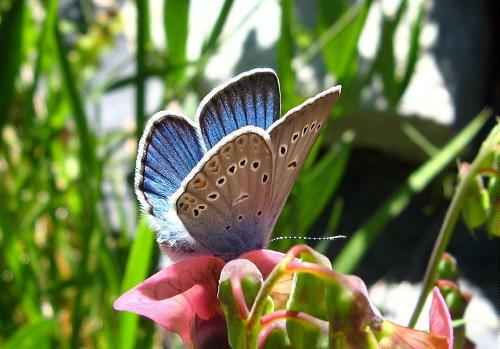 In the event, we didn't find the butterfly and it seemed it wasn't there - at least, it wasn't flying today. 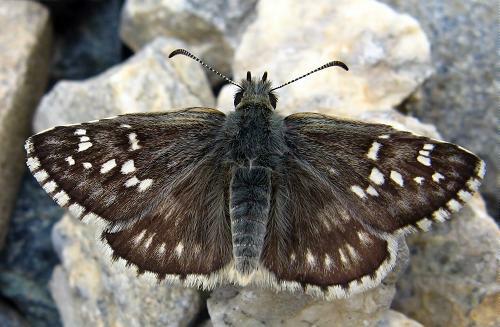 Dusky grizzled skippers were very common (here is an underside) and this was the predominant Pyrgus species, though there were a few alpine grizzled skippers too. 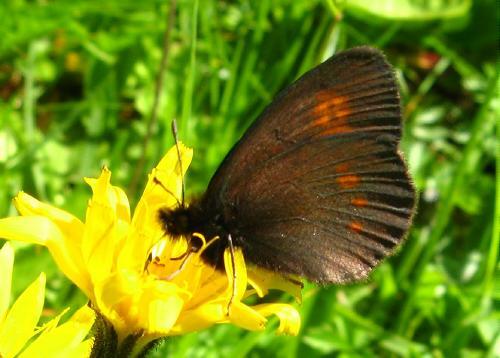 About half a dozen silky ringlets were my first of that species for the year and I also saw my first moorland clouded yellows, though only one or two. 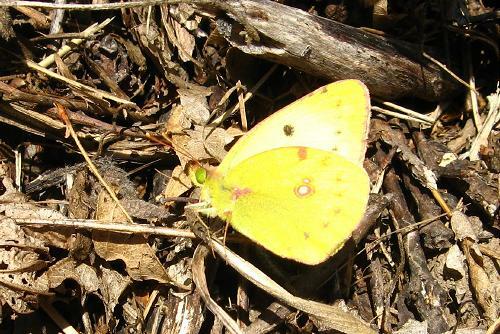 Mountain clouded yellows were also flying. 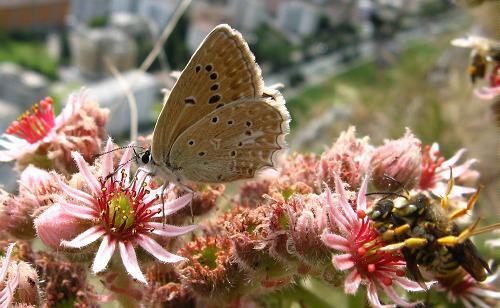 Other Erebia species on the wing were small mountain ringlet (quite numerous), large ringlet (locally numerous, near trees) and blind ringlet, also common. 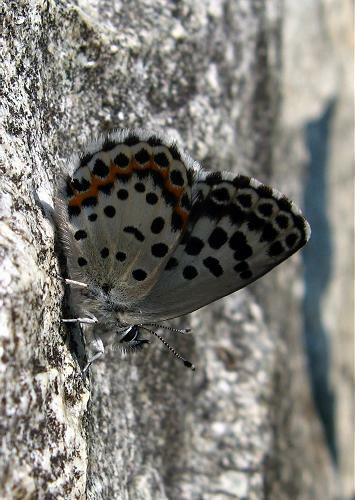 There were plenty of little blues and one or two cranberry blues, but mostly our attention was focused on Erebia and it was usually extremely difficult on the very steep terrain to chase unidentified blues. 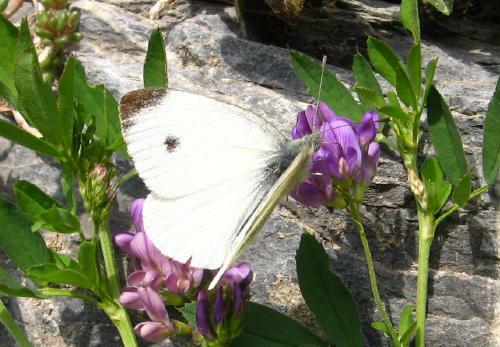 Mountain green-veined white was very common and there were a few black-veined whites, but no Apollos of any species. 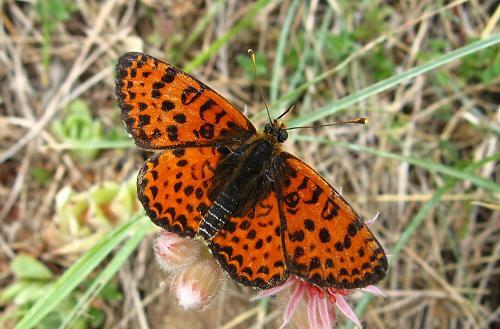 Most of the alpine fritillaries seen were shepherd's fritillary but mountain fritillary was also flying, confirmed by a female with characteristic purple suffusion. 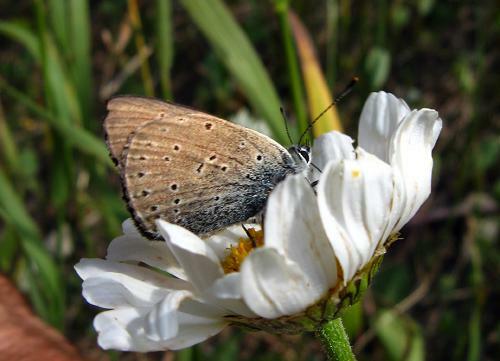 We found a single Coenonympha, which seemed pretty well exactly half way between Darwin's heath and alpine heath - a common situation, as these butterflies do not seem to have speciated fully yet. 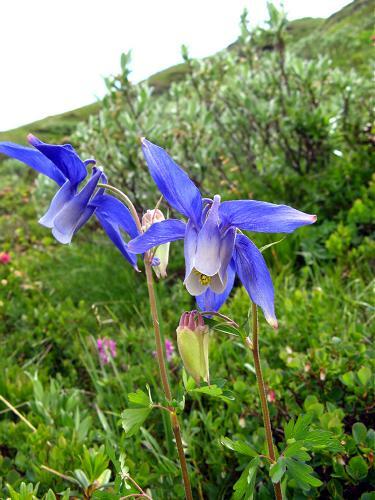 This flower is Aquilegia alpina - strikingly beautiful among the other mountain species. 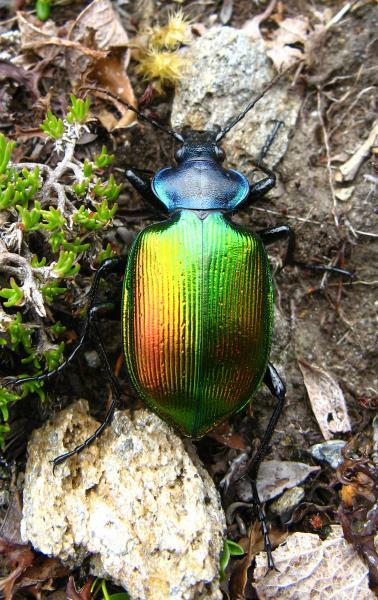 Finally, this ground beetle, Carosoma sycophanta, was also beautiful. It was probably on the mountain top by accident, being an arboreal species. 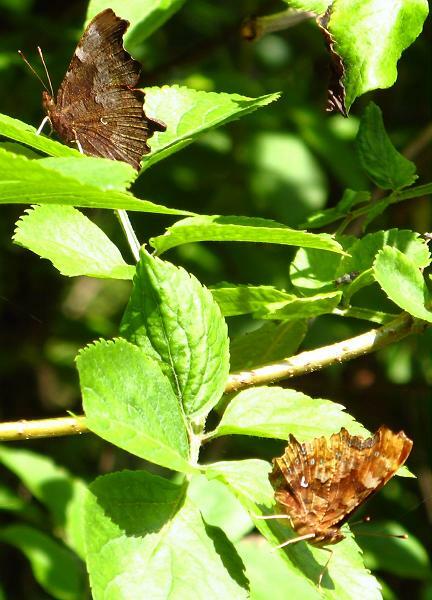 14th: Here is a picture of a hutchinsoni comma and a 'normal' comma on the same bush. 15th: Storms and torrential rain last night, followed by a cloudy day with sunny spells. 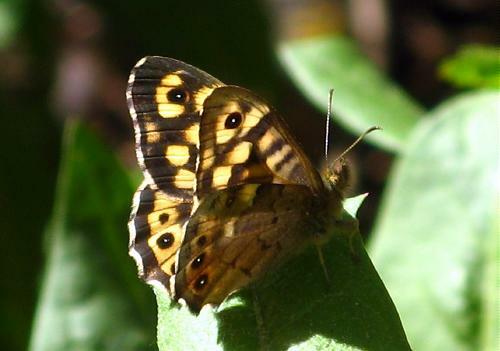 I spent a pleasant hour in my local woods, watching purple emperors, white admirals, painted ladies, red admirals, woodland browns, meadow browns, ringlets, Provençal short-tailed blues, holly blues, southern small whites, wood whites, small whites, green-veined whites, large whites, brimstones, commas, peacocks, silver-washed fritillaries, marbled fritillaries, high brown fritillaries and a few white-letter hairstreaks at the very top of an ash (I saw them because I was watching a female purple emperor spin around the ash and soar between this and some sallow bushes). 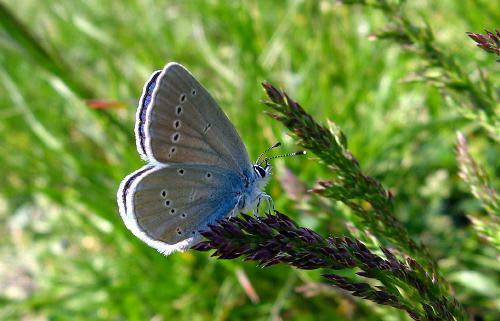 There was a single common blue there too. 16th: A magnificent day. 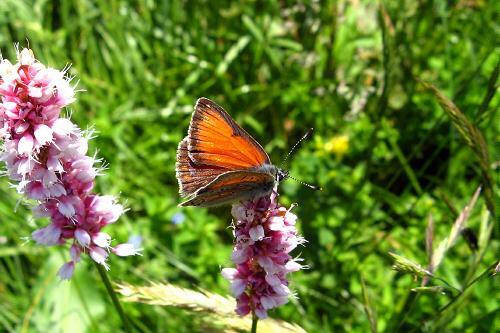 Yannick Chittaro joined me to see my most local Eriphyle ringlets and then we moved further afield, but still always in the Canton of Vaud, to check out a few other sites for rare and special butterflies. 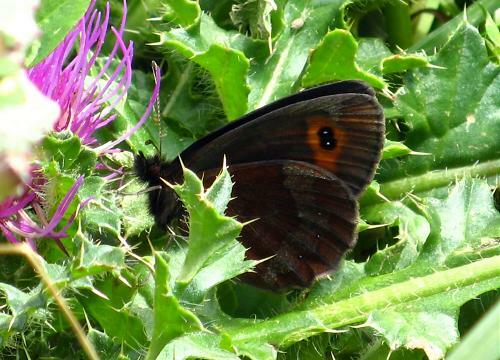 The Eriphyle ringlets performed for us, though as the day was warm they very rarely settled for photos. We confirmed perhaps half a dozen or more (by netting), but I didn't get any acceptable pictures there. 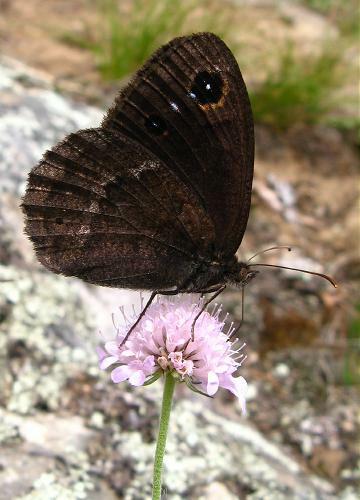 The same site has large ringlets, manto ringlets, lesser mountain ringlets, bright-eyed ringlets and blind ringlets and all were flying today, making things more difficult! 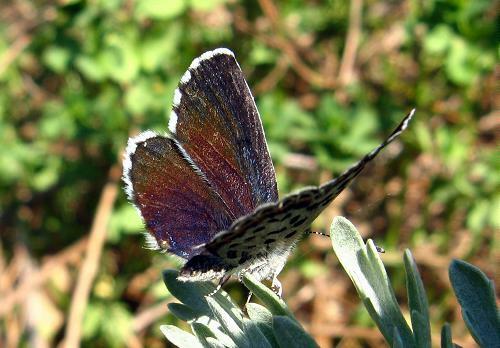 In contrast, we found a great predominance of Eriphyle at a second site, further away, and I did (eventually) get a few photos of these difficult butterflies, of which this is probably the least bad. 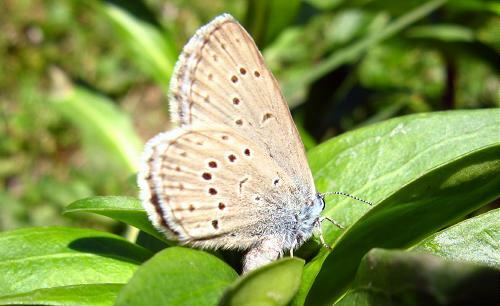 This is the upperside of a very weakly marked individual that I believe is also Eriphyle. 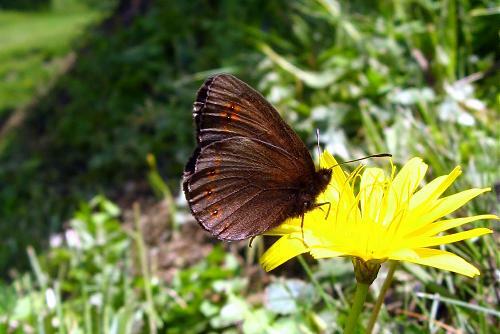 All my other pictures are out of focus, or the butterfly is flying off, or it is too dark &c.!!! 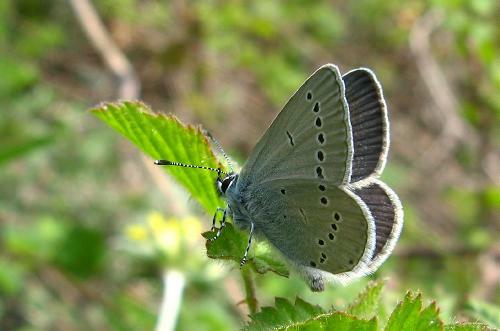 Moving on from the first Eriphyle site, we paused briefly to reconfirm the presence of dusky large blue at one site, before visiting what was for me a new site for scarce large blue. Amazingly close to a new housing estate, this site had at least 10 individuals flying today - probably nearer twice that number, but it is difficult to know which ones you see twice. There were some males but only females posed for photos. 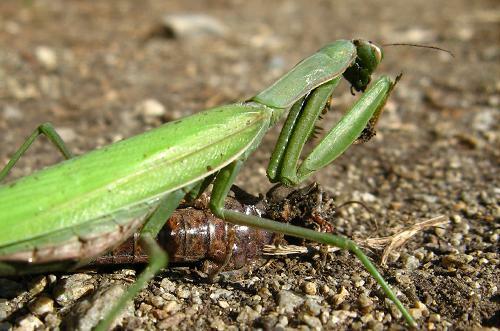 Here is a female laying, and here a different female. 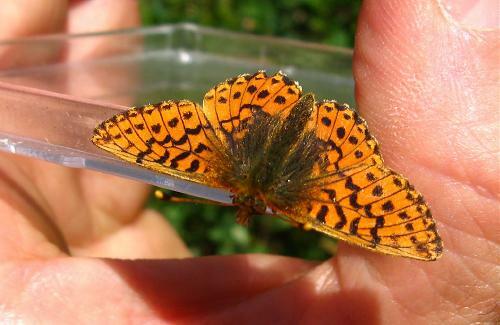 The next target species was cranberry fritillary - a new species for me. 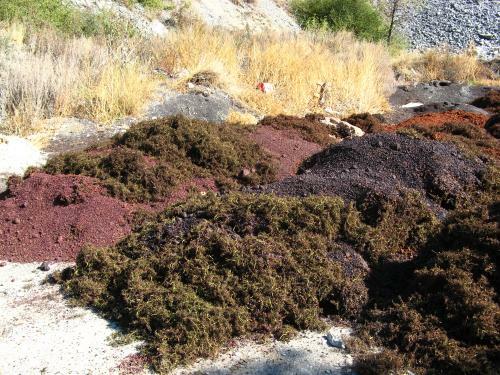 This was locally very common in two discrete but close colonies, buzzing around over the Vacciniinum plants in a wetland area also frighteningly close to human actiivity. 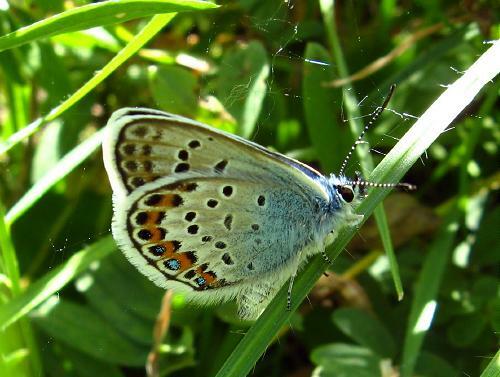 Here is the first one I saw - a male. 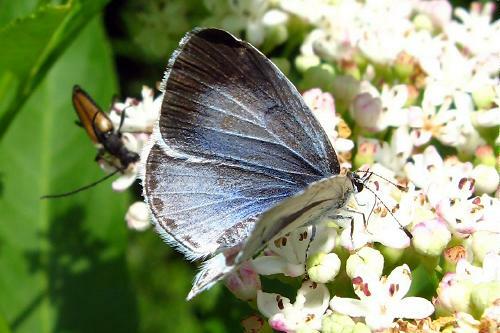 This is a different male showing the underside (and here) and here and here are two more females, upperside and underside. 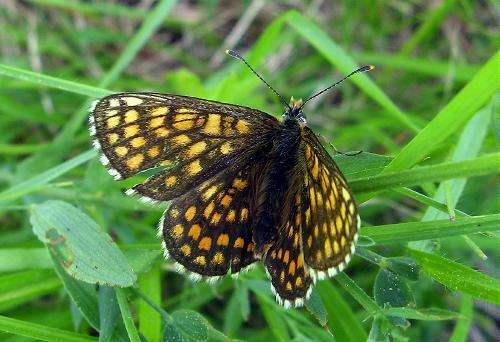 Other species seen today (in no particular order) were Arran brown, Scotch argus (one confirmed - my first for the year), lesser marbled fritillary (locally common, near meadowsweet meadows), Titania's fritillary (also locally common), shepherd's fritillary (one or two at a different site from the cranberry fritillaries), marsh fritillary (one or two, both at altitude), dark green fritillary, Glanville fritillary (one individual), false heath fritillary (generally quite common), small heath, moorland clouded yellow (my first for the region, two or three individuals were flying near the Vacciniinum bogs where the cranberry fritillaries were flying), peacock, large wall, large white, mountain green-veined white, wood white, purple-edged copper, large skipper, Essex skipper, Eros blue, mazarine blue, little blue, common blue, large grizzled skipper, large skipper, red admiral, brimstone, red admiral and small tortoiseshell. 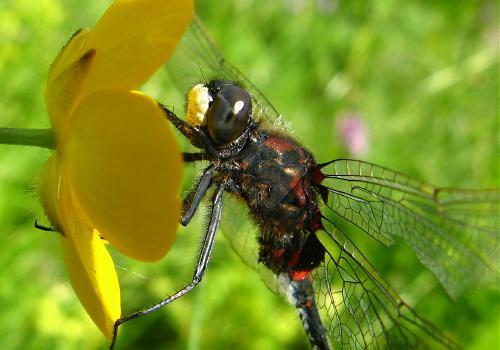 At one of the Eriphyle sites, a good number of White-faced darters were flying, many of them in tandem. 19th: Heavy storms last night, but the skies cleared by late morning and there was some slightly chilly sun. 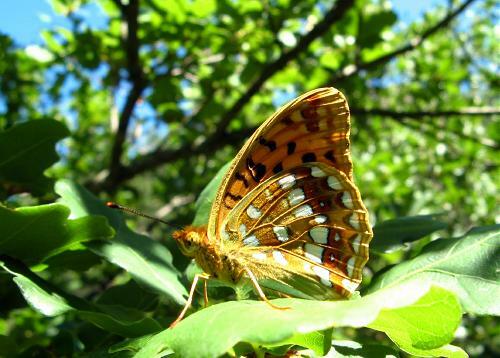 In my local woods, all the usual suspects were out and about, except for purple emperors, which didn't put in an appearance. 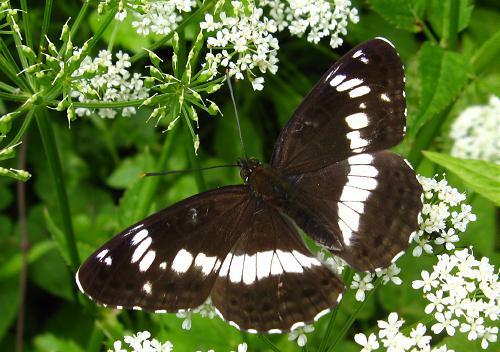 Woodland browns are still easy to find (though not to photograph), over a month after they first appeared, and white admirals are common. 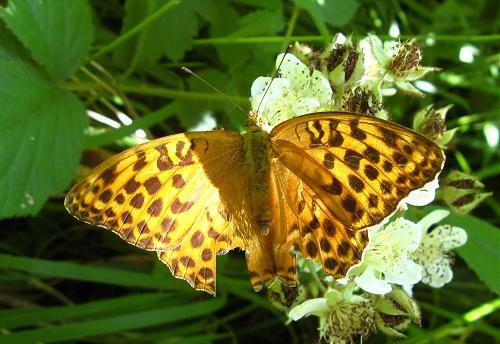 Silver-washed fritillaries seem to be at a peak, with equal numbers of males and females. 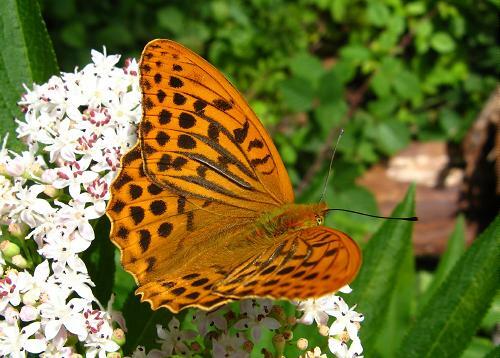 This is a male high brown fritillary. 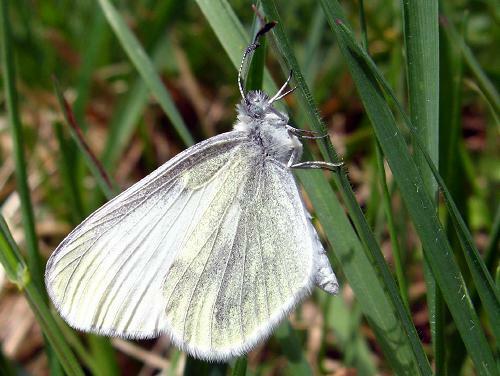 This female southern small white confirmed that the species really is local to my region - I have now seen many at the same place, spread out over the summer brood. 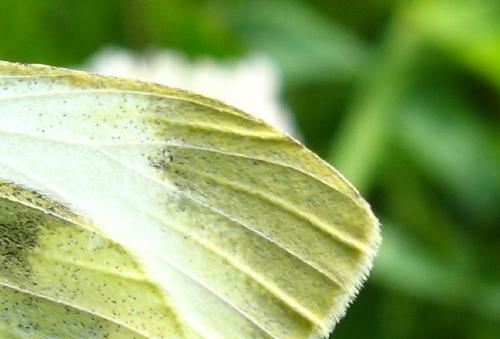 Here is a wood white, here another and here a green-veined white. 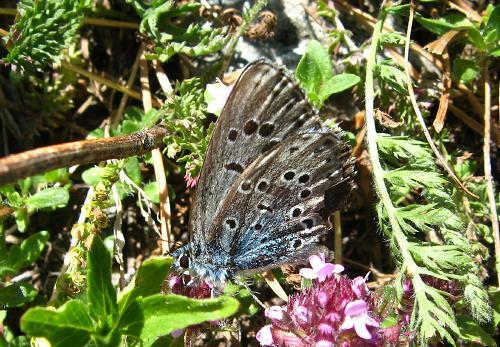 Speckled woods are still common and there were several Provençal short-tailed blues around, as there always are there. 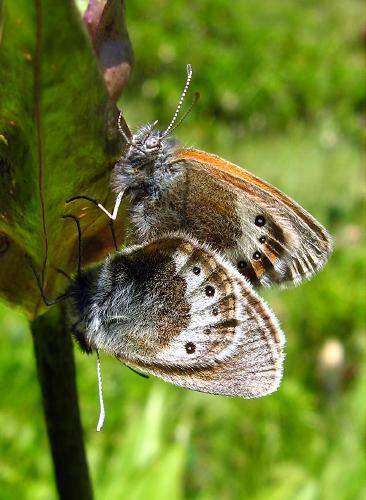 In the meadows on the way back, sooty copper, Chapman's blue, meadow brown, ringlet, and these mating great-banded graylings were all taking advantage of the sunshine. 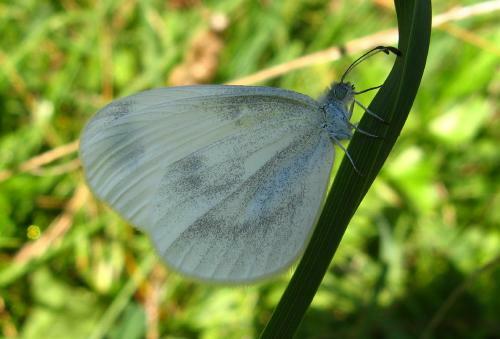 20th: On my morning dog walk I photographed this 'wood white' which I believe to be Réal's wood white. 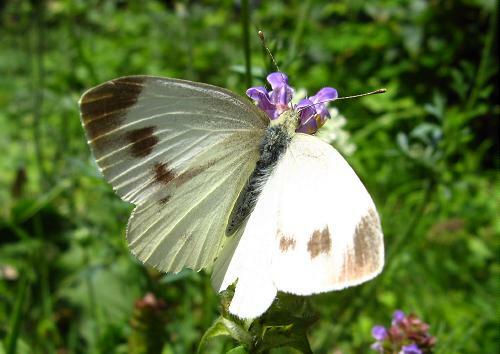 Although it is accepted that these cannot be told apart without dissection, there is a theory that the dark post-discal band on the hindwing is more curved in Réal's wood white. In this individual, the band is extremely curved. 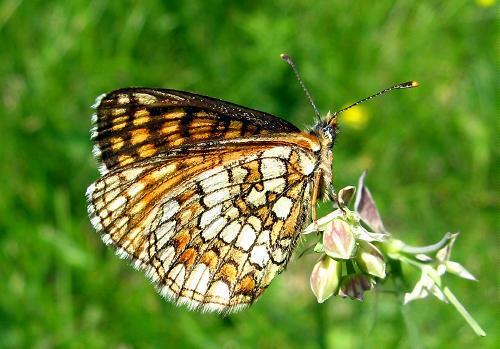 I also saw dark green fritillaries, a heath fritillary and the usual meadow butterflies - including marbled white, that I keep forgetting to mention! In the late morning I went up a local peak. 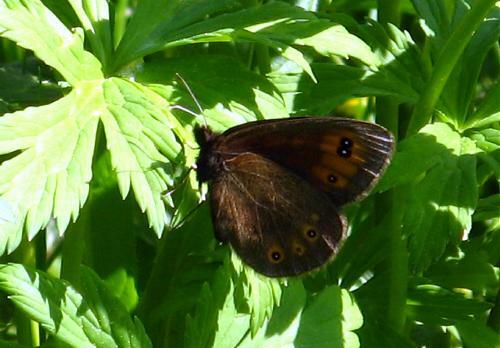 It was a glorious day and many others had the same idea, and so although I saw my first common brassy ringlet of the year it was impossible to photograph it. I thought there would be more at a second site but it seems this species is not really flying commonly yet. 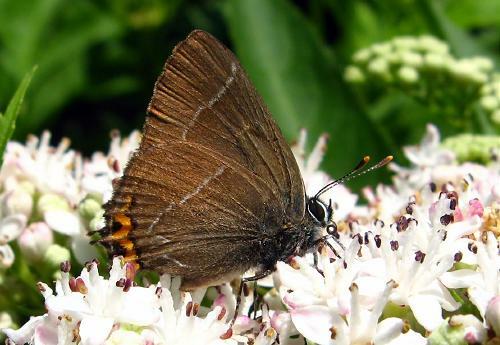 There were plenty of blind ringlets, lesser mountain ringlets, manto ringlets and bright-eyed ringlets, with Arran browns a little lower down the mountain. 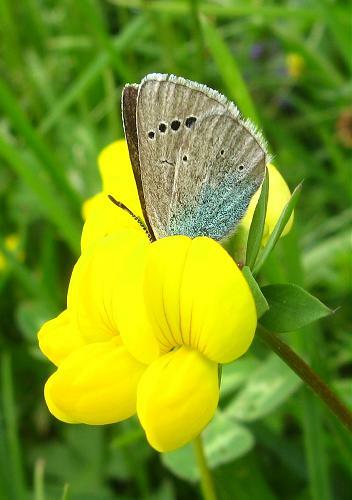 There were no dewy ringlets at a site where the species is common - so clearly it has finished for this year. 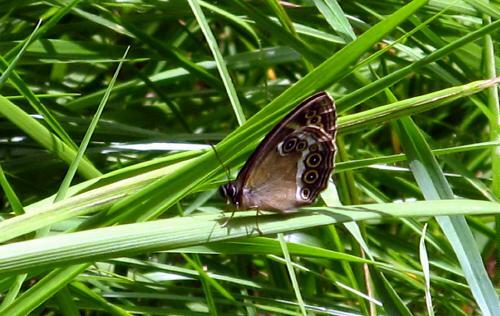 This water ringlet (and here) was my first for the year. 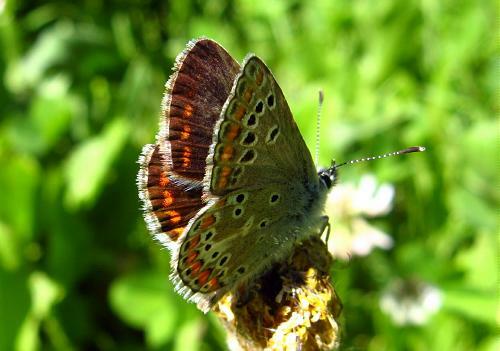 Blues flying included cranberry blue (quite numerous - at least 12 seen, males and females, some fresh, others very worn), turquoise blue, little blue, chalk-hill blue, idas blue, alpine argus and northern brown argus. 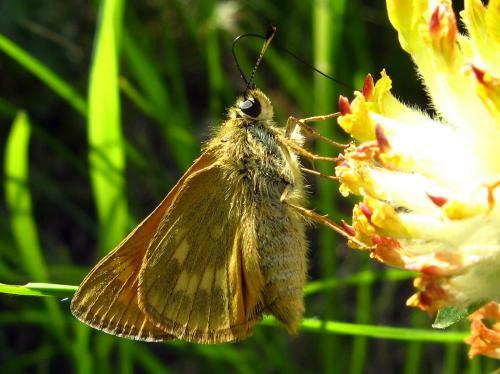 I saw a few olive skippers, including one very fresh one, and this lovely, fresh female carline skipper (and here). 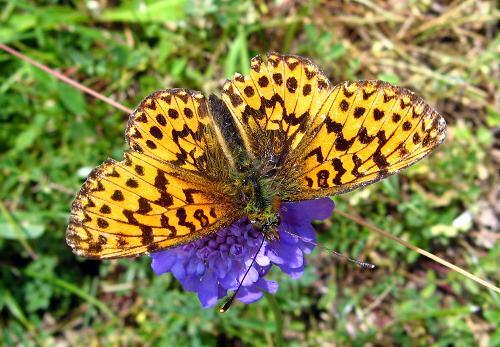 Titania's fritillaries were quite common, a few shepherd's fritillaries were flying (but not many - though their main patch is just where lots of people were walking today). 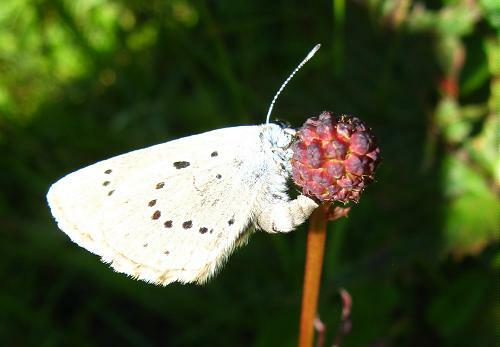 Alpine heaths were very common and there were a few mountain clouded yellows. 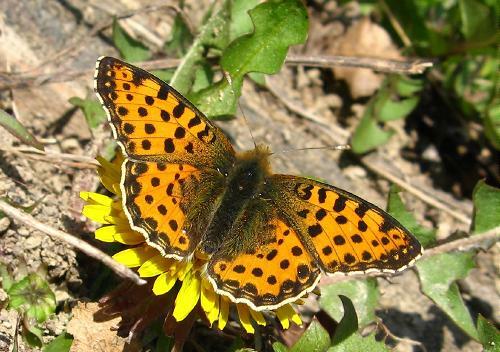 I saw a single, male Niobe fritillary at about 2100m, but my only photograph of it was awful!! 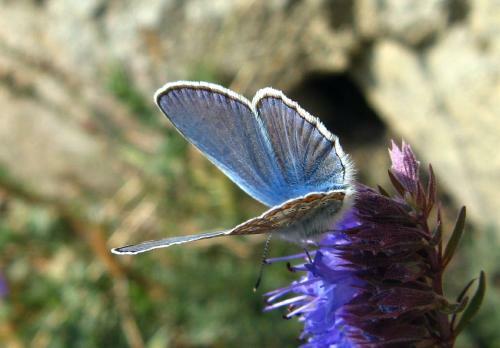 21st: To the valley for Meleager's blue. 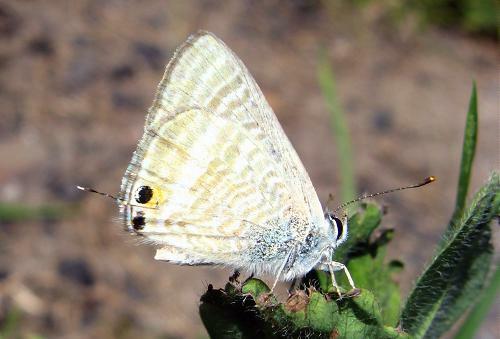 Leaving Huémoz to catch the bus I found this male southern small white, nowhere near my local colony (here is a close-up of the forewing apex, showing the characteristic lack of fork in v.7). Perhaps the species really is spreading. 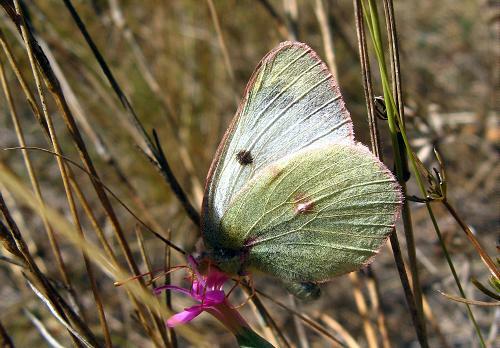 I also photographed this male pale clouded yellow. 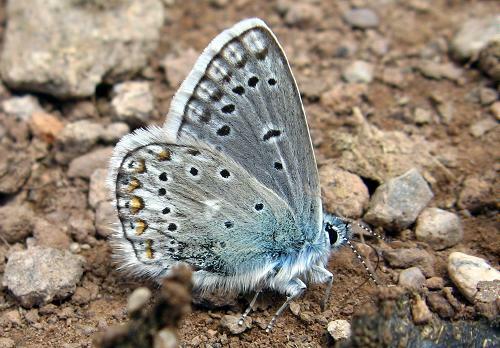 Down in the valley, Meleager's blue was on form and I saw more than I've ever seen in a single day before - that is, at least 5 males and 2 females. When I took this picture I didn't notice the mating wasps! 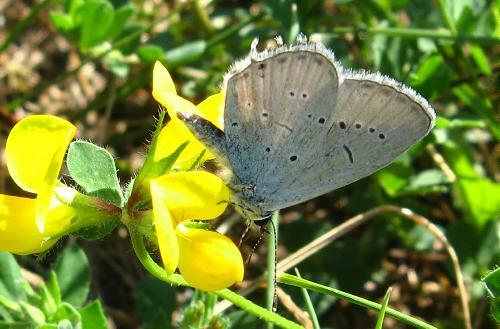 The Meleager's blues were not particularly frequenting crown vetch, the foodplant, but were much more interested in nectaring. The females were very fresh and had probably not been long on the wing, though some males were rather tatty. 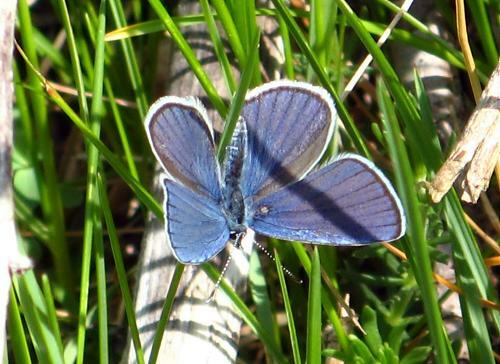 Other blues flying were chalkhill, Adonis, common, Provençal short-tailed and turquoise (that's a female). 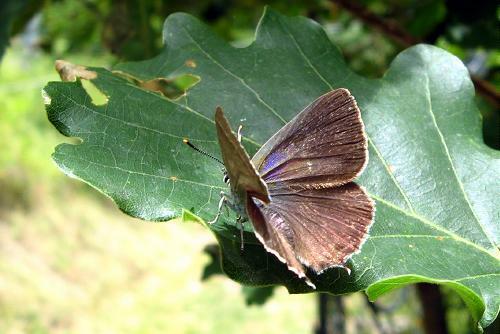 In a woody part of the walk, purple hairstreaks were quite common (here is an underside) and some females were engaged in laying on low down twigs of oak. 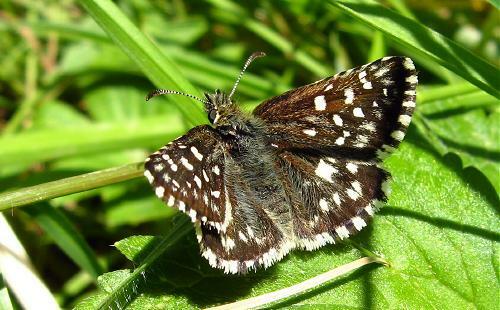 Great sooty satyrs were sill flying, but they have now been joined by dryads, which were extremely common - abundant even - today. 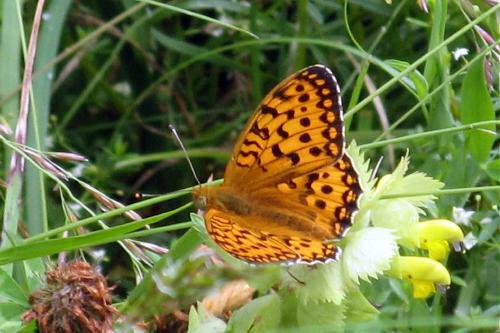 I didn't examine every fritillary I saw but the commonest by far was spotted fritillary, which seemed to be represented on most flower heads. Here is a female. 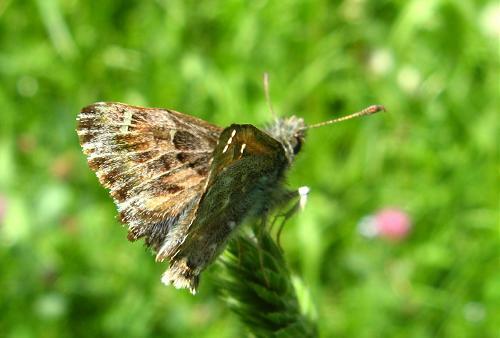 Large and small skippers were flying, and red admiral, painted lady and small tortoiseshell. 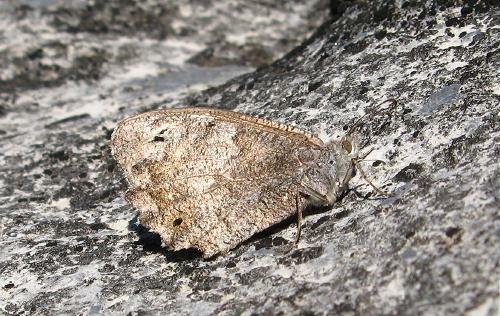 Perhaps the biggest surprise was what really looked like a woodland grayling just as we (Asha and I) were heading home. 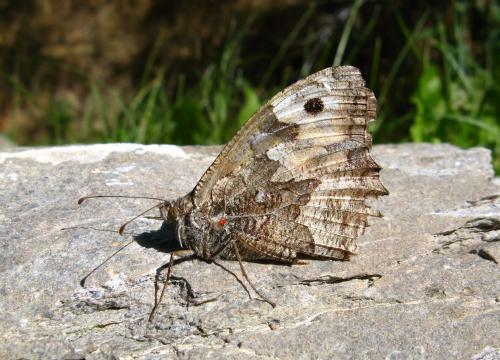 It was certainly either woodland grayling or lesser woodland grayling (Hipparchia genava) but from its huge size I immediately thought of woodland. I have seen neither there before, but the maps suggests lesser woodland is more likely, so that is what it shall be! 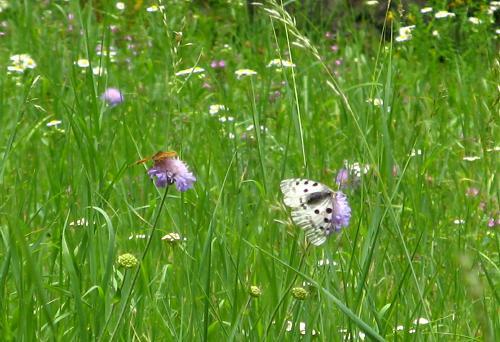 Finally, here is a shot of a meadow with a fritillary and an Apollo nectaring. After a few hours in the heat (it was sweltering, even when not sunny), with no streams or pools, my poor dog was wilting and we made haste to catch the next train home without thoroughly identifying everything on the way. 22nd: Heavy weather. 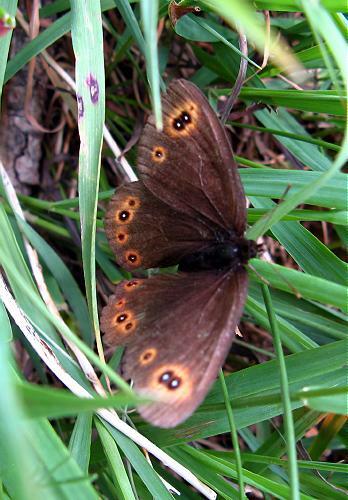 Had to take Asha to the vet, and walking back from Villars noticed that Scotch argus was now very common in the woods along the way - easily the commonest butterfly. 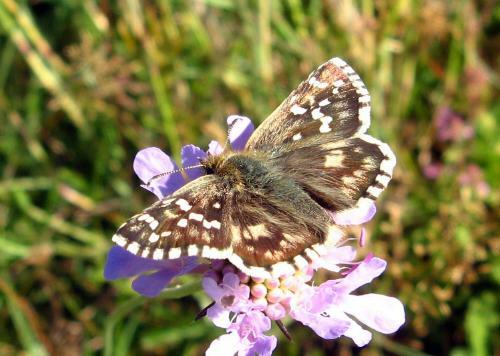 Other species there were silver-washed fritillary, meadow brown, painted lady, marbled white and, once in the meadows, great-banded grayling and large and small skippers. 26th: Asha has been ill for a few days, so I haven't been able to go out (and there have been storms too). 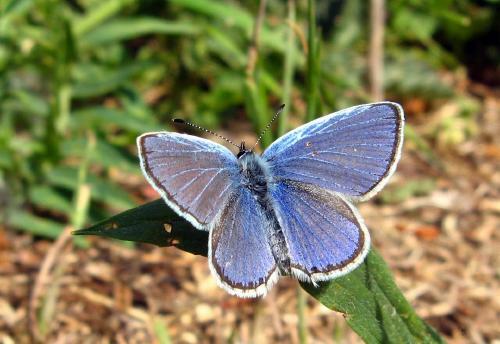 Today I did nip down to the woods without her, where butterfly numbers were generally down, presumably because of the storms. 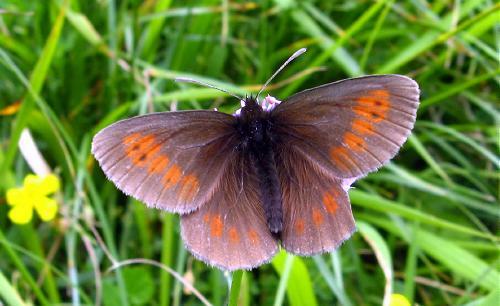 White admirals and silver-washed fritillaries were still around, and some woodland browns too, though these were now on their last legs. 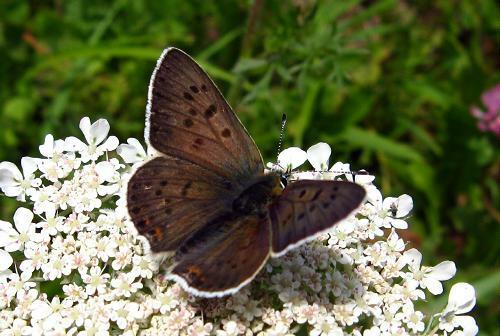 Scotch argus and Arran brown both flying, as well as high brown fritillary, dark green fritillary, wood white, southern small white, holly blue, comma, meadow brown, ringlet and large skipper. 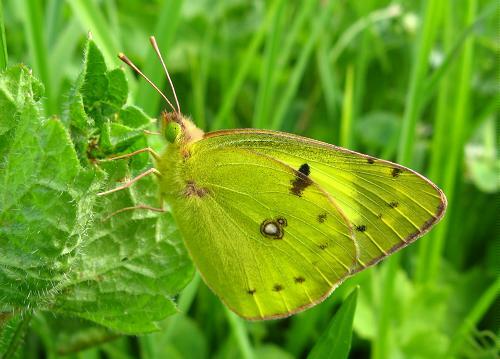 In the meadows, clouded yellows are now rather common, with the occasional pale clouded yellow and Berger's clouded yellow thrown in. 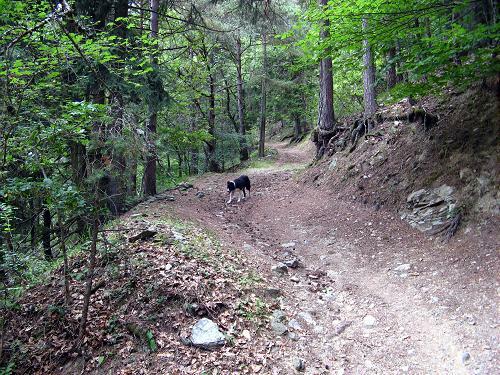 27th: A friend from England visited in the morning, so Asha agreed to go for a short walk to the woods. 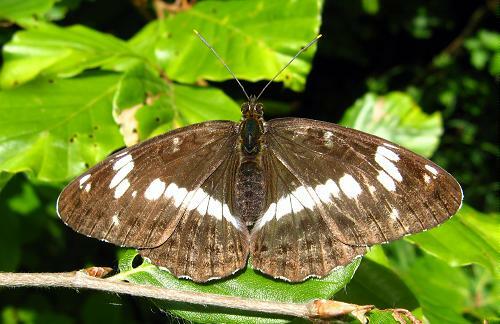 Much the same species were flying as yesterday - here is a white admiral and here a rather sorry woodland brown - but in addition there were white letter hairstreaks visibly flying around the tops of the trees, notably one particular ash tree. 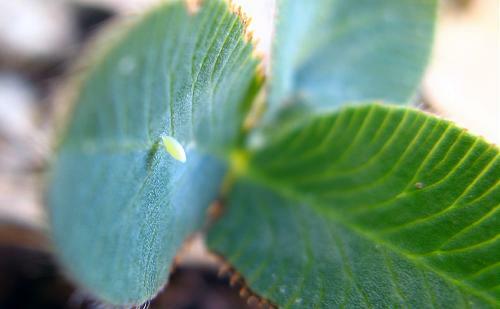 Here is one, that came down briefly - I think he or she has had a good life!! 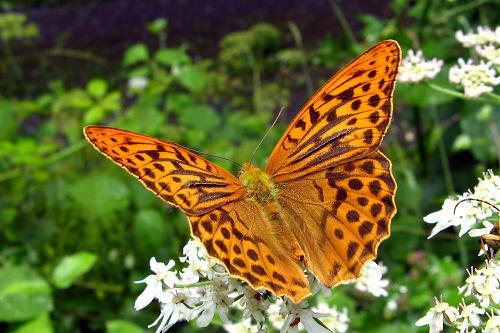 Here is a silver-washed fritillary. 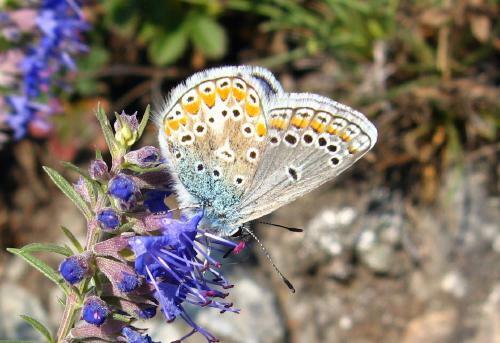 We also saw Provençal short-tailed blue (a male and a female) and a false heath fritillary. 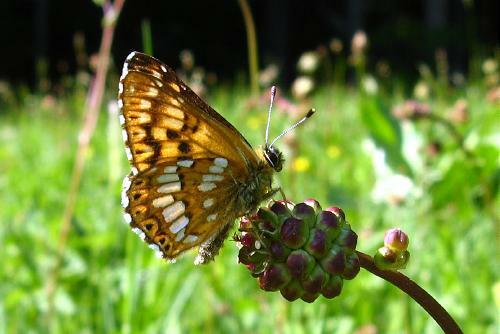 In the meadows on the way back home, a second brood meadow fritillary was flying. In the afternoon I decided to leave Asha and take a trip alone up the mountain, to one of my favourite Erebia spots. Although I only spent about an hour at the site, so as not to leave Asha too long, it was well worth the trip. 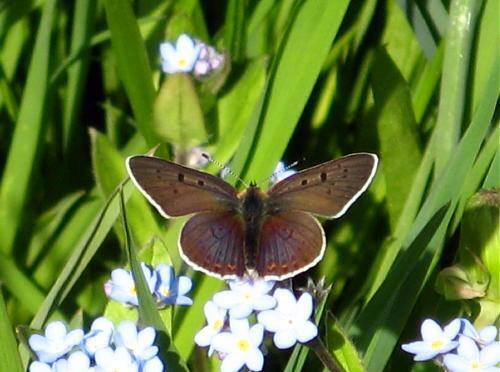 Water ringlet was flying - but impossible to photograph! I saw two individuals (both males) well enough to confirm the identity but they flew if I approached within 10m and never nectared. 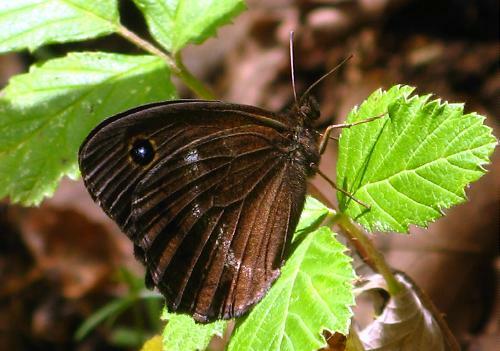 Some manto ringlets were more amenable (here is an upperside), as were some lesser mountain ringlets. 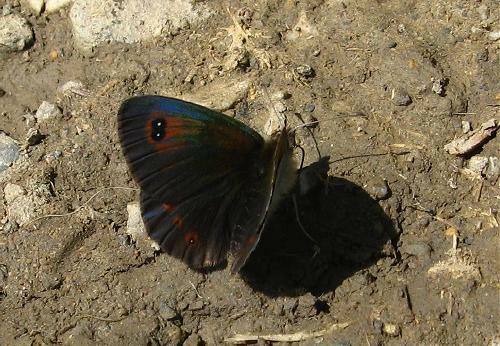 This is a Scotch argus, lurking out of the sun. 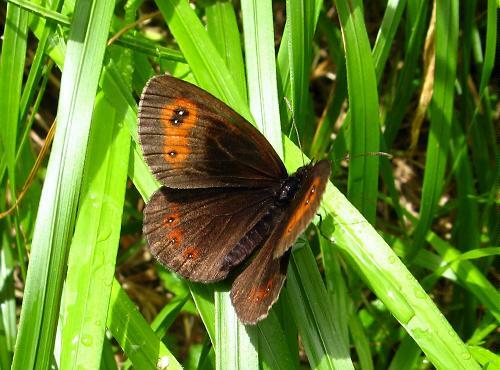 This was the only Piedmont ringlet I managed to photograph, though there were several on the wing. 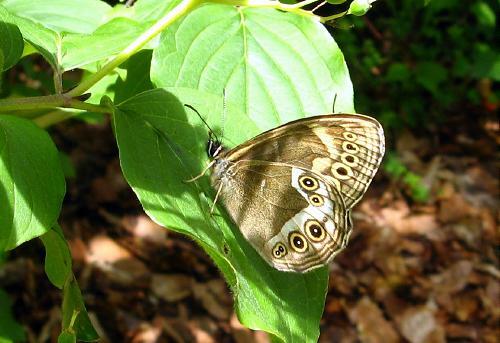 I actually don't know what this ringlet is - I didn't get a look at the underside, though while I was tracking it I thought it was also Piedmont. 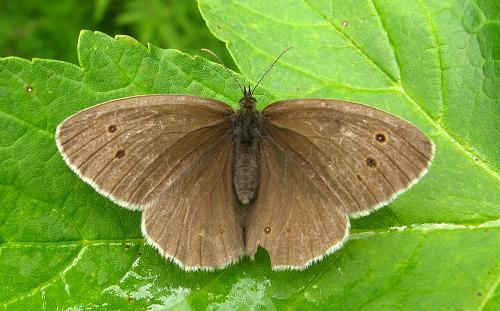 Common brassy ringlet became amenable towards the end of my hour. 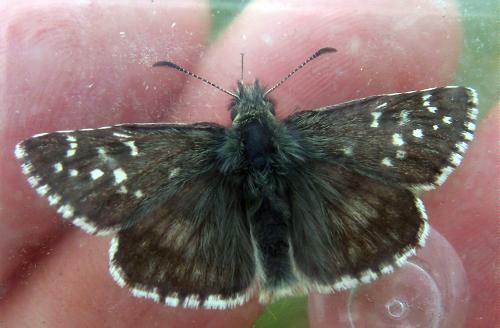 Here is an upperside, showing lovely bluish reflections - all the common brassy ringlets were freshly minted! 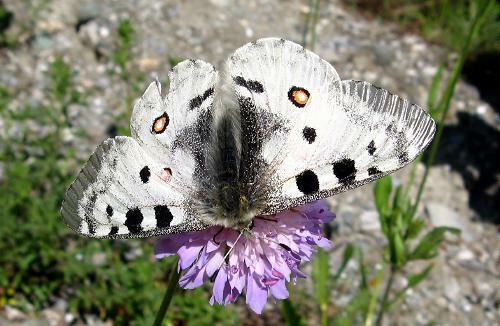 It was good to see this Apollo on my local mountain, and I saw another one, rather tattier, a little later. More exciting than that was a Camberwell beauty that gave me a most impressive fly-past. 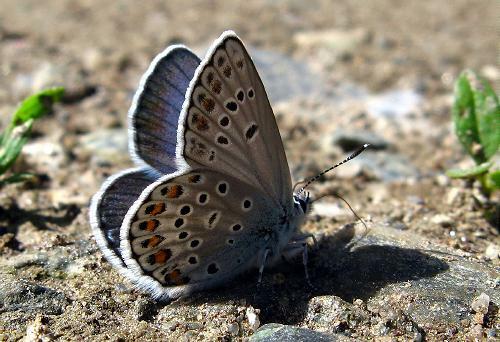 This is not normally a local butterfly and I imagine it was in dispersal phase, after the incredibly good showing this species put on in the valley this year. 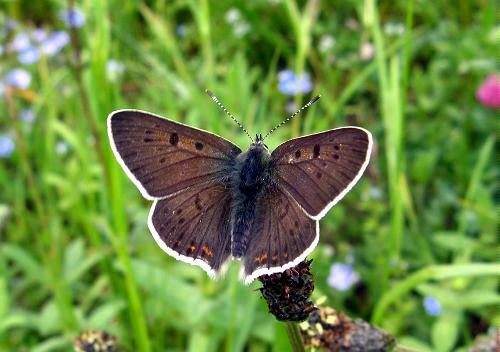 Chalkhill blues were common, interspersed with a few northern brown arguses, and the first Damon blues of the season were flying with them. 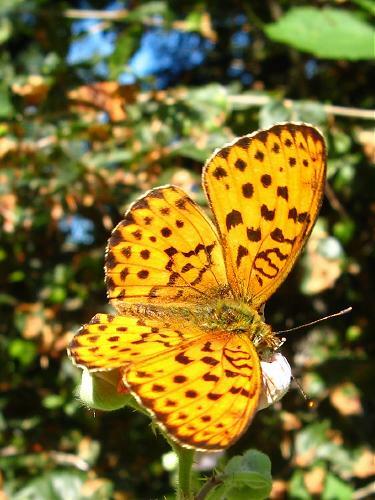 There were quite a few Titania's fritillaries - here is an underside. Finally, this painted lady was apparently clinging on for dear life, but apparently also enjoying his or her last days of existence. 31st: It appears Asha is very seriously ill - terminally ill - and can no longer travel or go for walks. She has spent the last two nights in hospital in Bern and came home today. 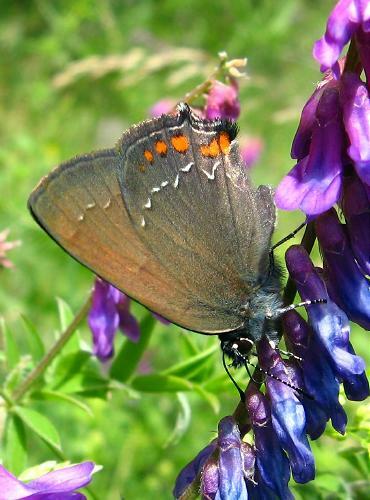 I will continue this journal with occasional notes on the local butterflies and may zoom down to the valley for an afternoon without her if she stabilises. 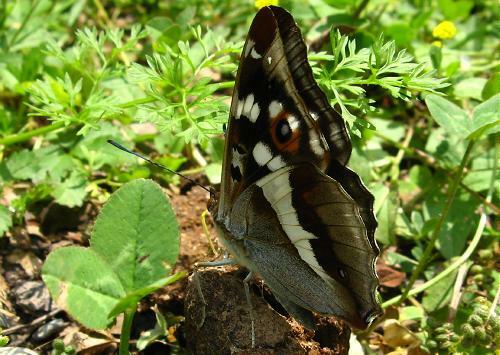 2nd: In the early afternoon I looked out of the window and saw a huge admiral/emperor heading through my garden, towards the house. I ran onto the balcony, to see it wheel away from me, flashing an orange underside, then it flew over into the neighbouring property and landed some way away on a tree. I ran in to get my binoculars, but it had gone when I got out again. 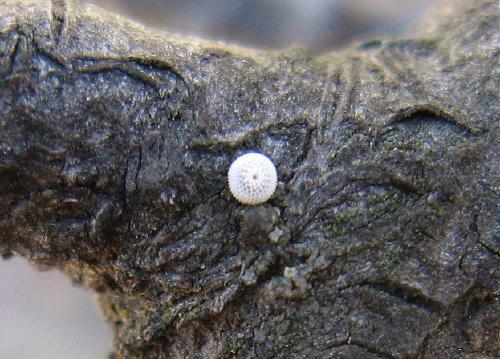 I have no doubt in my own mind it was a female poplar admiral. The size, flight pattern, visible white bands in flight and orange underside pretty much rule out anything else. 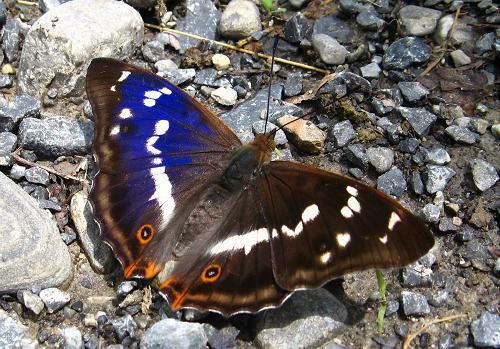 The sighting was so fleeting I am not officially recording it, but the only possible alternative is purple emperor and I've never seen one of these show orange in flight. 13th: Asha was put to sleep today. 14th: I cycled down to Ollon to return some medical materials to the vet, and then pedalled on to some local sites before catching the tram back up to Villars. 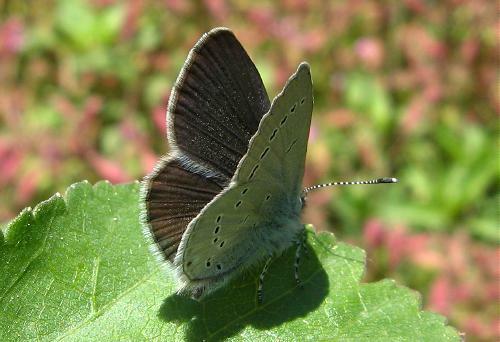 Short-tailed blues were flying at two different sites in reasonable numbers - at least half a dozen at one site and more at the other, males and females, some in poor condition. 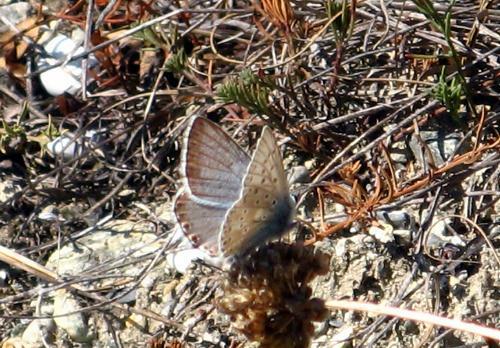 There were also some Provençal short-tailed blues at one site, generally flying close to the more bushy edges of the field. 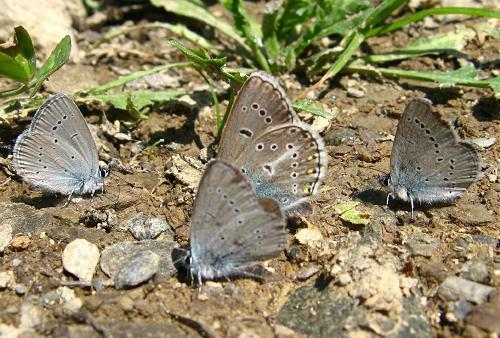 I saw at least ten long-tailed blues too. 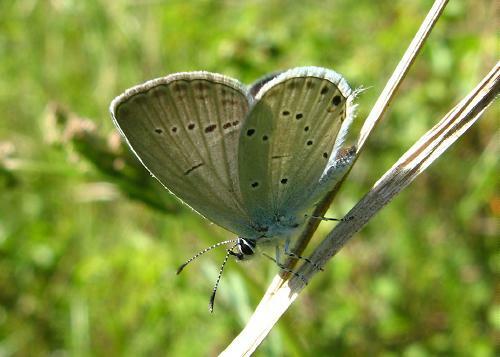 Males were busy defending territories, but they very rarely stayed put more than a few seconds before zooming off to attack another long-tailed blue, when the two of them would spiral rapidly up into the sky. 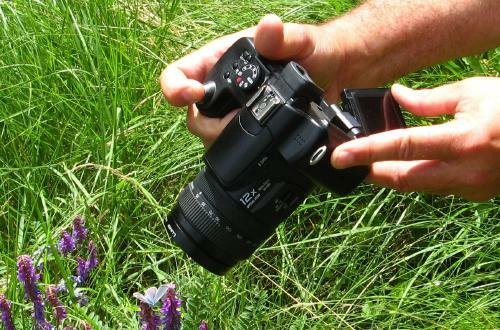 Photography was very difficult. 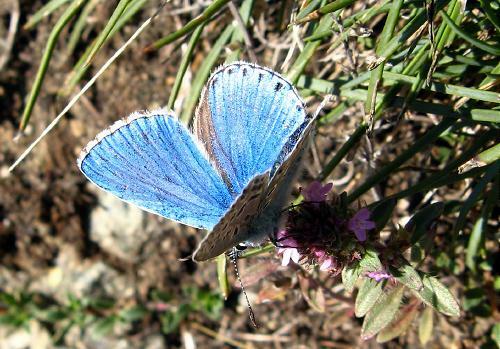 Other blues flying were little blue, common blue, mazarine blue and Adonis blue. 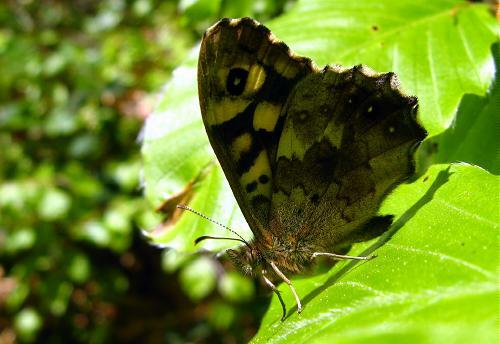 There were plenty of dryads and meadow browns, small heaths, speckled woods, painted ladies, walls, ringlets, swallowtails, scarce swallowtails, clouded yellows and whites. 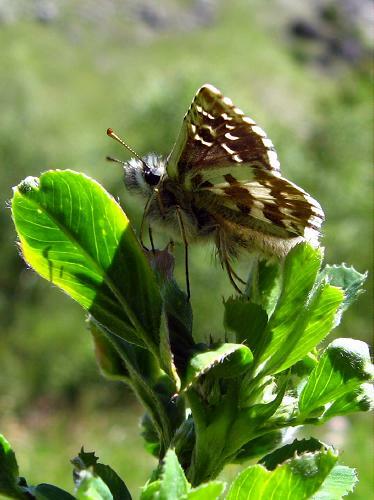 15th: Went to France in the morning with Matt, to find cinqfoil skippers. 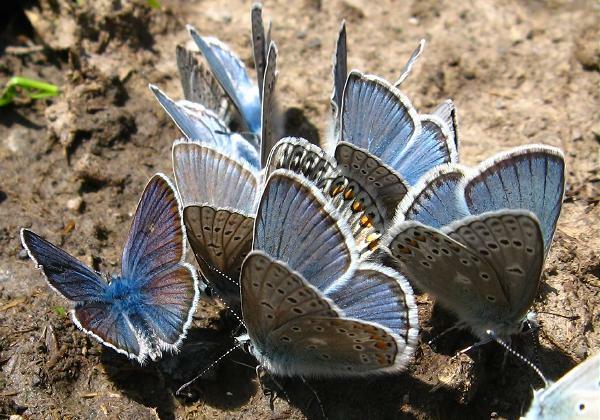 We found these, at a known site, where Oberthür's grizzled skippers are also known to fly. 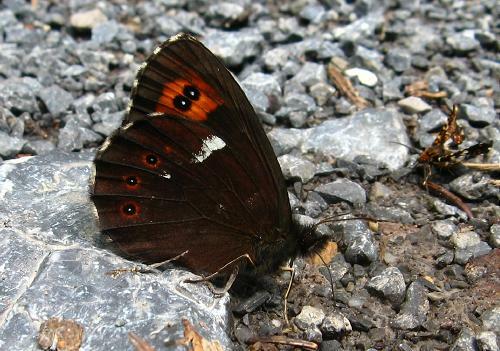 We thought we found an Oberthür's grizzly, but in the end we were not sure - here is an upperside of the butterfly. 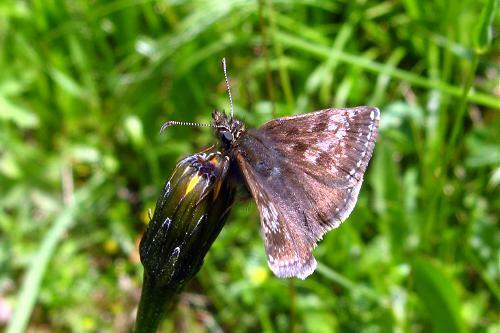 But there was no doubt about the cinqfoil skippers, which were flying in plenty. 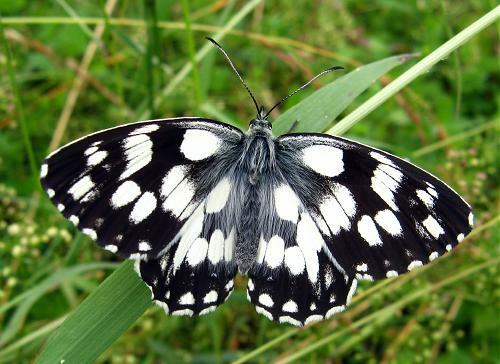 They looked large in flight, and rather black and white, with bold, square markings. 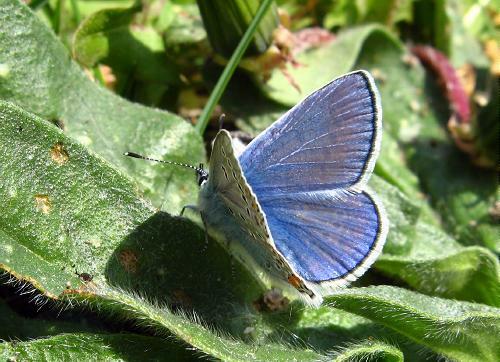 At the same site were a fair number of gatekeepers, as well as meadow browns, small heaths, large skippers and several other species of blue including chalk-hill, Provençal short-tailed blue, short-tailed blue and common blue. 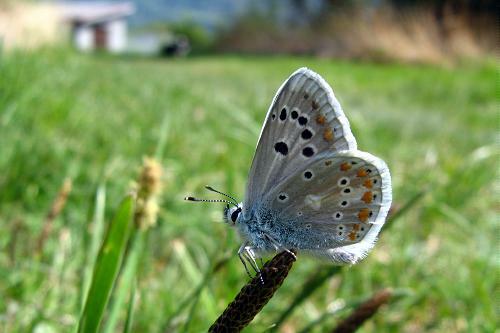 We moved on to another site, in Switzerland, where alcon blues have flown in the past. 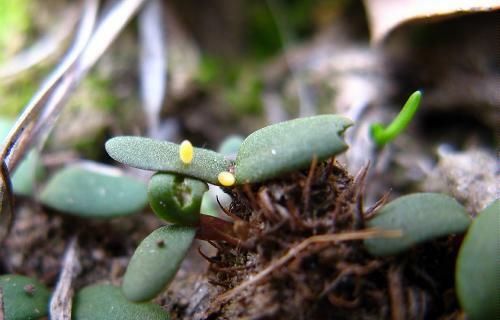 However, despite finding the foodplant we found no eggs at all, suggesting this small colony has become extinct. 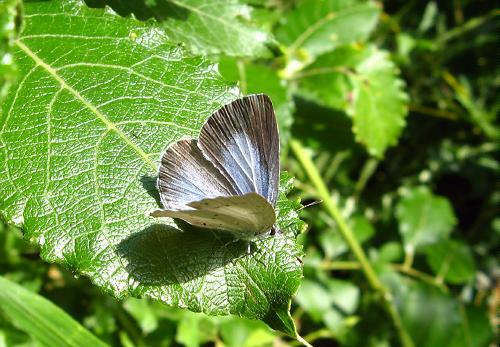 We did see short-tailed blue there, and this holly blue, but little else of note. 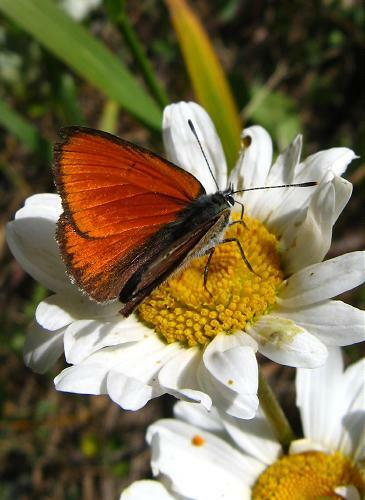 In the afternoon I continued alone to Martigny to check out some local brown hairstreak sites. None were flying, but this might have been due to the quite strong wind. 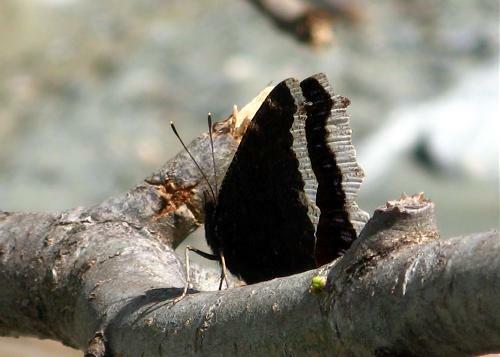 No tree grayling were flying yet either, at a site where these are very common - this is an extremely late butterfly! APOLOGIES to everyone following this journal. Although I did go out a few times in the rest of August and September, I was greatly affected by the death of my dog and I have not been able to keep this up to date. I won't try to catch up what I missed except to note that tree graylings emerged relatively late - I saw my first on 21st August - and a visit to Suffolk at the end of August gave me graylings, a species I haven't otherwise seen this year. 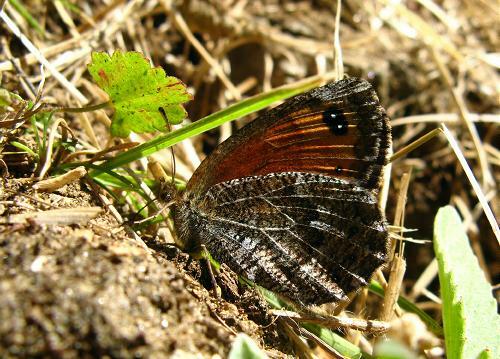 26th: I headed to the Valley, hoping to pick up a brown hairstreak before it got too late. I was unsuccessful in this. The season does seem to be winding down and most species were looking rather weary. 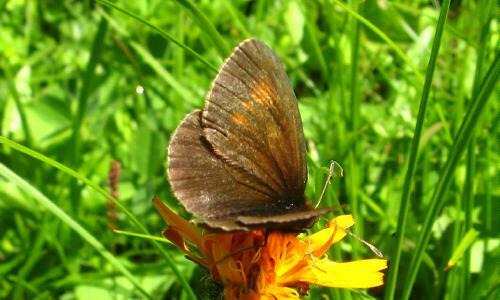 The exceptions were clouded yellow, Queen of Spain and tree grayling (that individual is not so fresh, but there were plenty of fresh ones about). 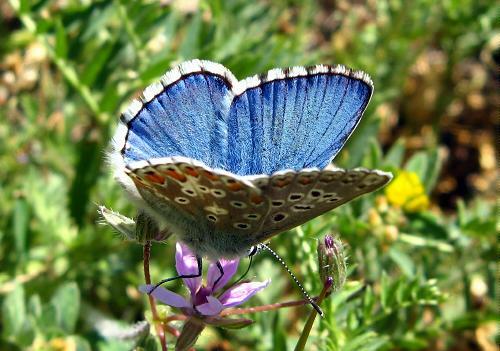 Blues on the wing were Adonis, common and Chapman's. Small and southern small whites were flying in good numbers and there were plenty of Berger's pale clouded yellows around. 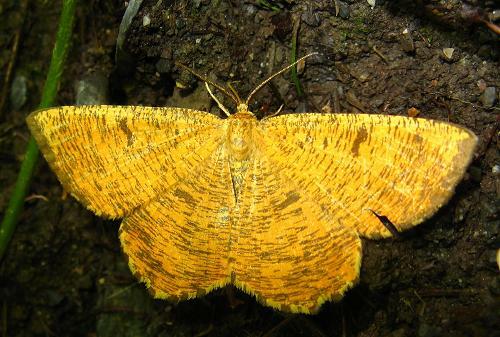 This is a female clouded yellow, form helice. 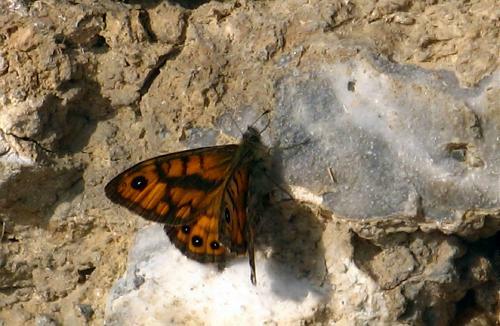 Wall browns and large walls were both common, and at one site there were probably two (maybe one) marbled ringlets, the only Erebia I saw. 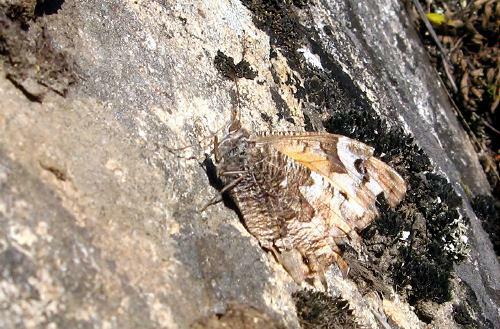 Painted ladies were mostly very tatty but there were fresh red admirals cruising around everywhere. No small tortoiseshells - these are all in hibernation, I presume. One or two peacocks. 4th: A warm, sunny day, after a short run of warm sunny days. 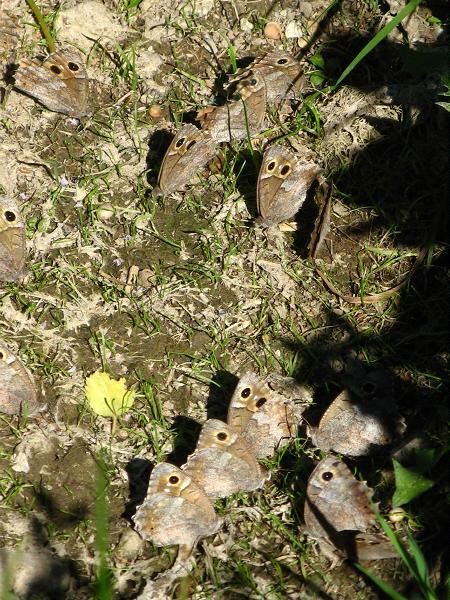 In the Rhône Valley, tree graylings were flying in amazing numbers. 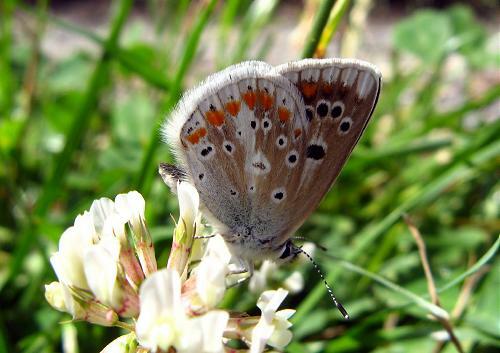 Here is a group of them taking minerals in a little ditch, and here is one nectaring with a brown argus. 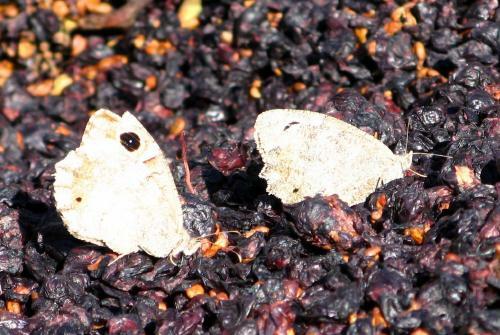 At one point they were enjoying fermenting grapes (and here), left lying to rot in great piles. 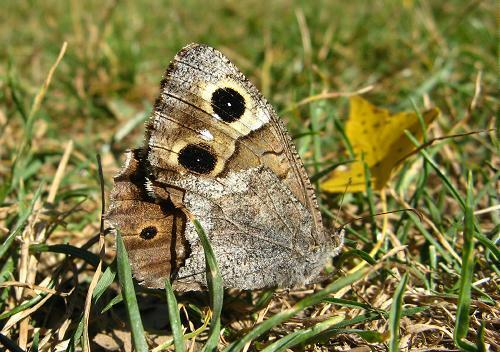 Graylings (H. semele) were flying too, but in smaller numbers. Here is another. 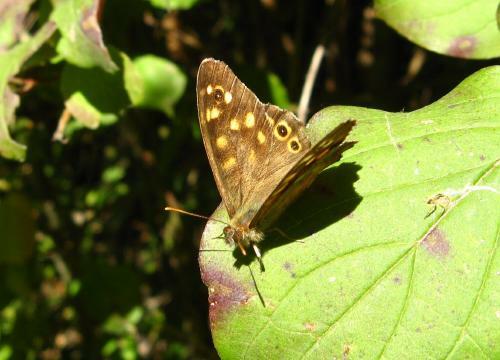 Wall browns were quite common and speckled woods rather more locally so. 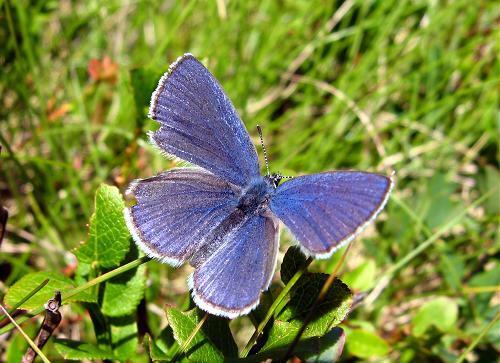 There were no skippers on the wing but plenty of blues, including common blue, Chapman's blue, Adonis blue (here is a female) and some rather late chalkhill blues. 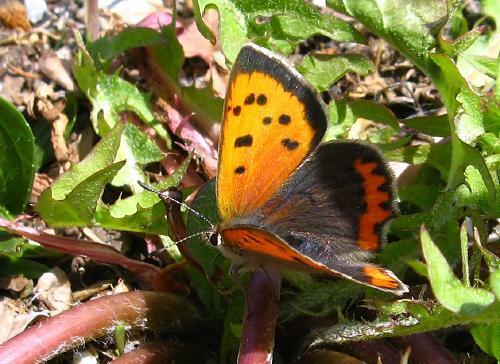 This small copper was one of probably three or four I saw. 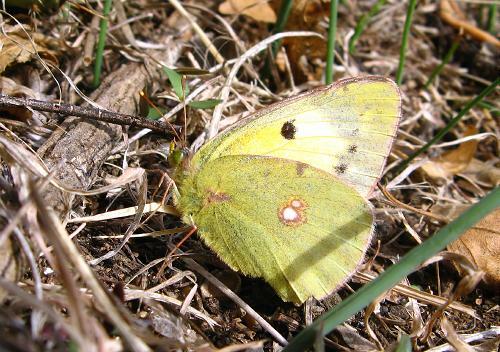 Clouded yellows were very frequent. This female, form helice took off just as I clicked the shutter, but that did produce a rare shot of her upperside. 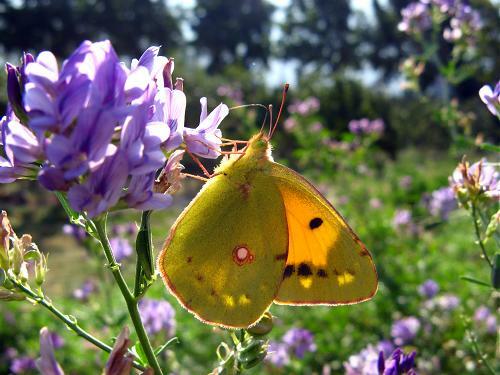 This is a female Berger's clouded yellow. 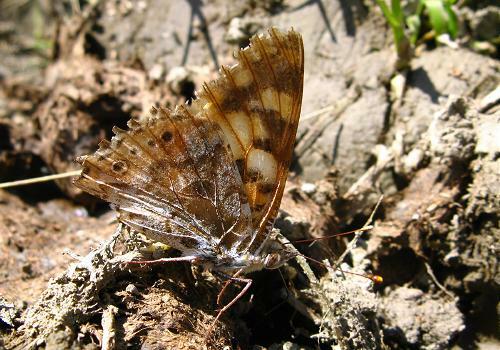 Also flying were large whites, small whites, red admirals and painted ladies, these last looking very worn indeed. 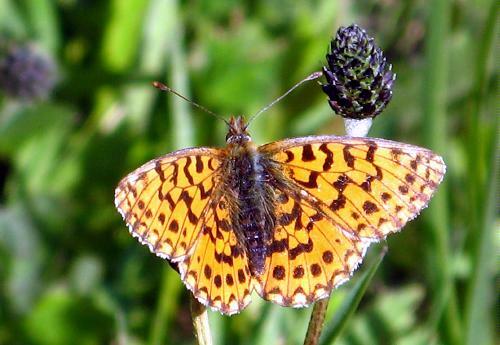 The only fritillaries were Queen of Spain, which were rather common. 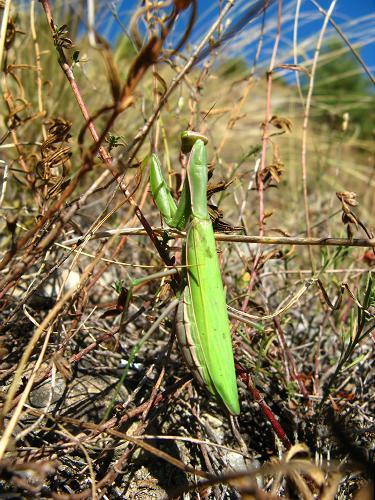 Finally, here is a conspicuously pregnant praying mantis! 5th: The good weather continued but today I went up the mountain instead of down to the Valley. At altitude very little was flying. 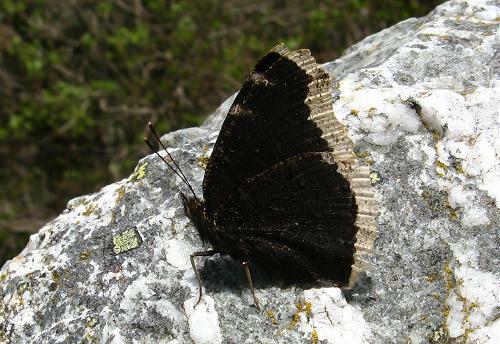 From the télécabine on the way up, red admirals were visible, mostly in the coniferous areas. 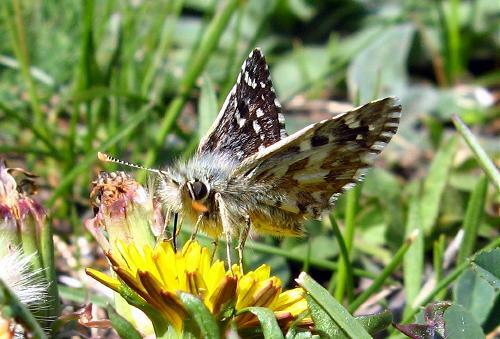 Over the grazing areas, clouded yellows and Berger's pale clouded yellows were still common, and a few painted ladies were about in all habitats. 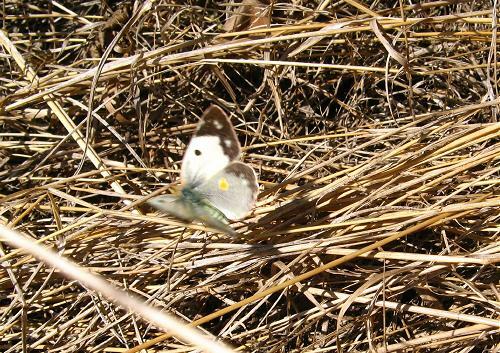 A very few small whites were visible too. 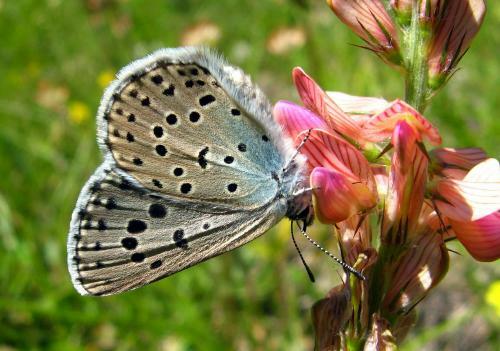 Apart from these, though, I saw no butterflies, and at the highest point I visited, about 2100m, there was nothing at all. 6th-16th: Very busy at school. 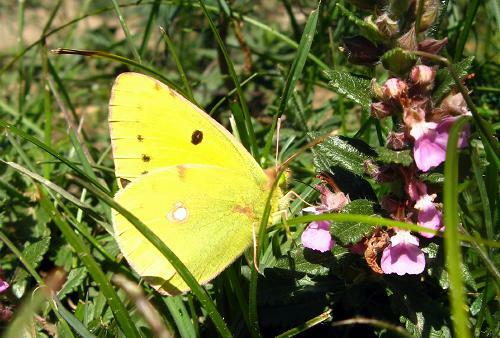 In sunny weather clouded yellows have been the most prominent butterfly, with a pale clouded yellow near Huémoz on 16th. 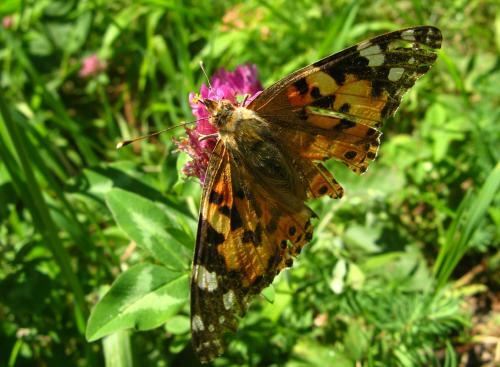 Red admirals are increasingly less evident and painted ladies very scarce. 17th: Snow fell today. 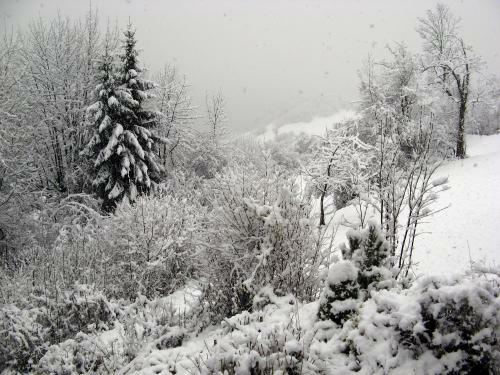 It didn't settle at my altitude but did leave a dusting on the rooves and trees at the altitude of Villars. 18th: Very cold, but bright. In the afternoon I visited my local woods to see what was flying. The answer: almost nothing. 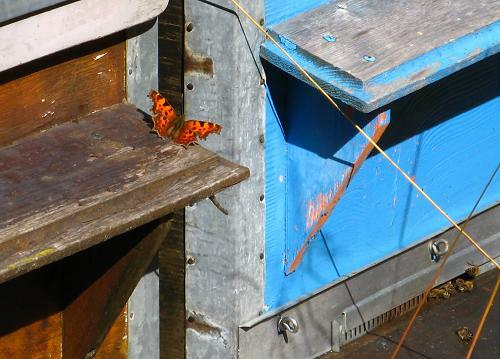 A few red admirals were cruising around and a single very tatty painted, but most interesting was this comma, who was particularly interested in feeding at these beehives, quite unpeturbed by the bees. Here is a video of him (or her). 19th: A trip to the Rhône Valley. 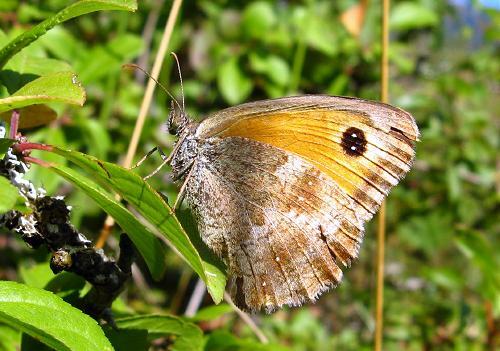 There seem to be nine species still flying: Queen of Spain (probably the commonest butterfly today), clouded yellow (nearly as common - here is an egg, laid by this female), Berger's pale clouded yellow (not common, but I saw at least half a dozen), wall brown (plenty around still), tree grayling (not common, but still present), grayling (just this one, looking rather old and worn! 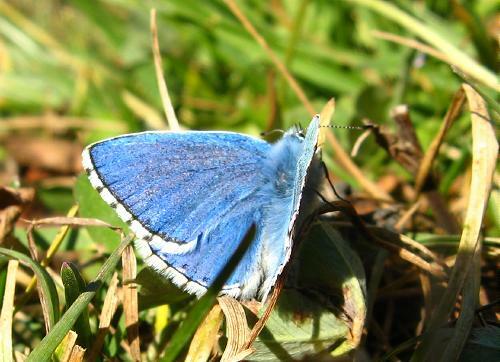 ), Adonis blue (I only saw males), painted lady (several) and red admiral (still quite a few around). 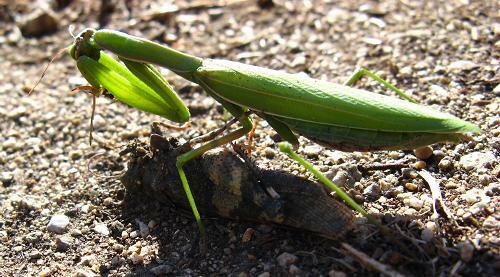 This mantis was guarding its grasshopper fiercely!! Here is another view. 22nd: Quite bright in the afternoon. 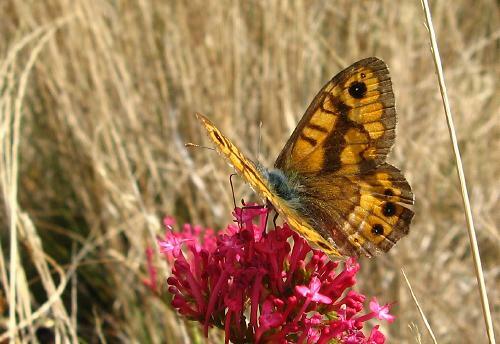 I visited a local site in the valley and found just two species on the wing: several red admirals and this one male wall brown. There were no painted ladies. 24th: After wind and rain yesterday, today was sunny and warm, with only a weak (warm) breeze. 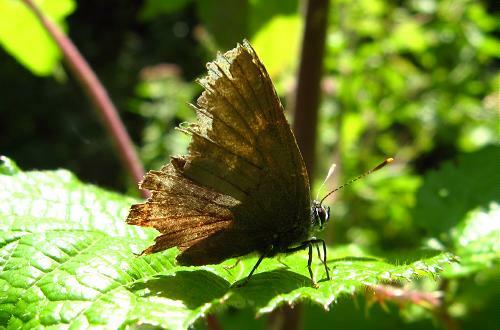 HOWEVER, for the first time since the spring, I went round my local walk in the sun without seeing a single butterfly. 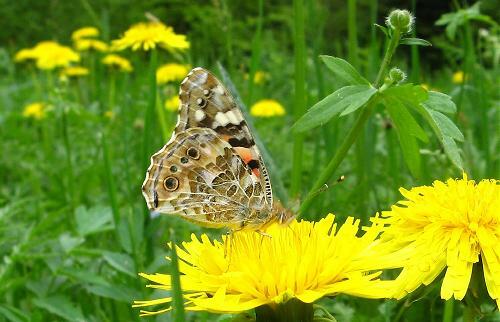 Not even a red admiral passed through, and there was no sign of painted ladies. 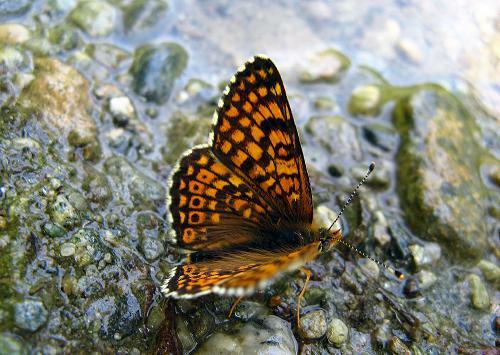 There may be a few more sightings up here in the weeks to come, and there will certainly be a few in the valley, but it does seem the season is now over. 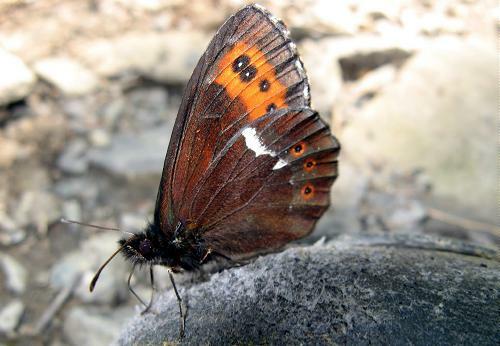 30th: Single red admiral seen in Villars. 31st: Cycled down to Ollon. It was noticeable that although it was a sunny, still day I felt quite cold cycling down the hill. Very locally, four species of butterfly were flying: 3 red admirals, 3 wall browns, two whites that I'm recording as small whites, though this male (and here) is a strong candidate for southern small white. I decided not to chase it for proof. 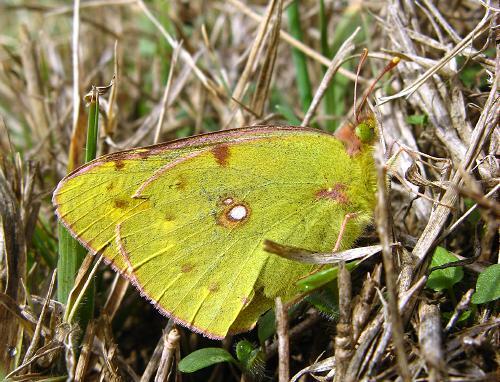 The fourth species was clouded yellow - again, locally common. 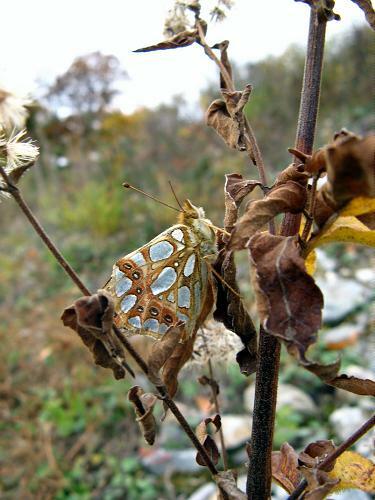 1st: With bad weather forecast from this evening and lasting the week, I headed along the Rhône Valley first thing in the morning to get some November butterflies. I was not disappointed - 9 species were still flying. 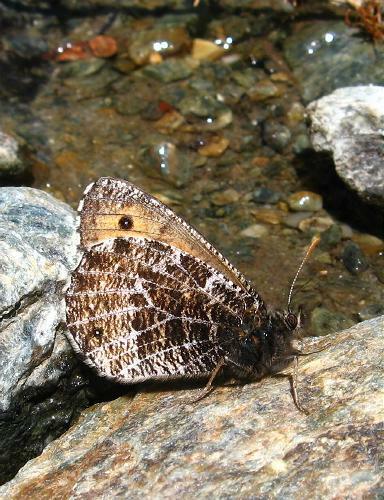 Most interesting was this grayling (and here) - very late indeed for this species. 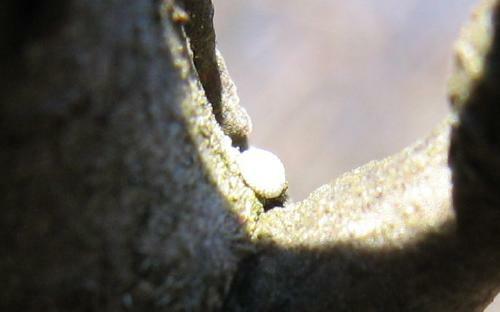 There were a handful of tree graylings too, but these are clearly nearly over now. 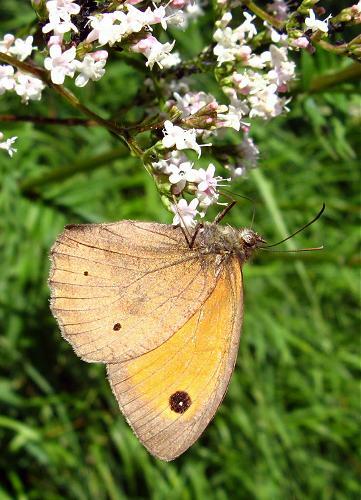 Wall browns were the commonest butterflies (here is a female), closely followed by clouded yellows. 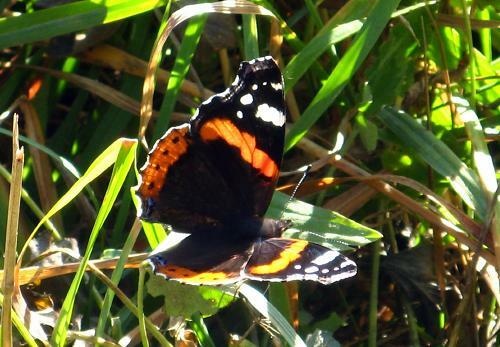 A few Queens of Spain were flying - I probably saw half a dozen - and a few red admirals. 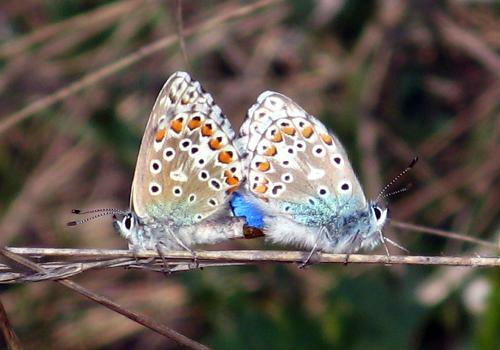 Here and here are the only two Adonis blues I saw (assuming this one that already gone to roost by 1.30pm was one of the two males I had seen in the same place in the morning). This female Berger's clouded yellow put in an appearance just before I caught the train home. The only species I saw but couldn't get even a record shot of was a single peacock that passed through without stopping. 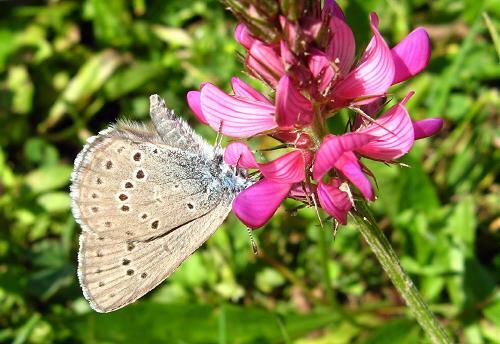 It was striking that there were very few nectar plants around. 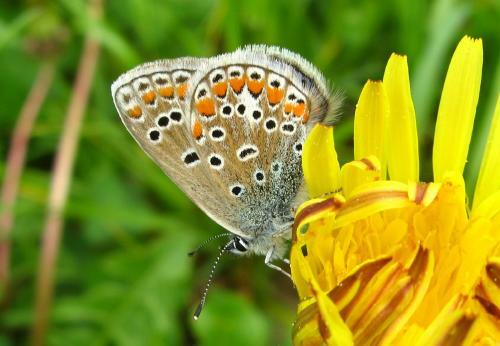 The walls were happy with the odd dandelion (these were very sparse on the turf) and the clouded yellows were flitting from clover to clover. But after the initial warm-up period between 10am and midday I actually saw very little because everything had gone off in search of flowers. 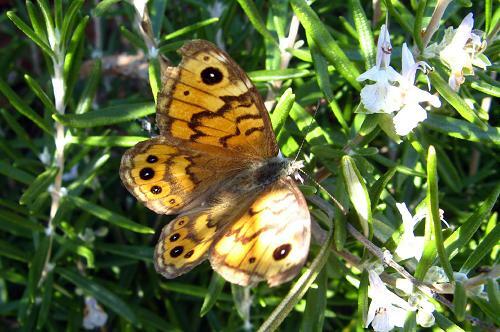 By about 2.00pm the butterflying was essentially over, because the day had become too cold anyway. 14th: The Föhn blew and it was warm in the morning. 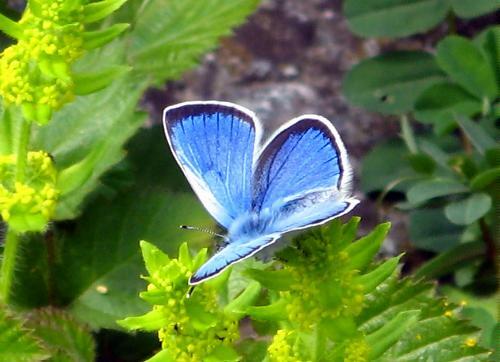 I reached the valley at 12.00pm and saw four species of butterfly in about an hour, before cloud and cold descended. 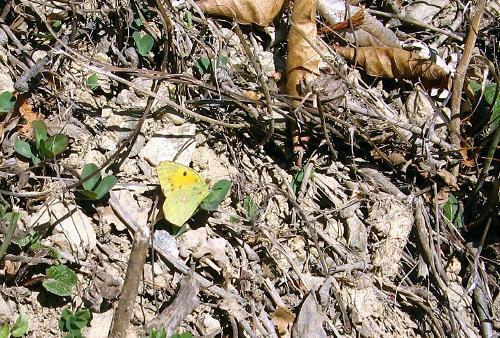 Mostly, the butterflies were clouded yellows (that's a male). 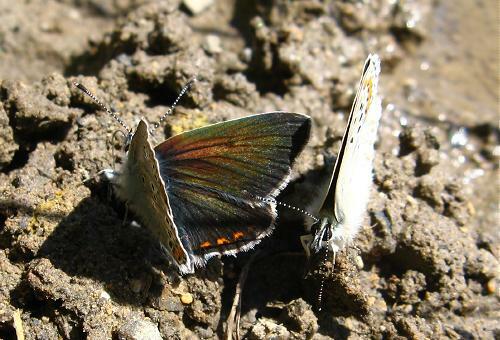 Here are here are two different helice females, and here is a normal female laying eggs. She appeared to be laying on bare ground but was in fact laying on tiny new cotyledons of some plant that I can't identify. Here are two eggs. 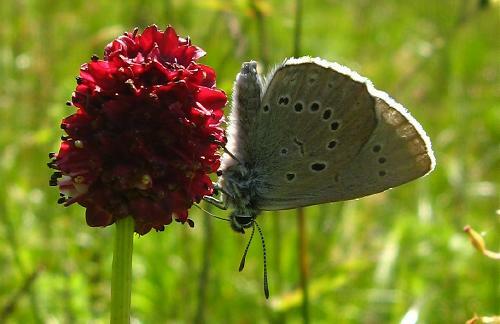 A single wall flew at about 12.30pm, enjoying scabious nectar (here is another picture of the same one) and I saw this single Queen of Spain later, after the clouds had come. 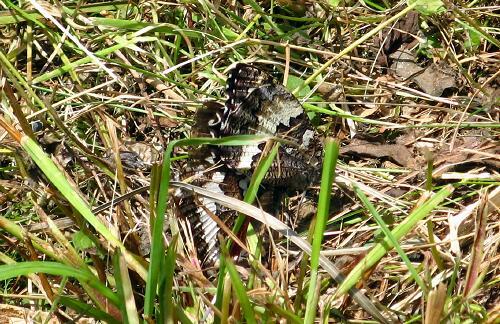 Here she (or he) is looking remarkably well camouflaged! I expect there were more Queens flying but I didn't get there early enough. 19th: A really hot day. At lunchtime I wandered around Villars in the sun and watched bees thronging ivy plants on south-facing walls. 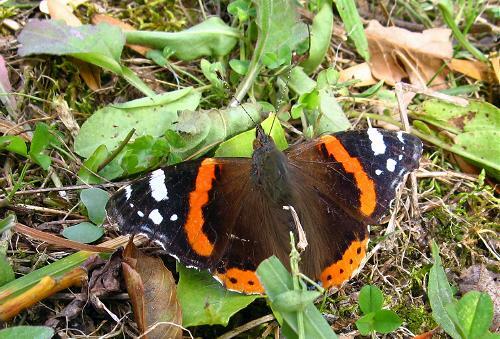 But no red admirals (which is what I had gone to the ivy plants to look for). 21st: Wall to wall sun in the valley was forecast, but in the end it was a hazy day and often overcast. Nevertheless, I found 4 species still flying. 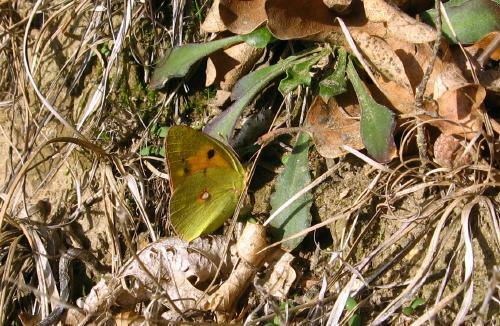 Clouded yellow was no surprise, and nor was Queen of Spain (I just got this one record shot from a great distance - I think this is one of my latest ever Queens) nor red admiral (a single individual flying near a town). 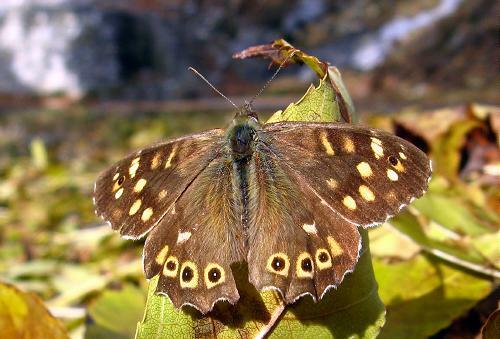 This speckled wood was a surprise though. It is a little damaged but otherwise looks quite fresh - incredible for 21st November. 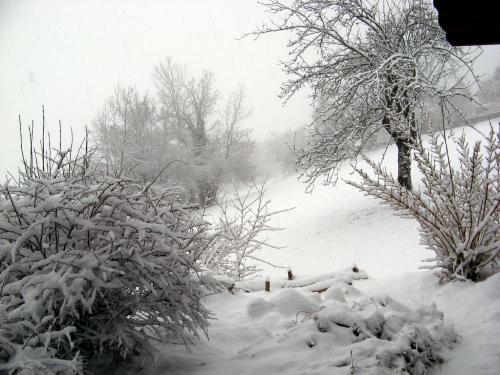 30th: After a week of generally bright weather (no butterflies), the snow has come.